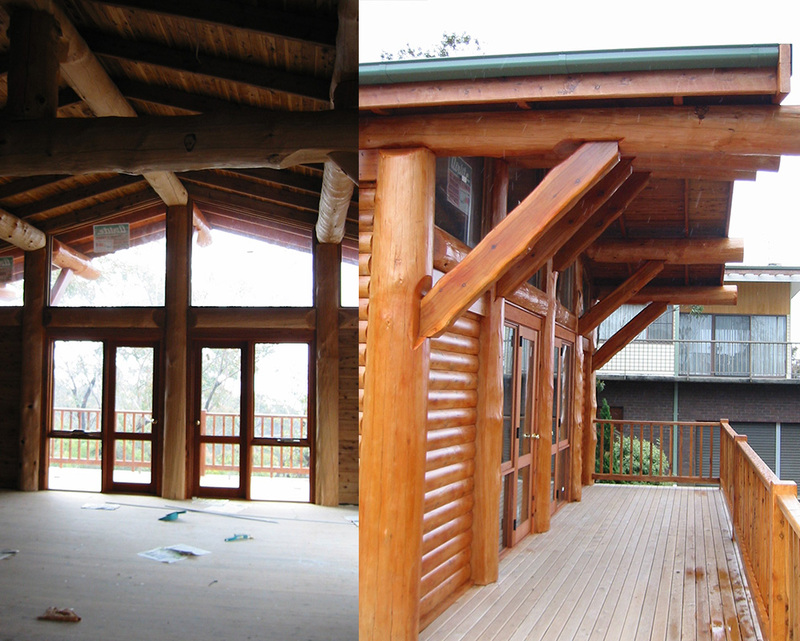 May we present some photos of our projects. 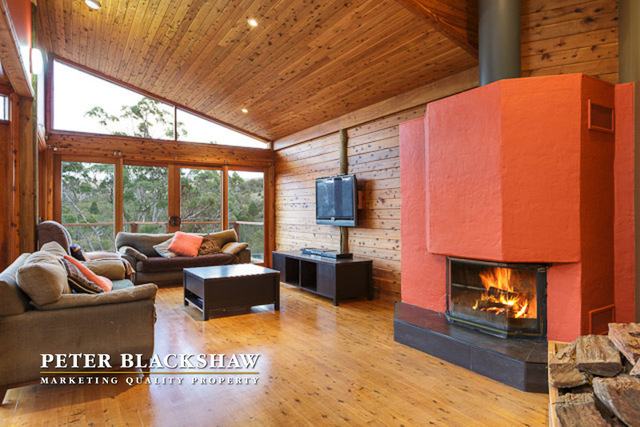 All standard floor plans can be found on our plans page – we have endless variations of these designs. 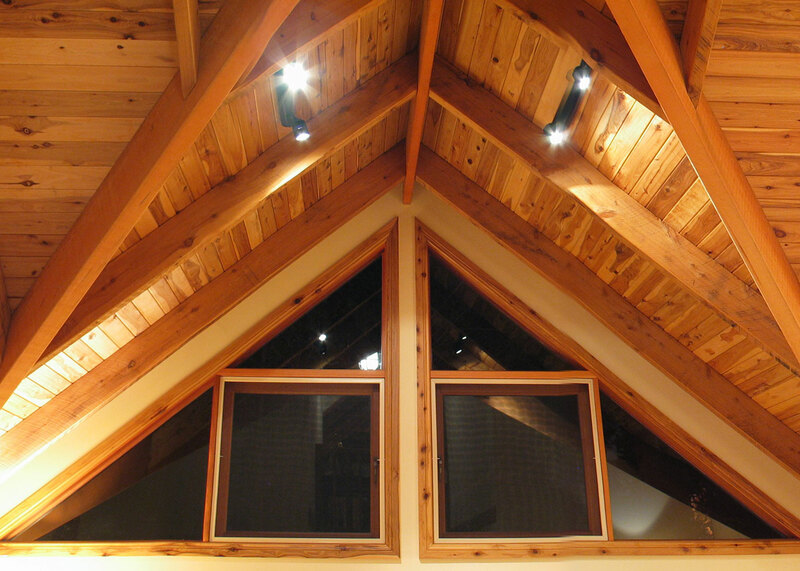 We can create your home based on any of these standard plans, any combination, or right from scratch. 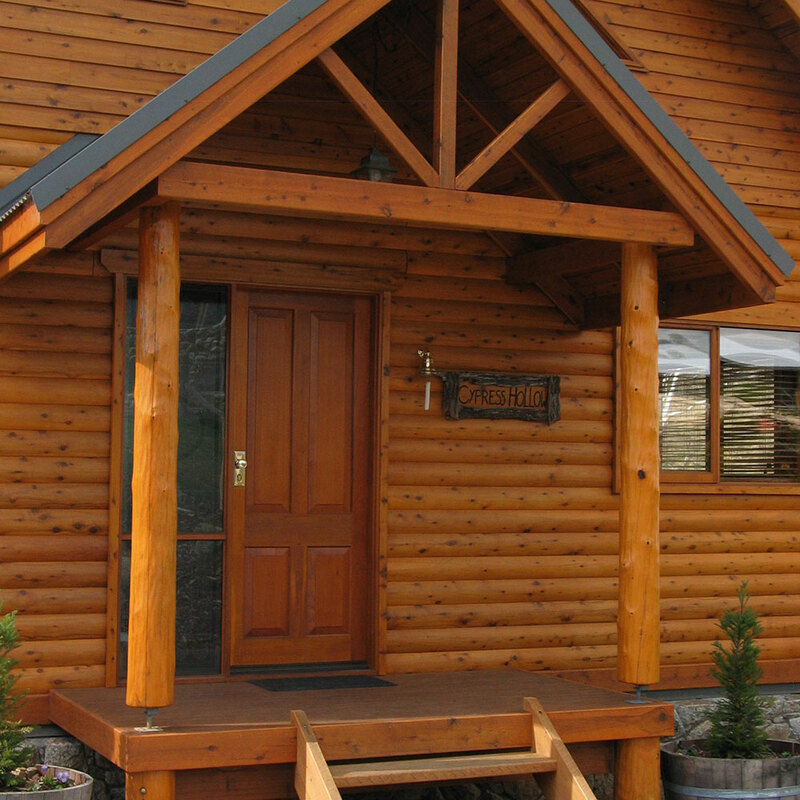 The Cassiar Peak II was our first show home. 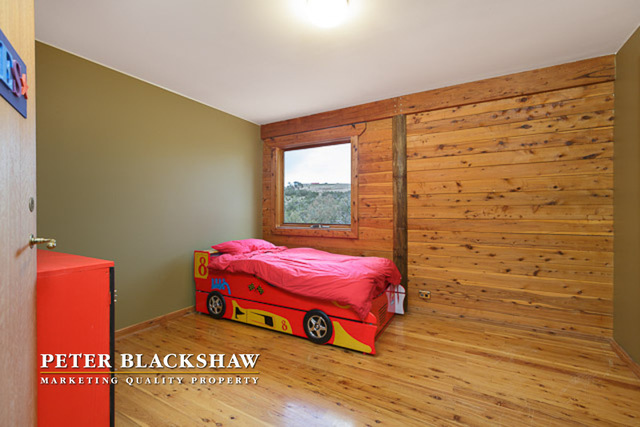 It is a comfortable three bedroom, deceptive in size, and has two living areas. 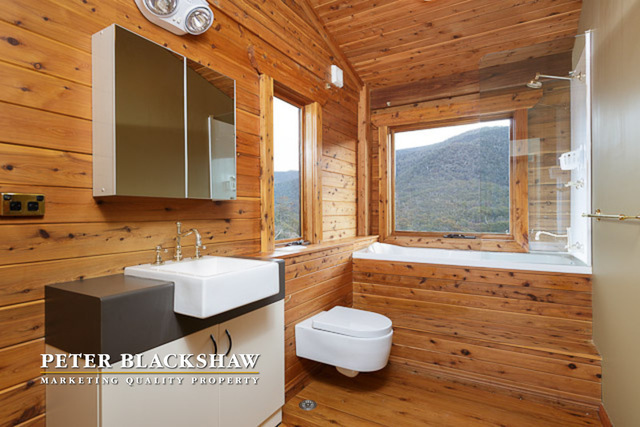 We have built many variations of this design, including ensuites upstairs, increasing and decreasing the size, side extensions etc. 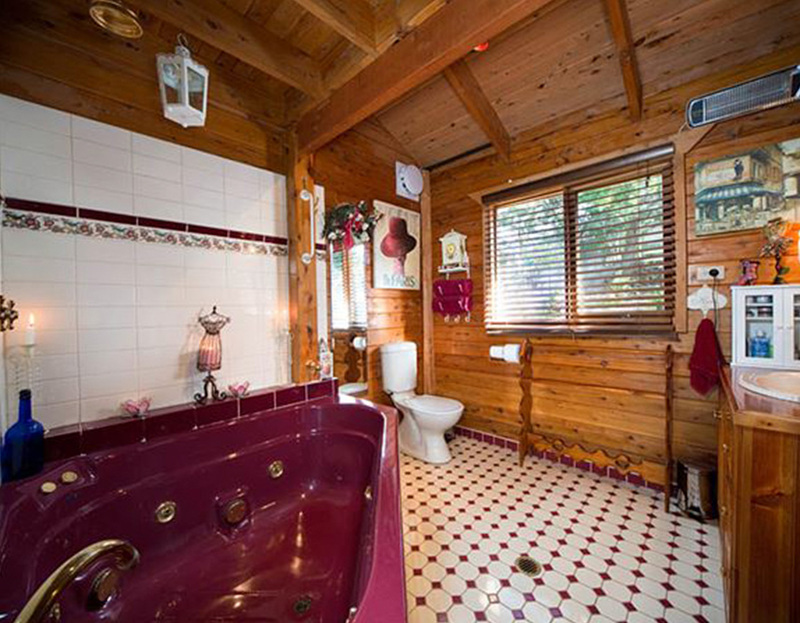 The combinations are endless. 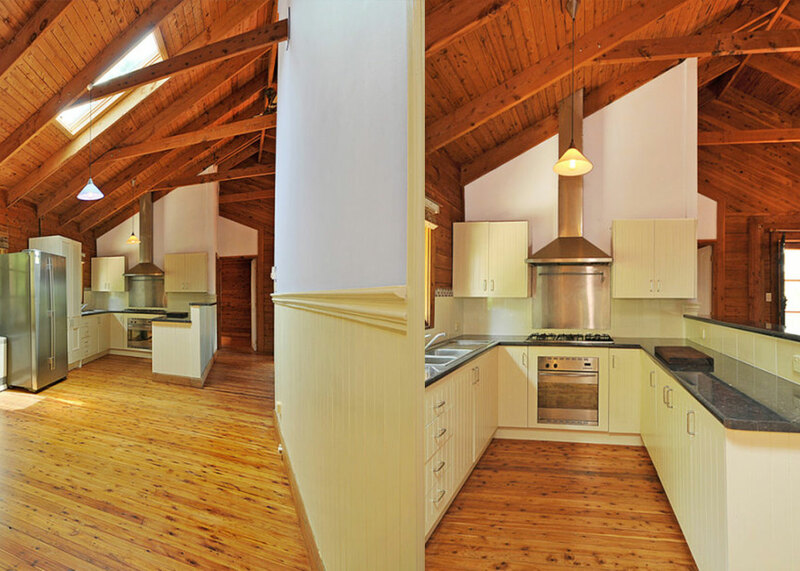 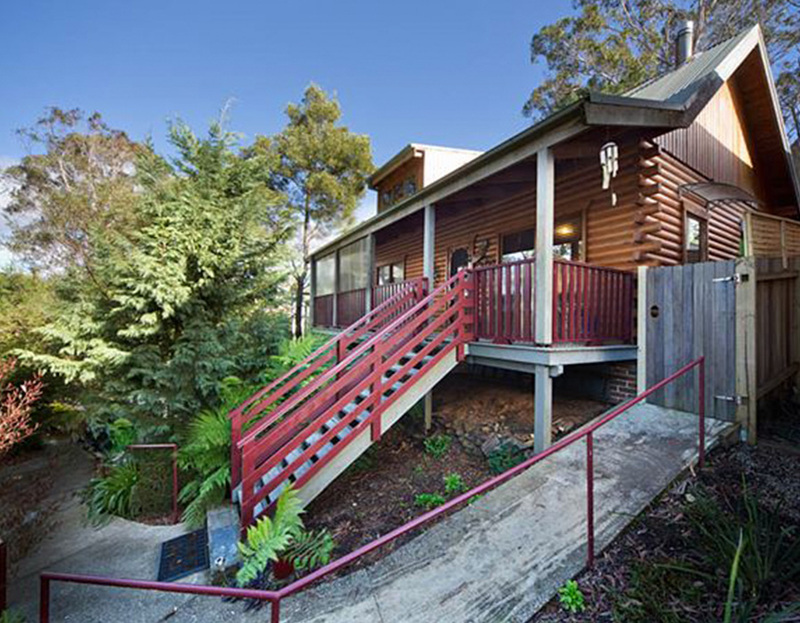 This home is 130 m2 of living space and 23 m2 of deck area with no space lost to hallways. 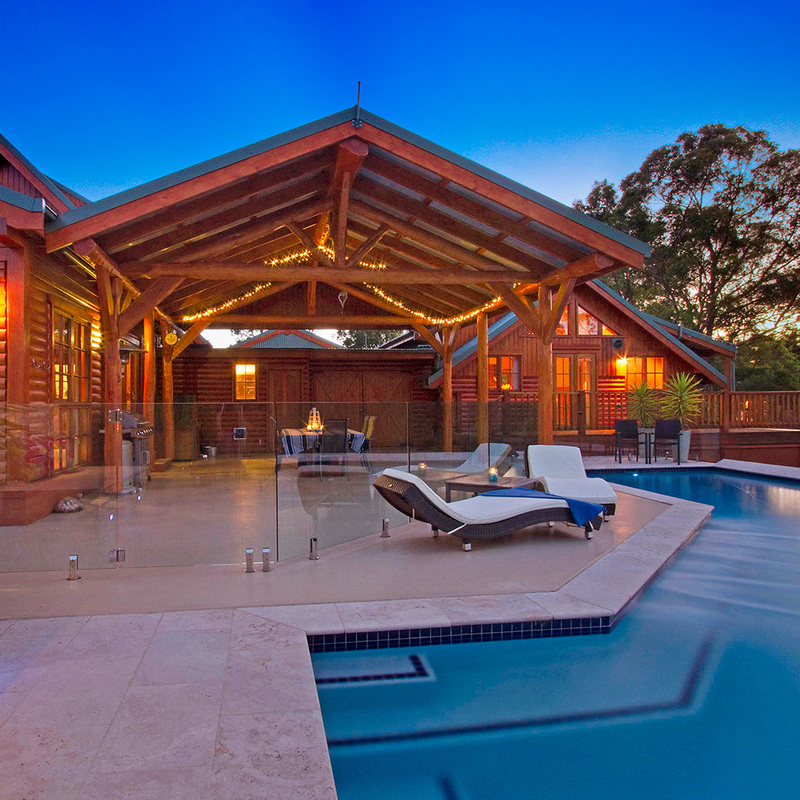 This is a wonderful Architect designed home. 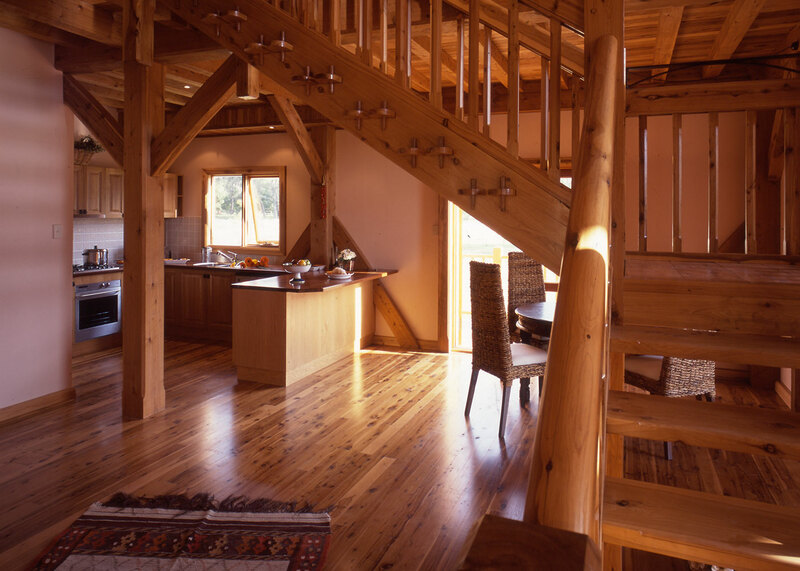 by David Epstein, which we supplied a rather tricky kit for to Michelago. 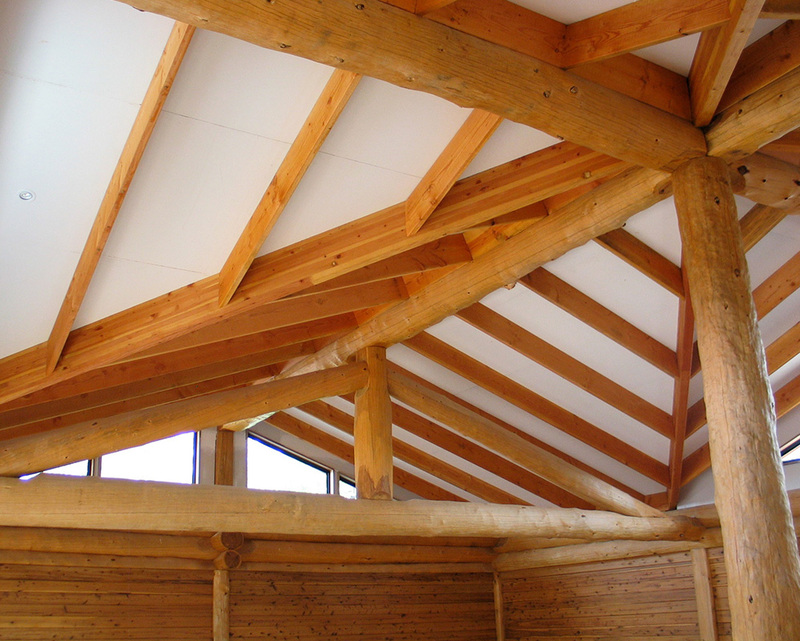 The system used a true pole hole system with our Engineered logs tenoned into the posts. 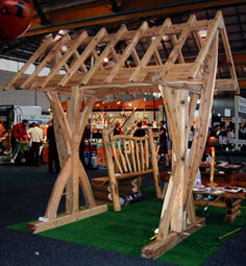 It goes to show you that where there is a will there is a way, although my draftsman almost resigned over the process to design the kit. 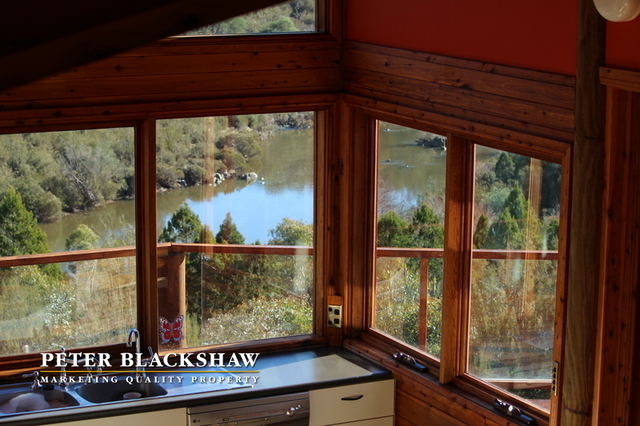 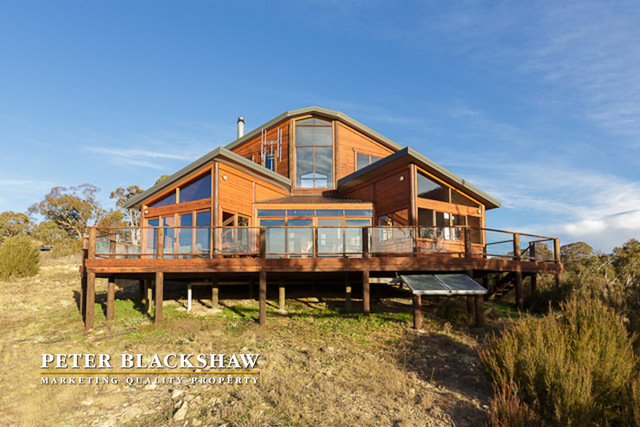 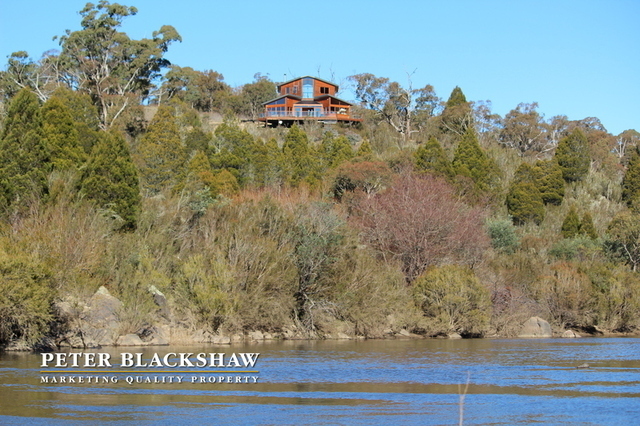 David kindly emailed me some photos to show off the final product, and it is a stunner of a house, especially with a magnificent view of the river through the house. 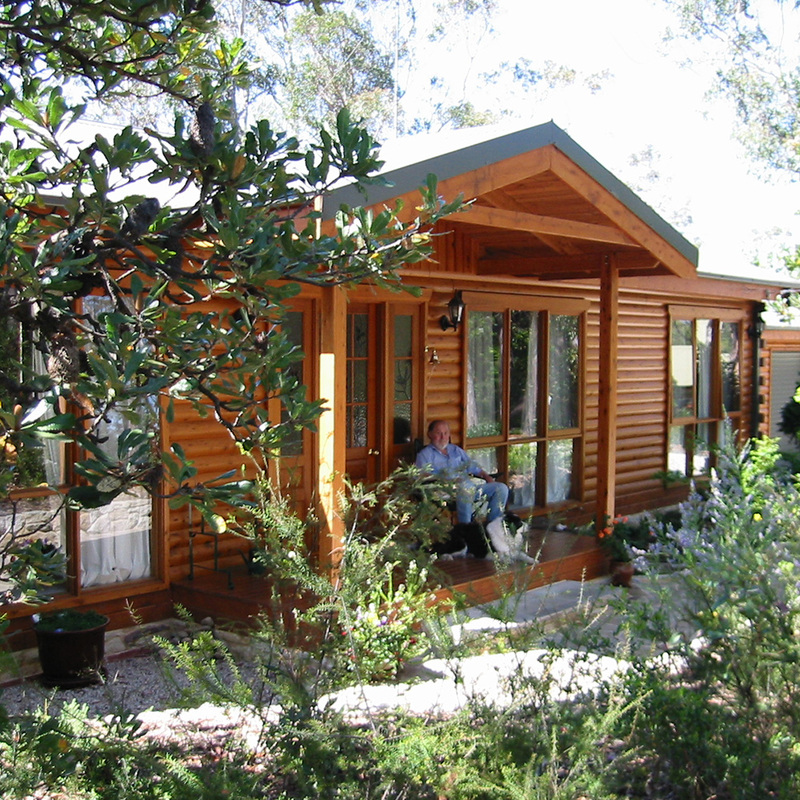 The Lilloet is single storey ranch style home perfect for retirement. 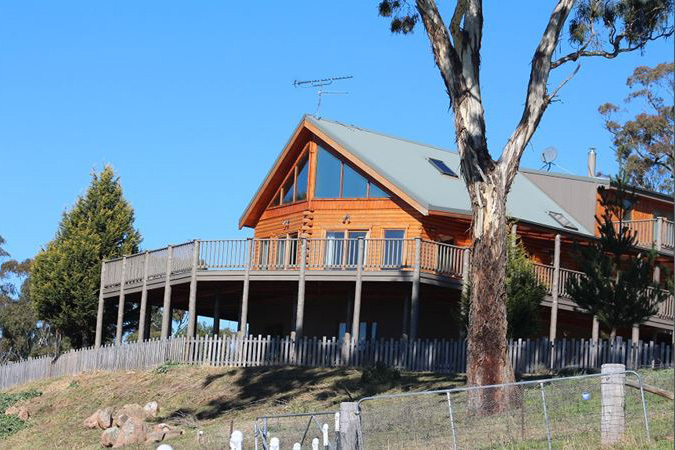 It has a den, living room, dining room, formal entry and three bedrooms not to mention a fantastic verandah across the back for outdoor living. 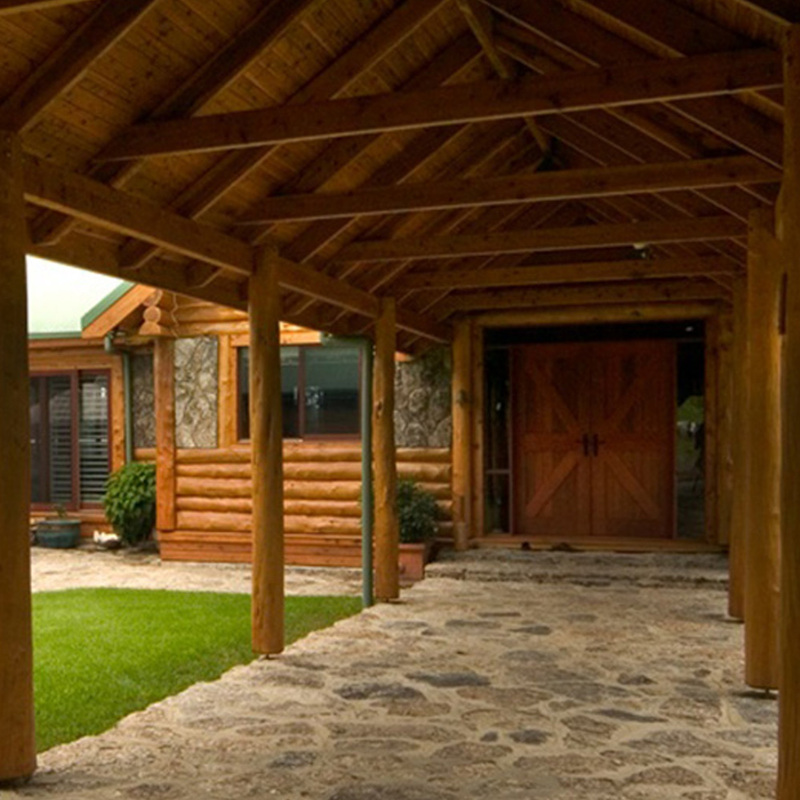 The formal entrance is covered with a porch, and there is a garage option alongside the house. 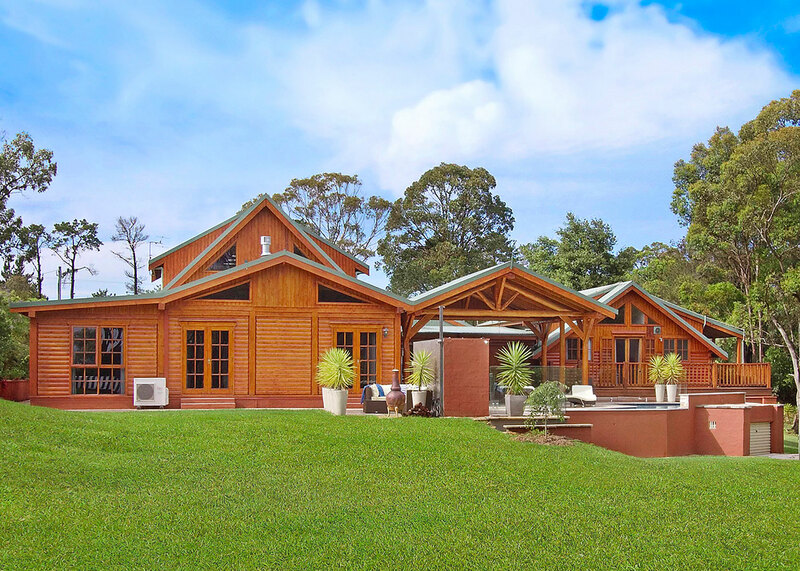 The living space is 170 m2, the decks and verandahs total a whopping 56m2 and the garage adds a further 36m2 totaling 260m2 of home. 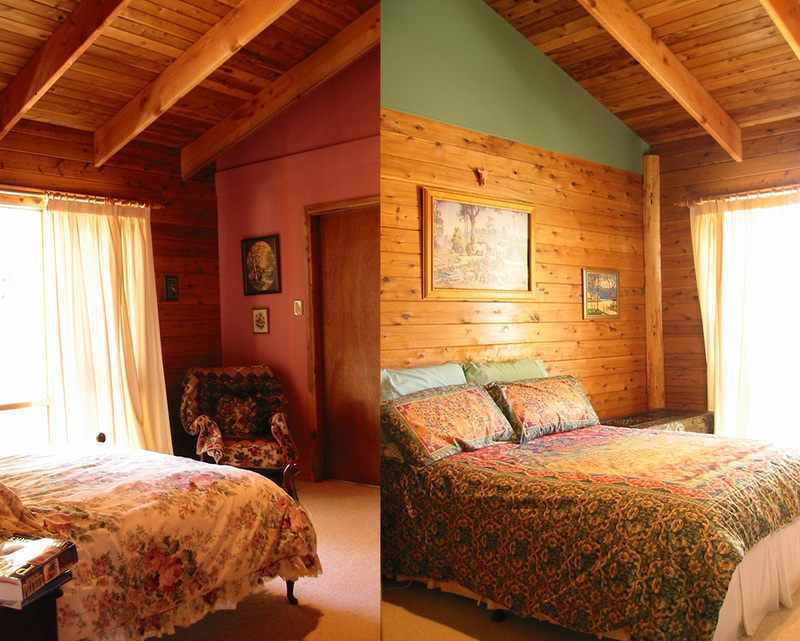 The Masset is a favourite retirement home, usually with two bedrooms, but the loft bedroom is easily divided into two to make it a three bedroom home. 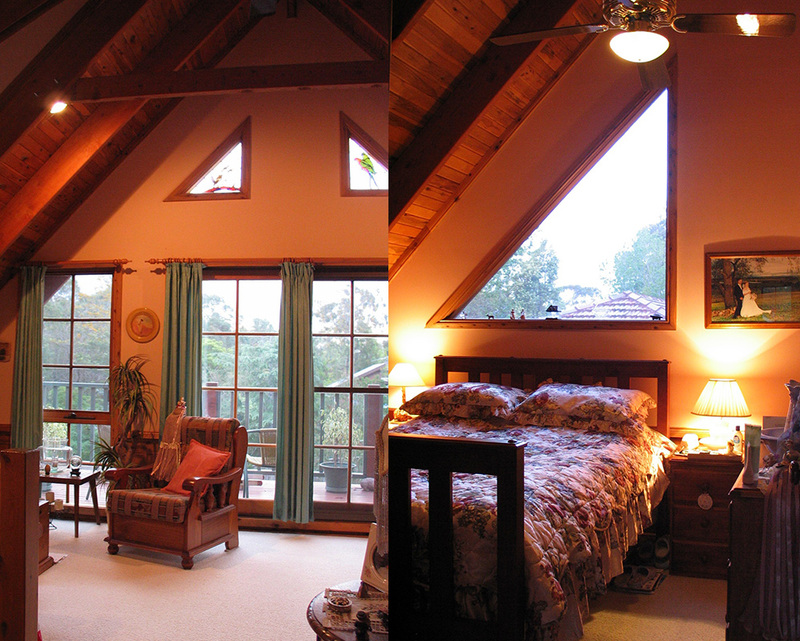 The loft bedroom is irresistable, and although usually intended for guests, tends to become the master bedroom in spite of the stairs! 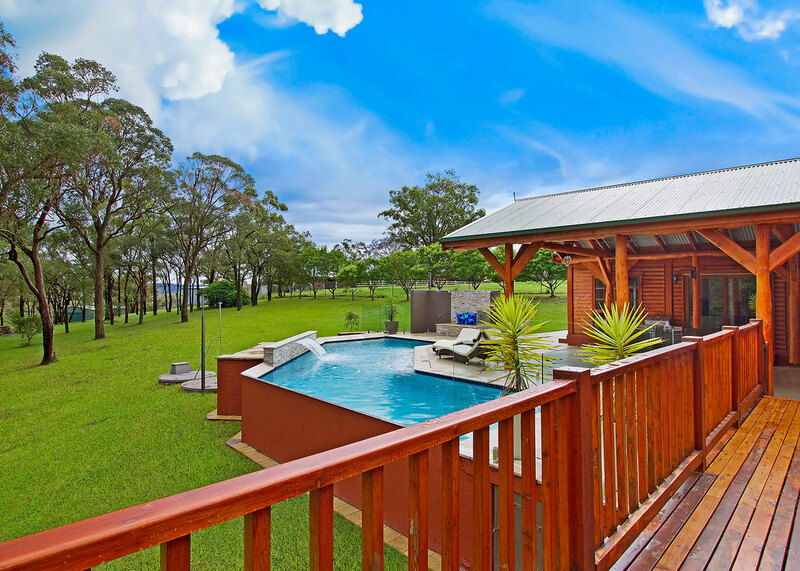 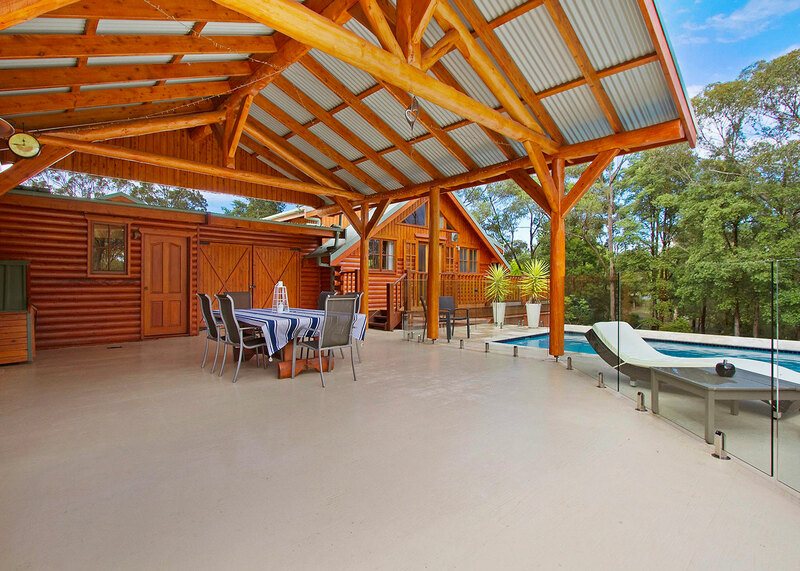 The living space is 110 m2 and verandahs and decks provide an additional 28 m2. 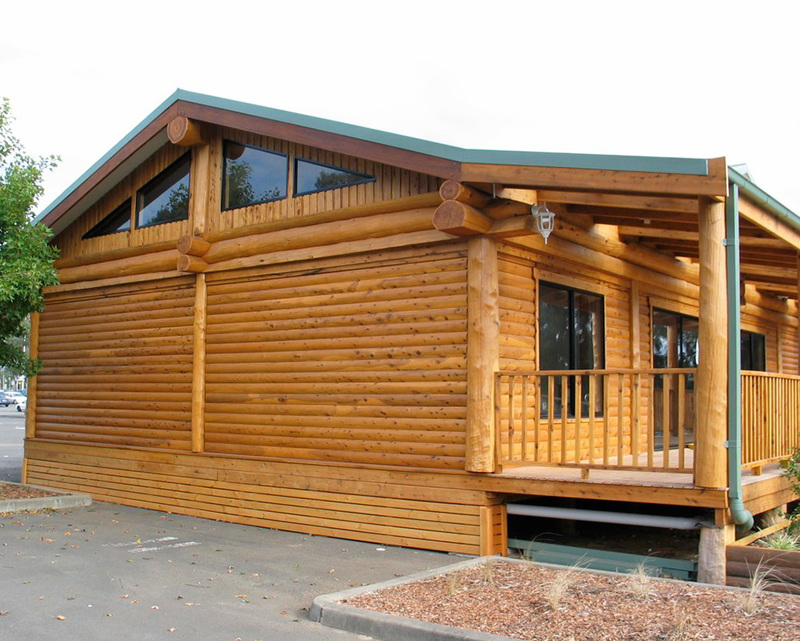 The Kootenay II is a favourite retirement home or weekender. 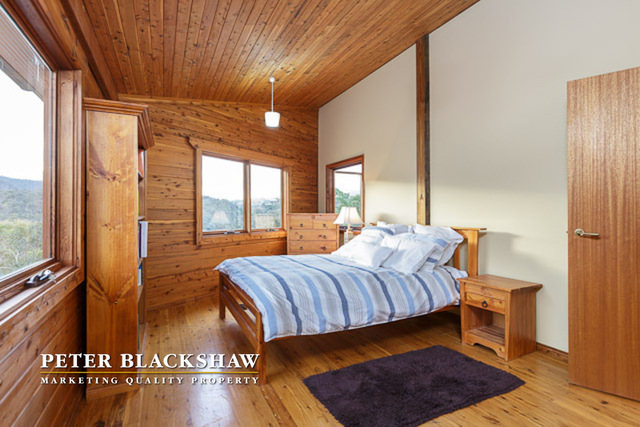 It has one generous size bedroom, and a large loft area that can be used as a master bedroom or for open plan sleeping quarters. 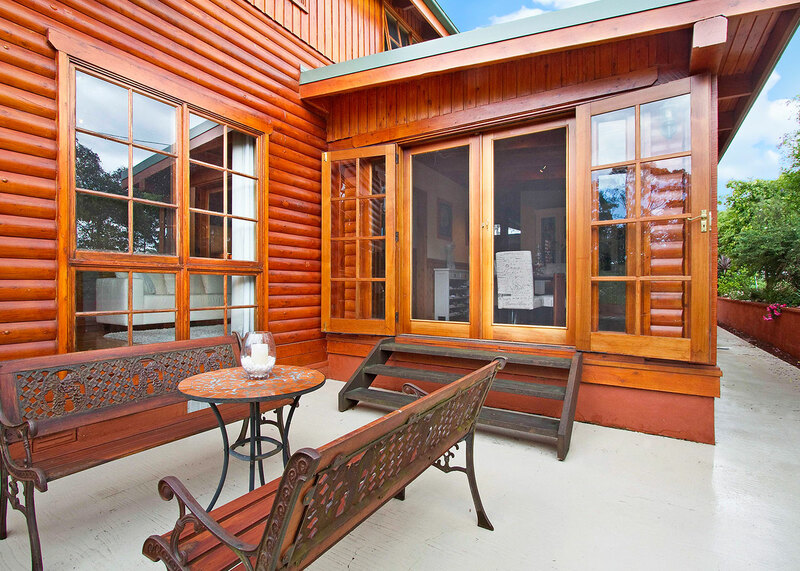 It has a very cosy atmosphere, and a fantastic verandah to watch the world go by from. 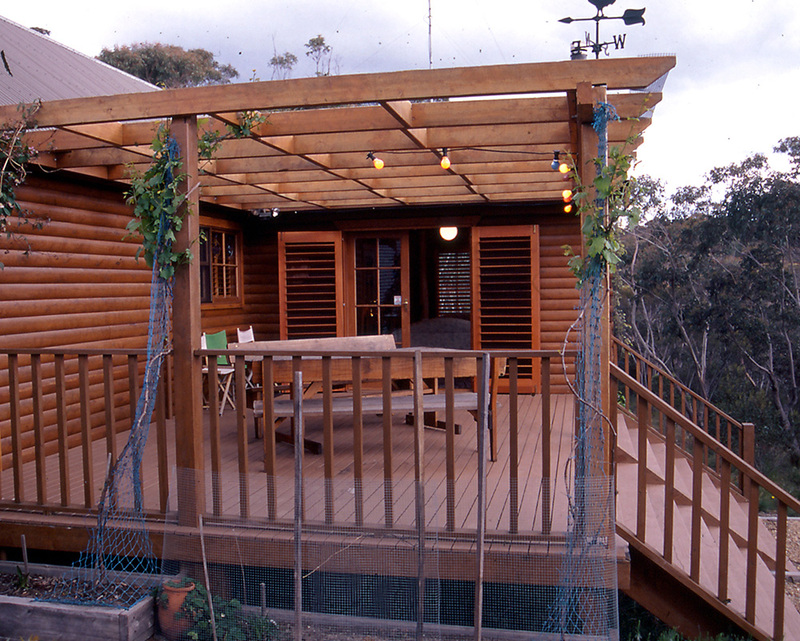 This design has 85 m2 of living space and 26 m2 of deck and verandah space. 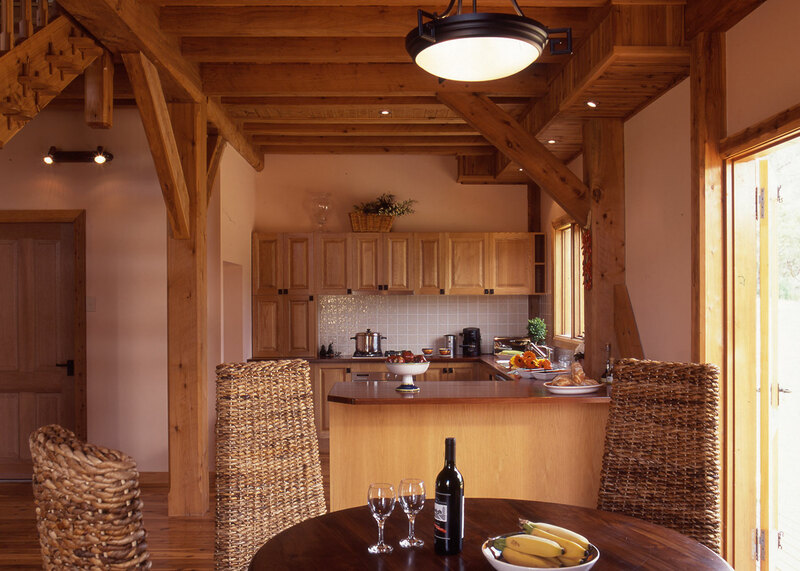 The Mistaya is an elegant single story home that defies description, it has vaulted ceilings throughout and a variety of quite distinctly different spaces. 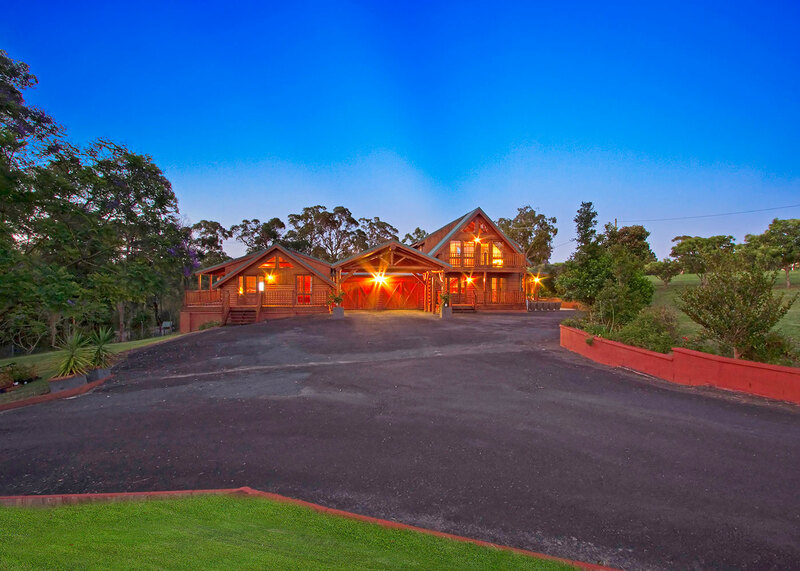 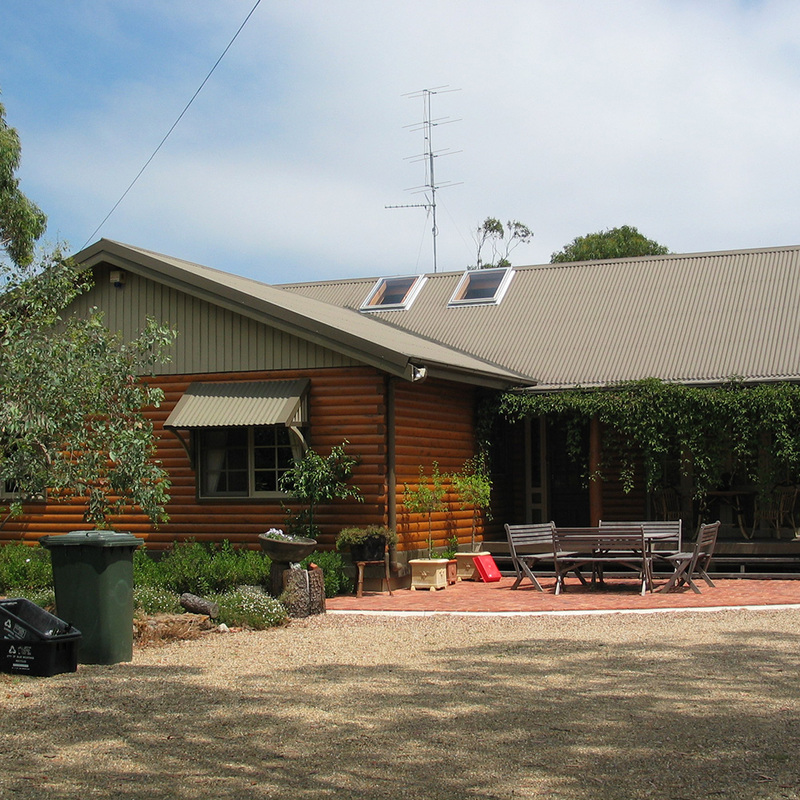 A true country home excellent for entertaining. 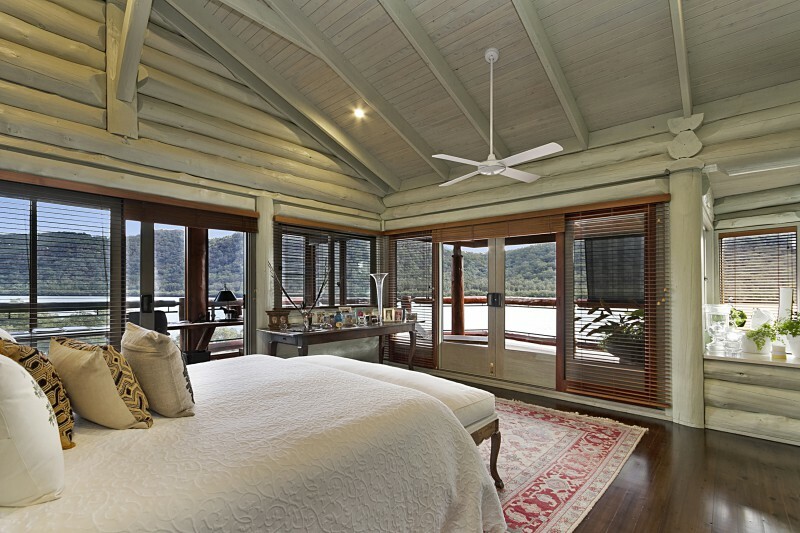 The Mistaya has 161 m2 of living space, designed to fully utilise every square metre, and 40 m2 of verandah and deck. 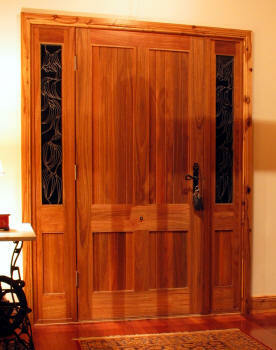 This one has to be seen to be fully appreciated. 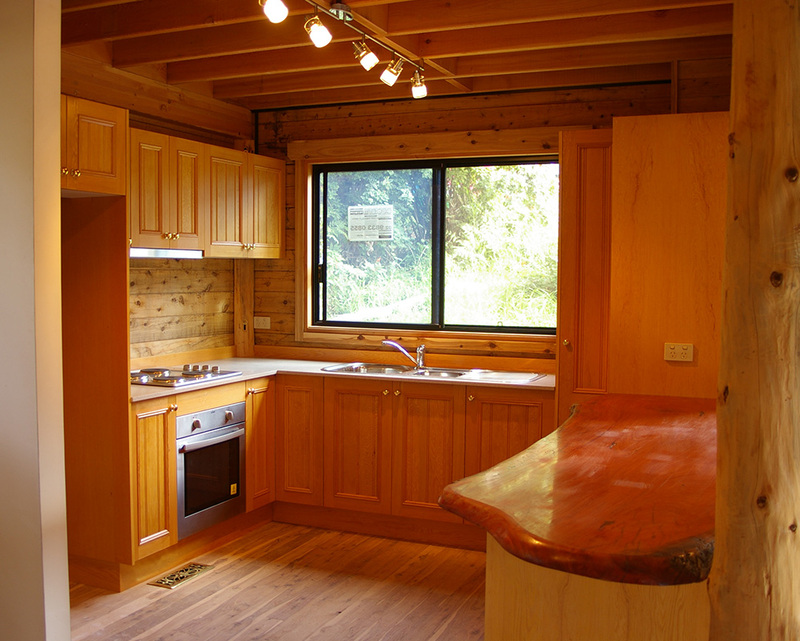 The Cassiar Cabin was designed to provide holiday accommodation, with plenty of sleeping areas, and cosy living spaces. 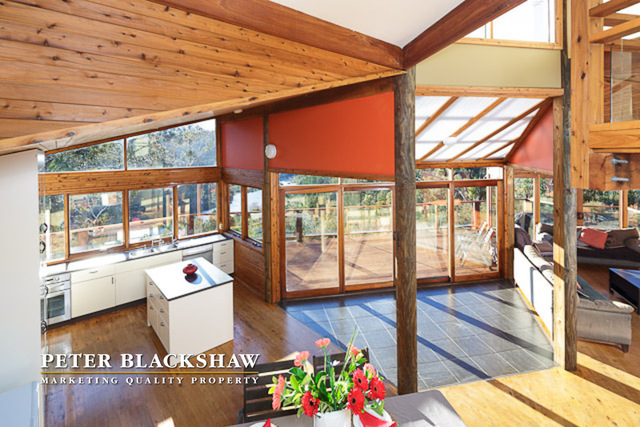 It has two separate living areas, an eating nook featuring a bay window, and a large office which doubles as a master bedroom. 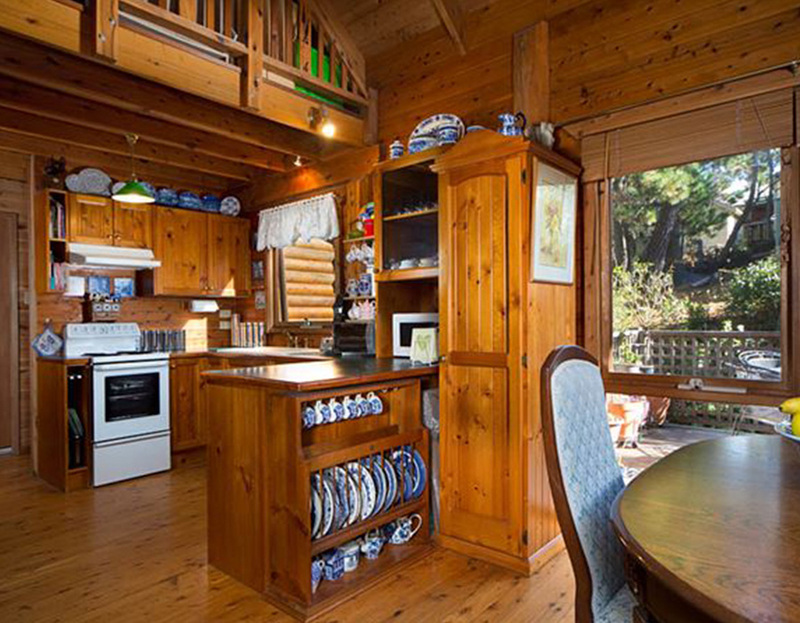 Compact and full of character, composed of 117 m2 living space and 27 m2 deck space. 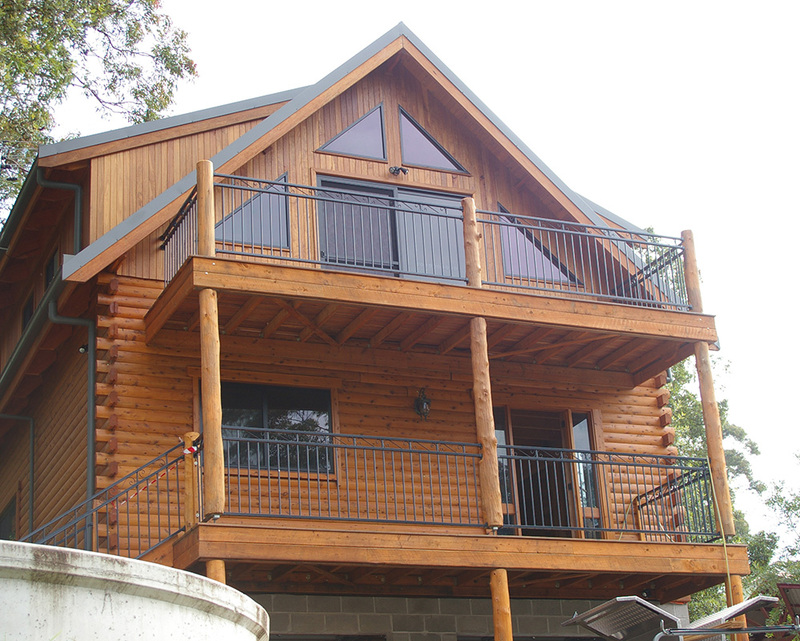 The Penticton is a clever combination of the Cassiar Rock and the Cassiar Peak, incorporating four bedrooms and an upstairs ensuite in the same living and deck space as the Cassiar series. 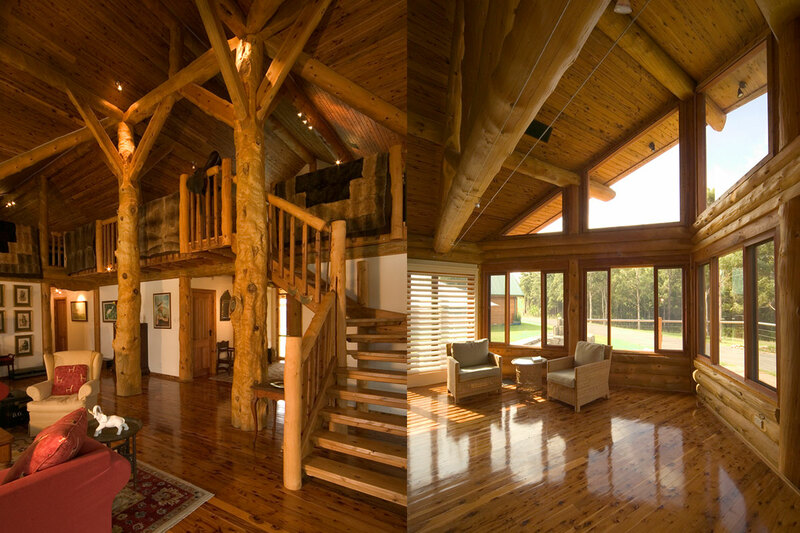 It combines the features of both designs into one, creating an inviting home for a family. 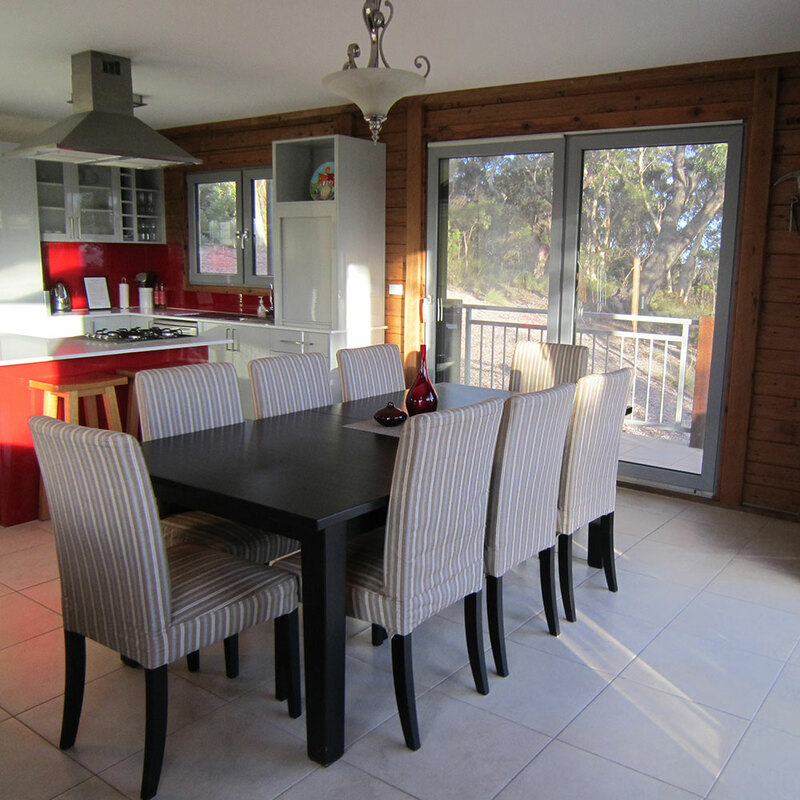 The living space is 130 m2 and the deck space is 23 m2. 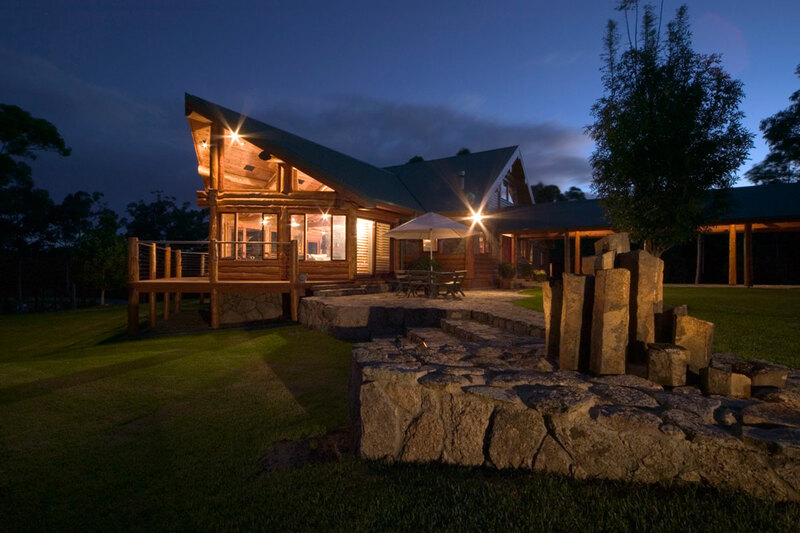 The Tea Garden Project is a wonderful example of our capabilities, we designed this using our 3D Object Modelling software and the artistic abilities of the owner. 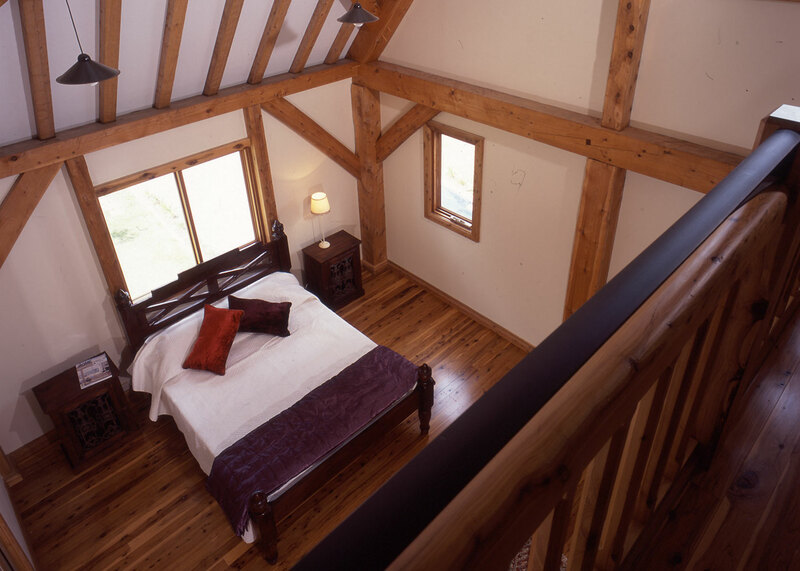 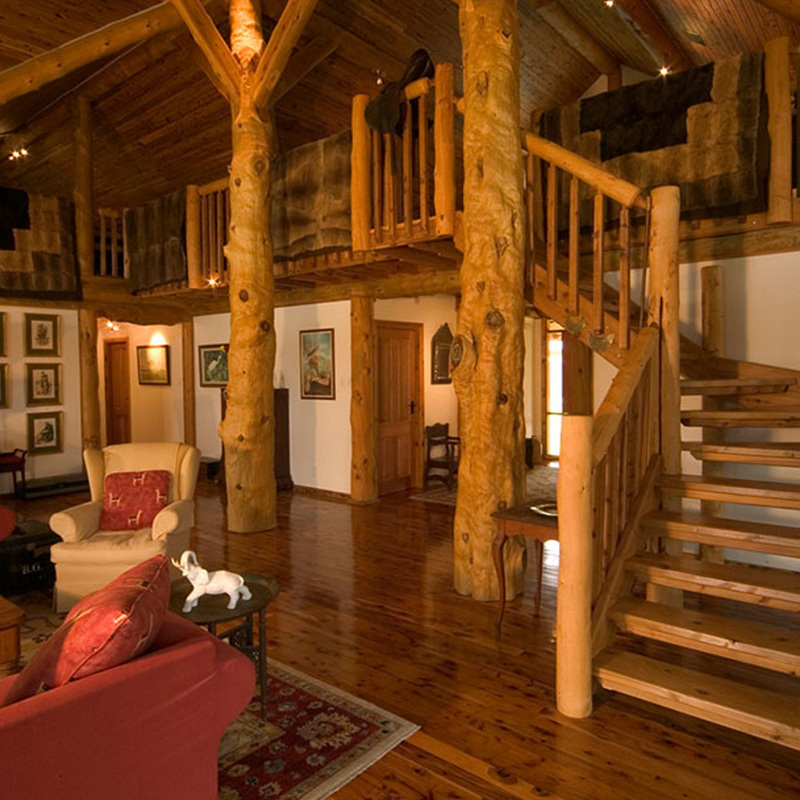 The design is essentially handcrafted log Post and Beam with handcrafted walls in the living areas, and engineered log walls in the bedroom wing. 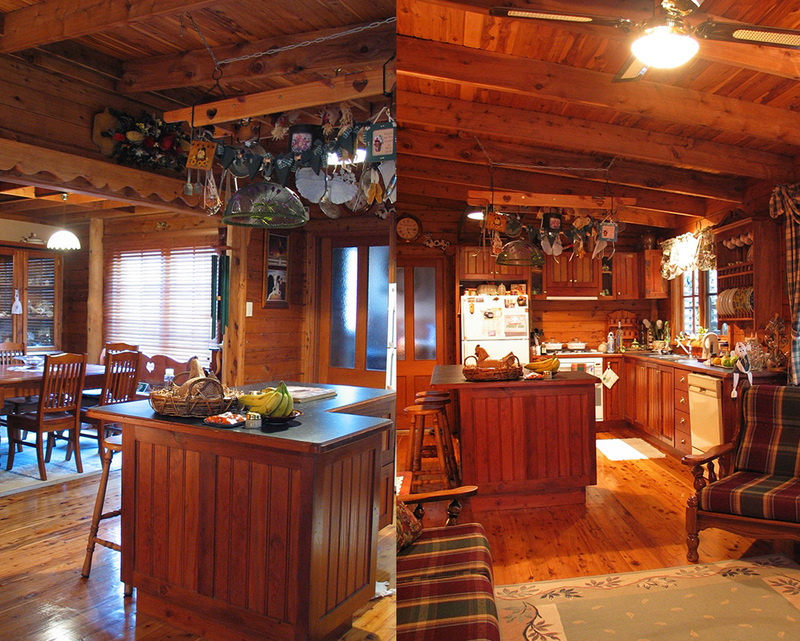 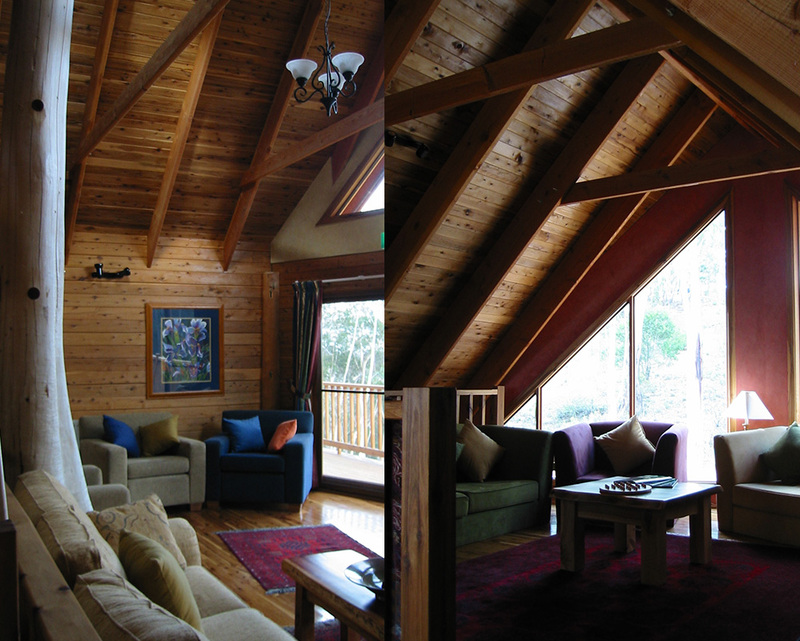 The home also showcases four handcrafted trusses, and our version of the Ents from Lord of the Rings! 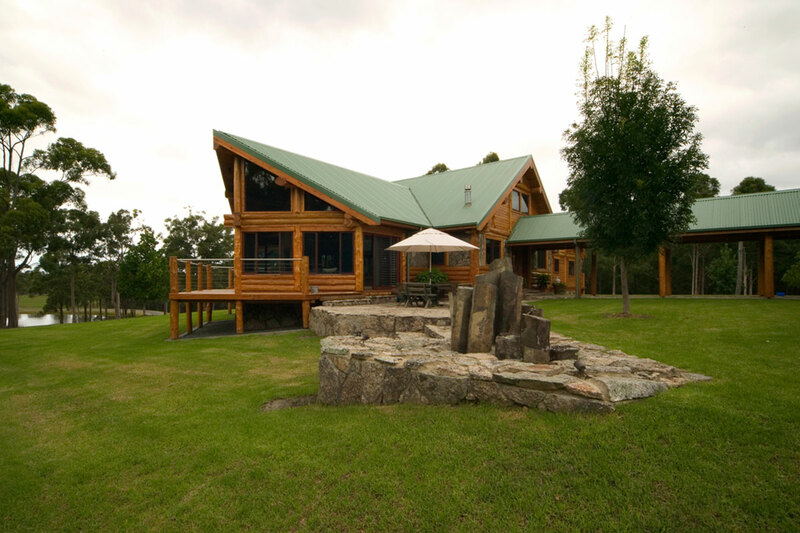 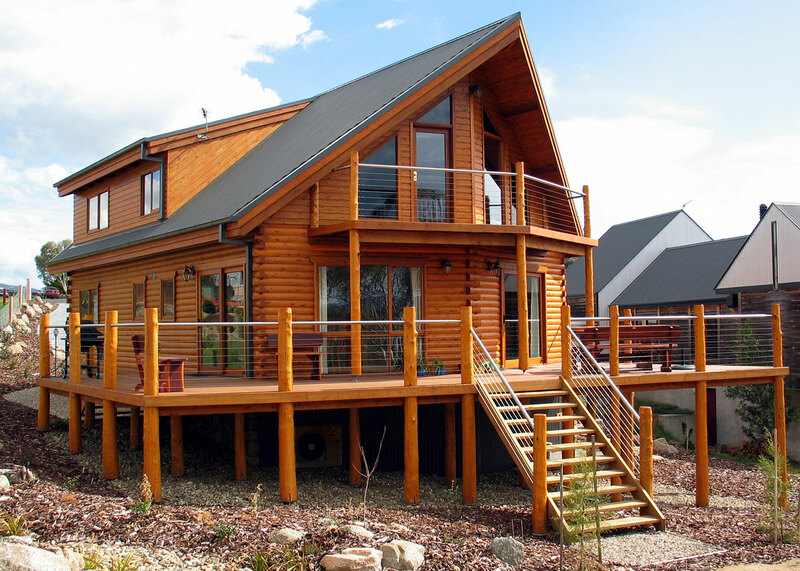 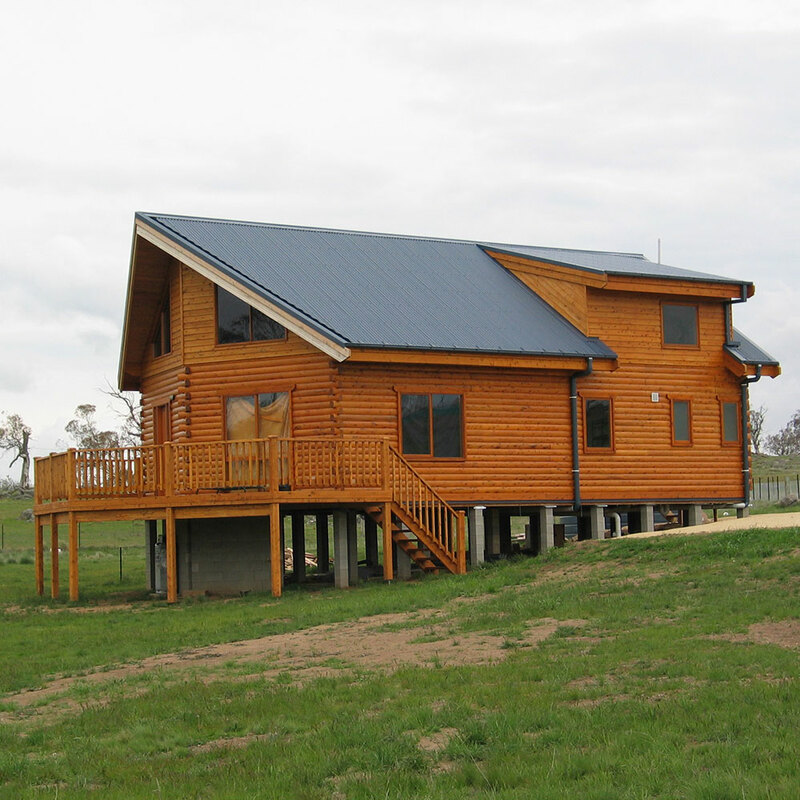 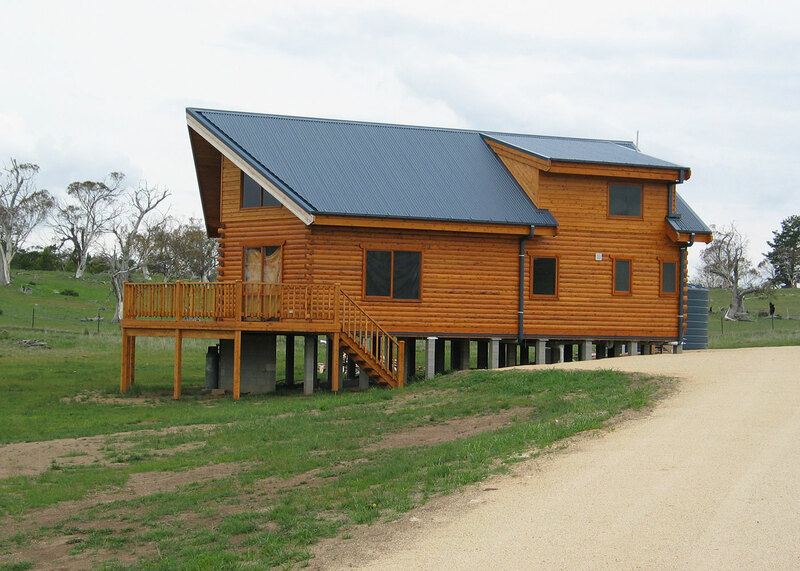 The Abbey is our inaugural timber frame home, a bit different than our other log homes. 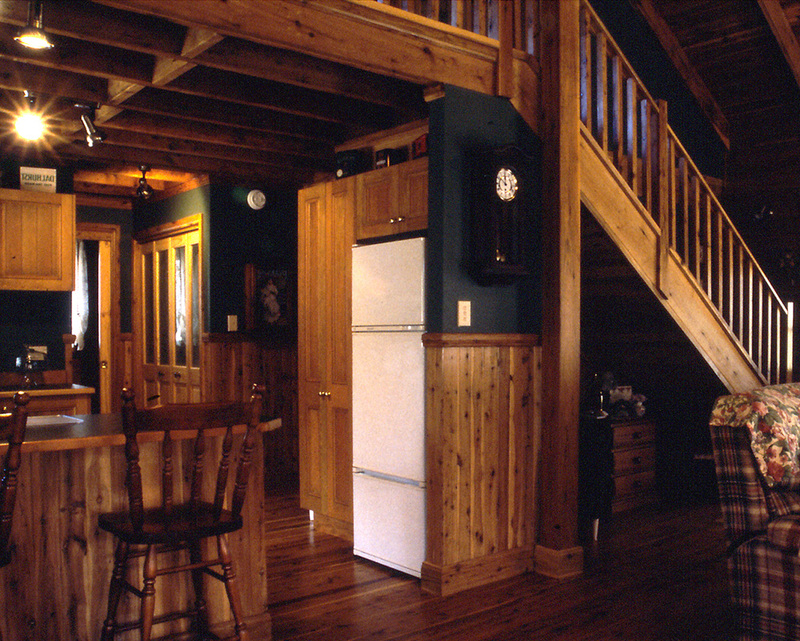 It is a spacious beautifully crafted house with true cathedral (you would swear you were in church) hammer beam truss in the living room, a master bedroom with a private loft study, a massive loft bedroom looking out over the living room, a formal dining room (or guest room if you prefer), and two other bedrooms. 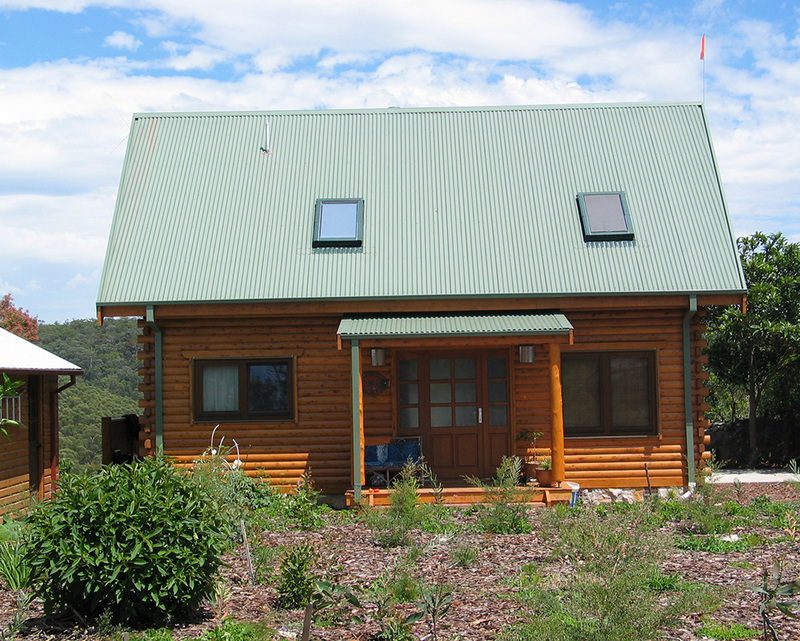 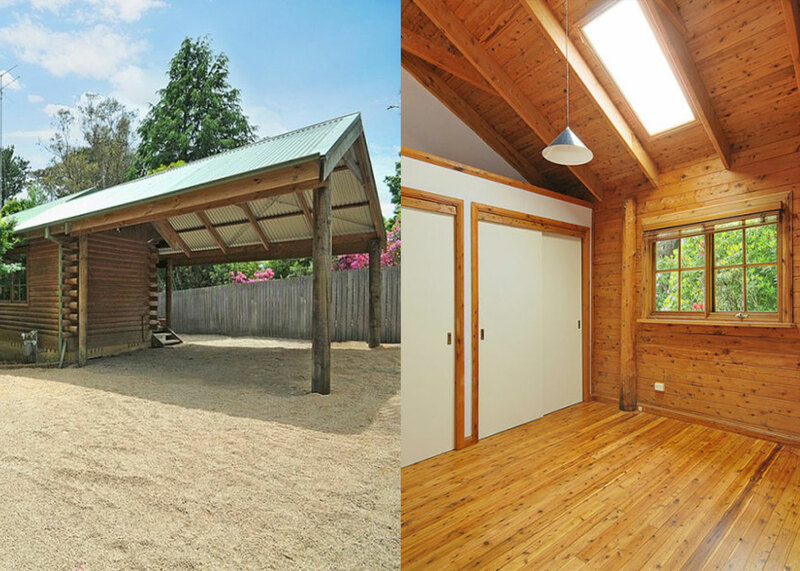 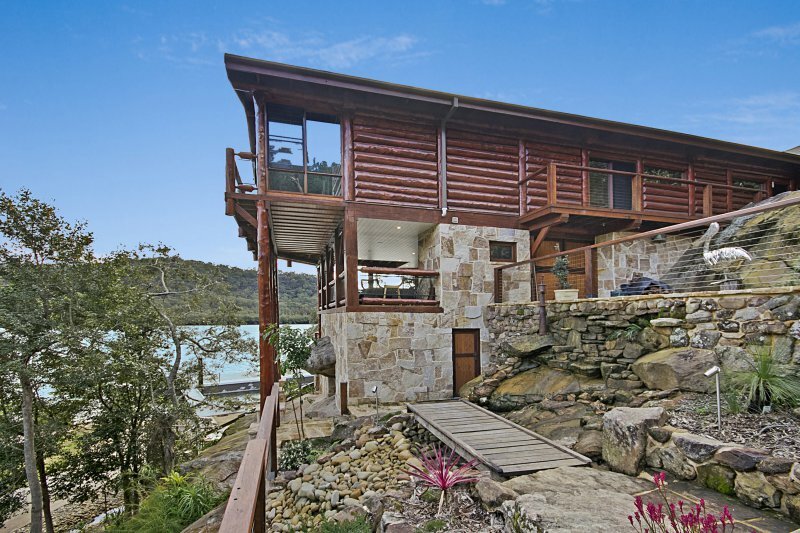 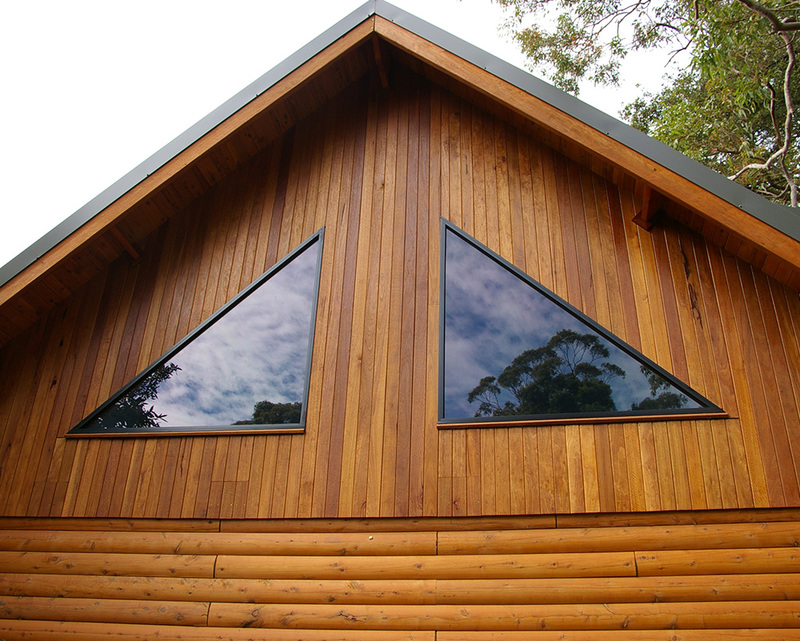 Very deceptive and ordinary looking from the outside, but a timber lovers delight inside. 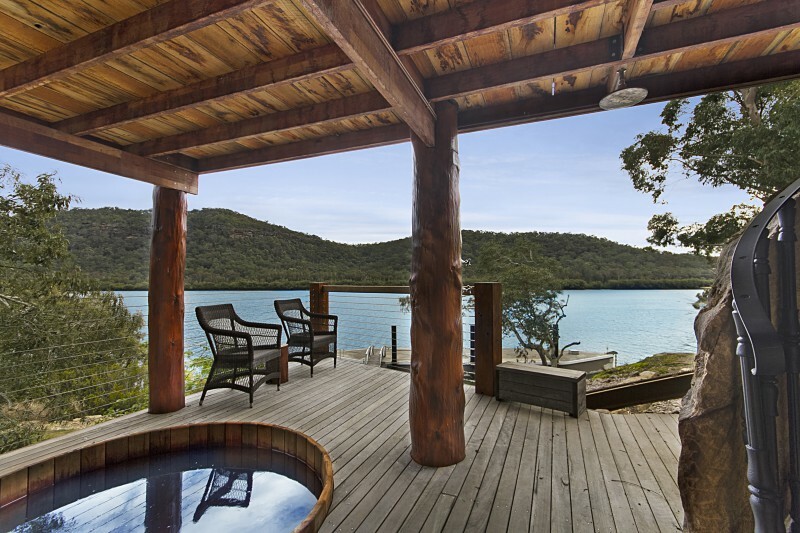 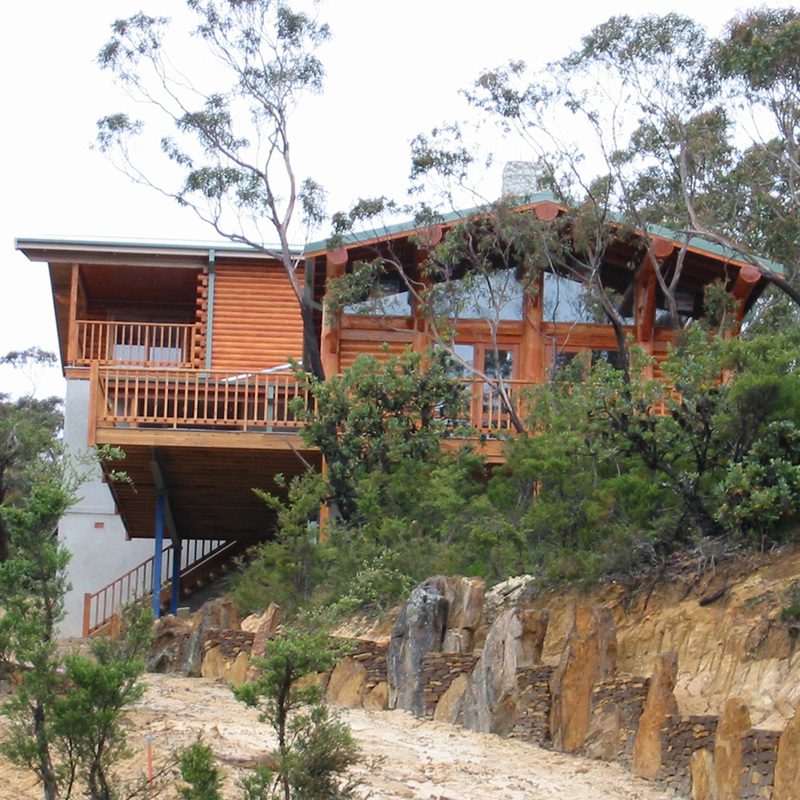 The Cassiar Rock is our oldest design, and still very popular with its open plan living and great entertaining decks. 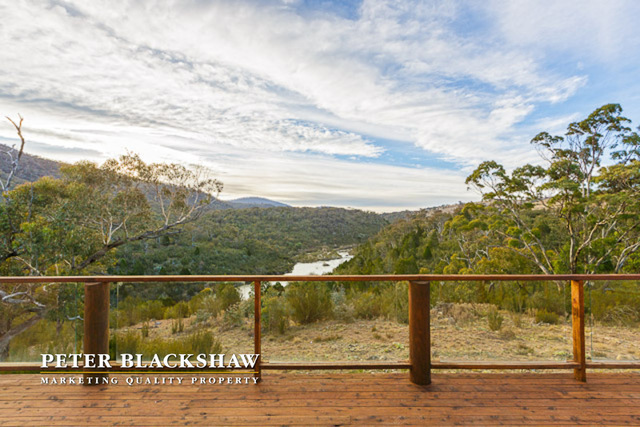 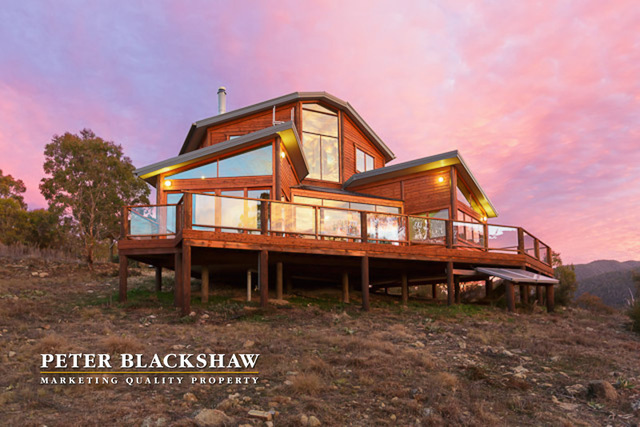 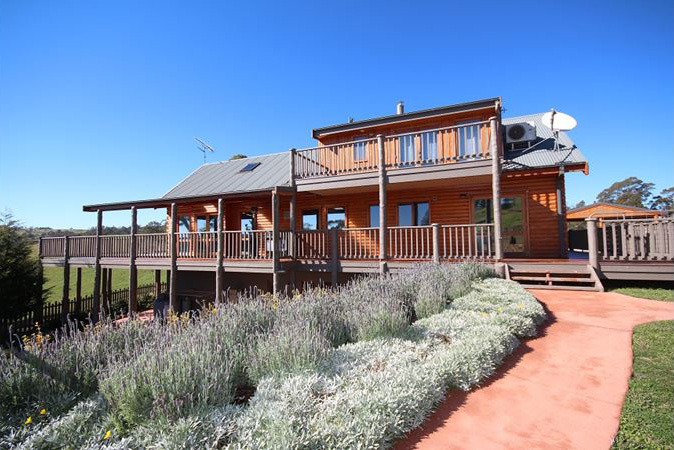 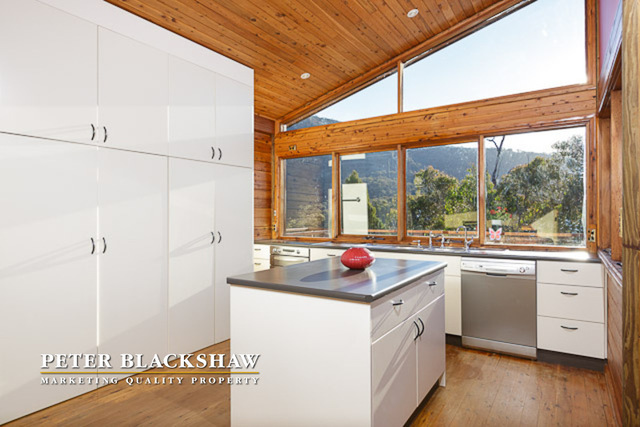 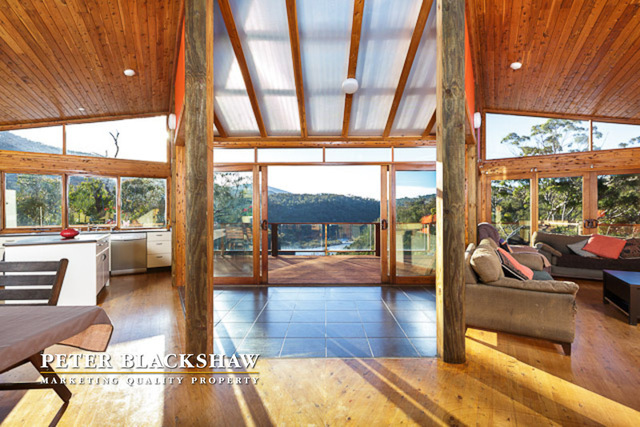 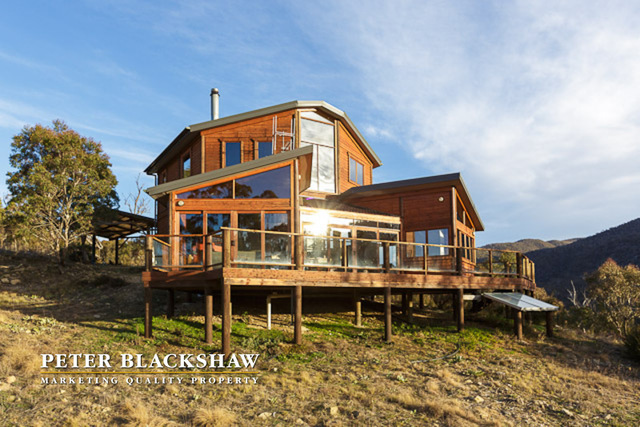 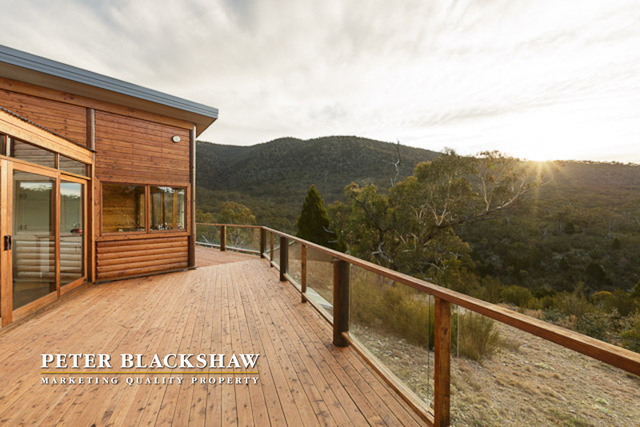 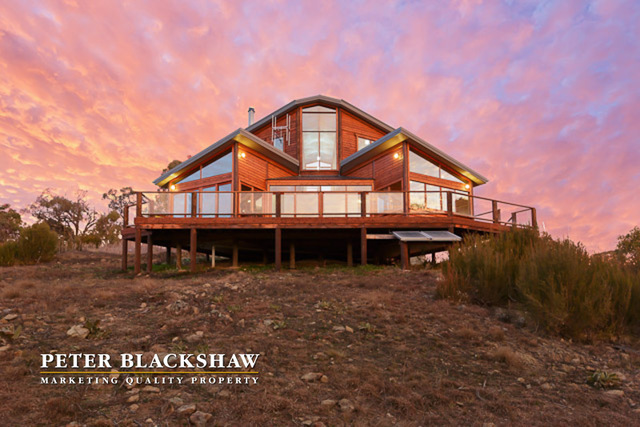 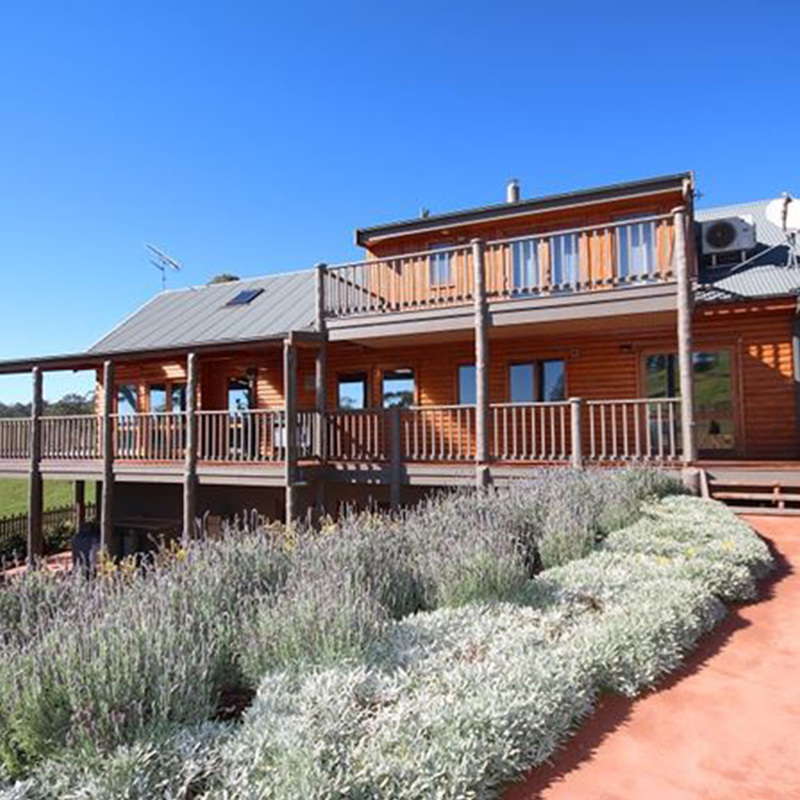 This house suits a block of land with views to the rear, and incorporates 130 m2 of living space and 23 m2 of deck area, not to mention the cute porch. 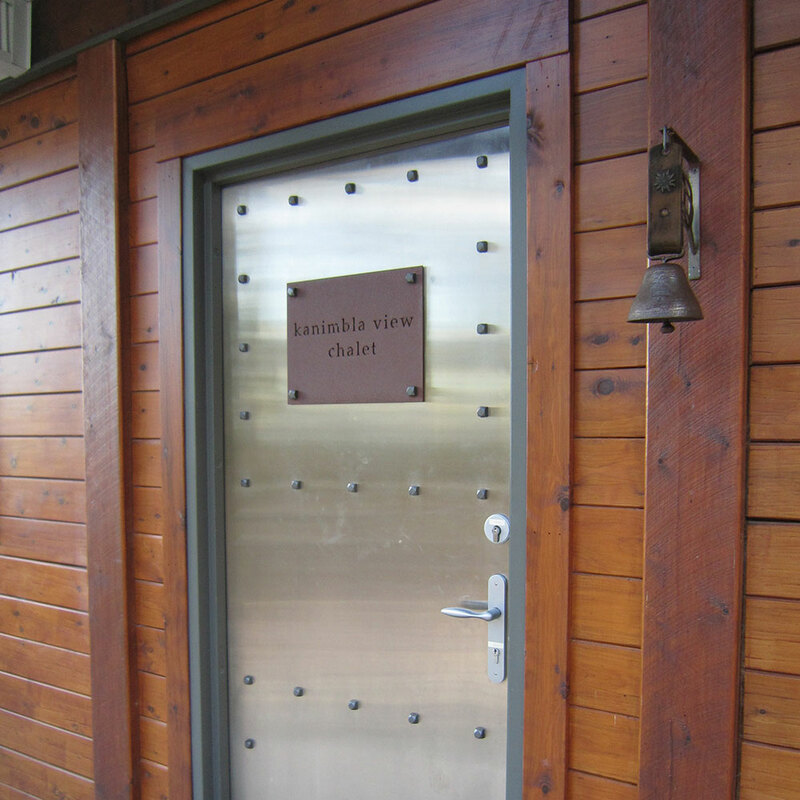 Endless variations are available, and the price includes two security leadlights to the cathedral windows seen here. 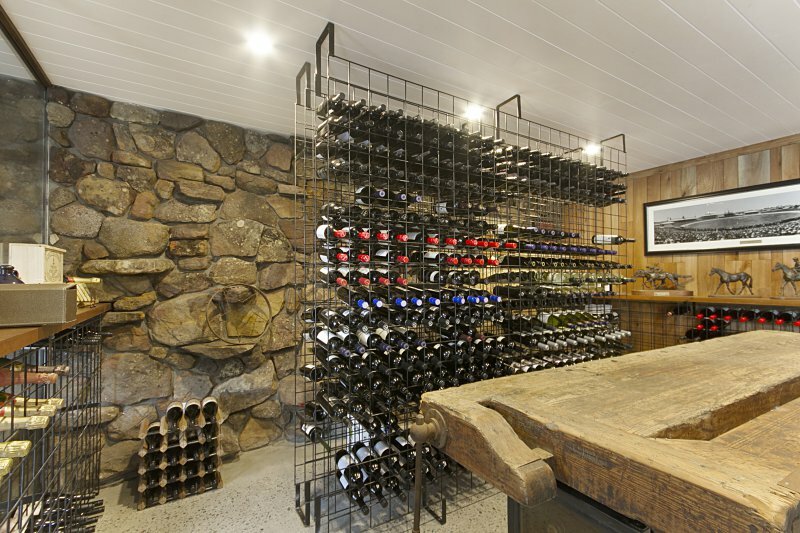 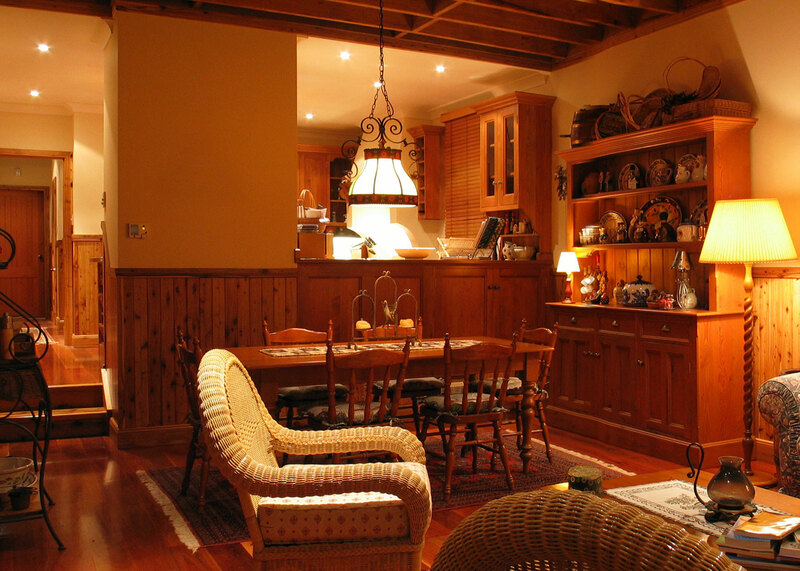 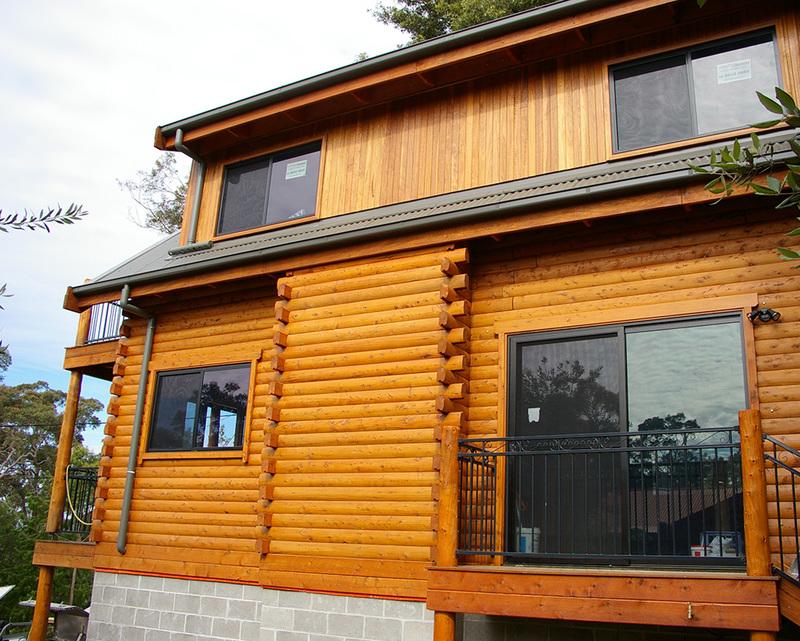 The Babine Chalet has now evolved from its start as our handcrafted display home into many variations on the theme. 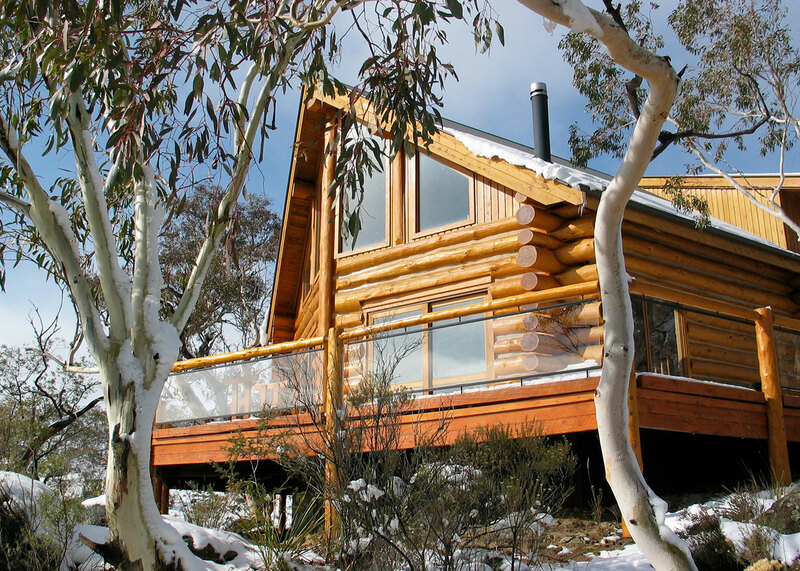 It could be called a mini-Todd Chalet in reality. 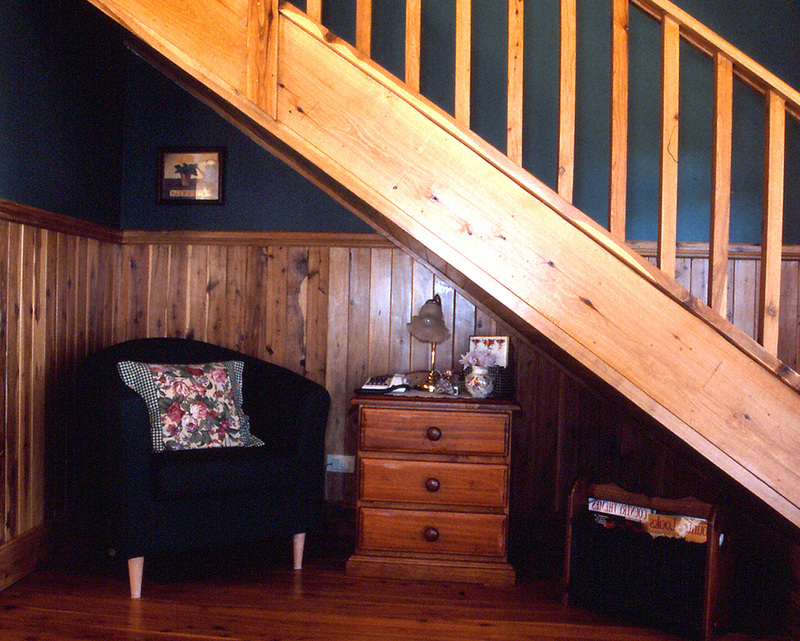 The display home has a loft ladder, which many people are not too keen on, but this has been converted into staircases in several of the designs. 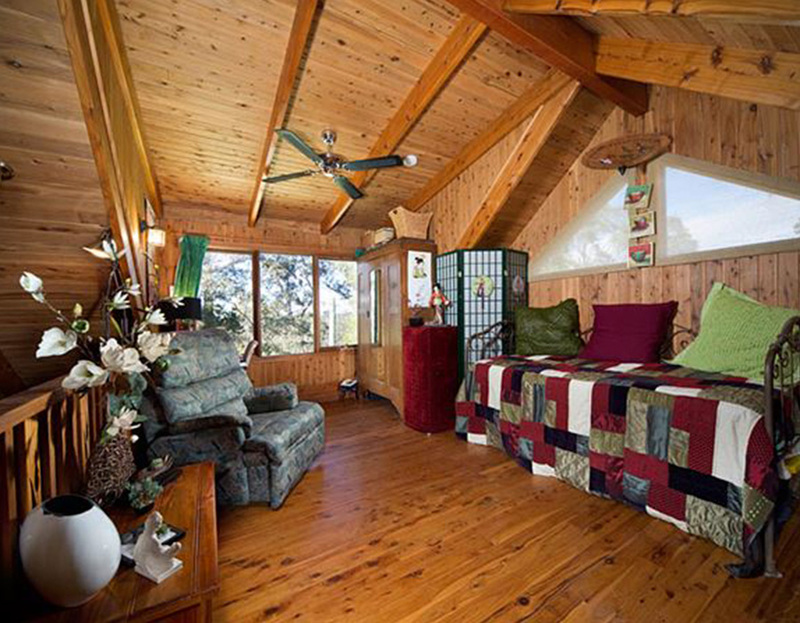 This is a great two bedroom and loft design, or full three bedroom, which seems to fit many peoples budget with a touch of the prow design so popular with our homes. 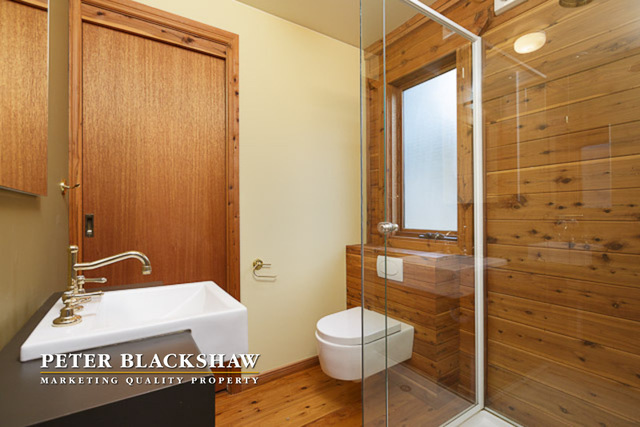 The Chilliwack is a great little single story 3 bedroom, with vaulted ceilings to give a feeling of space. 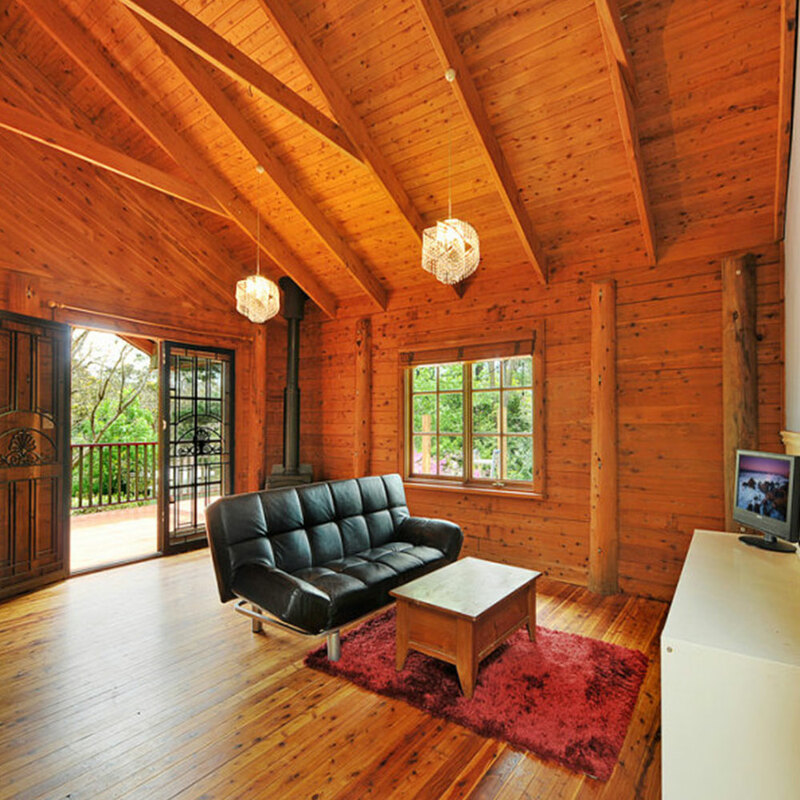 It has a large living area with the third bedroom suitable as a sitting room, study or office. 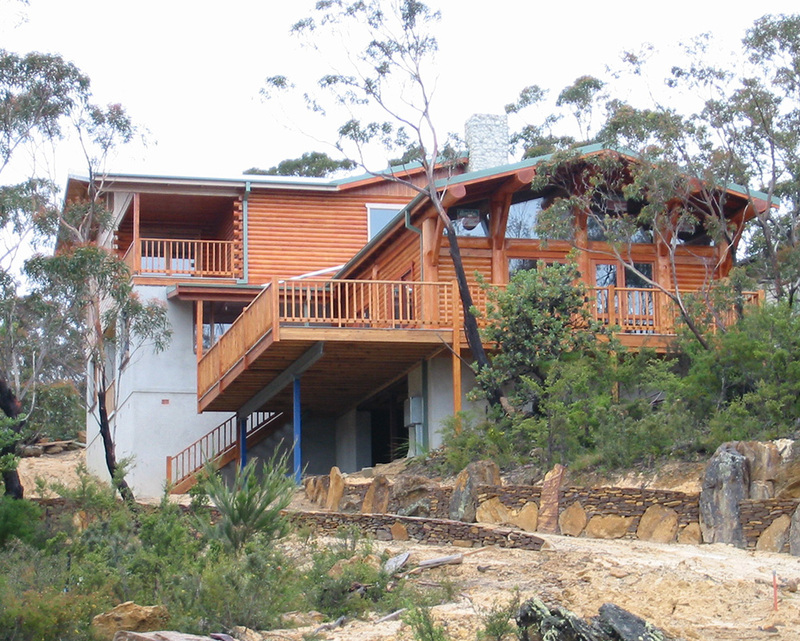 It has a total of 97.3m2 living space and 3m2 of entry deck. 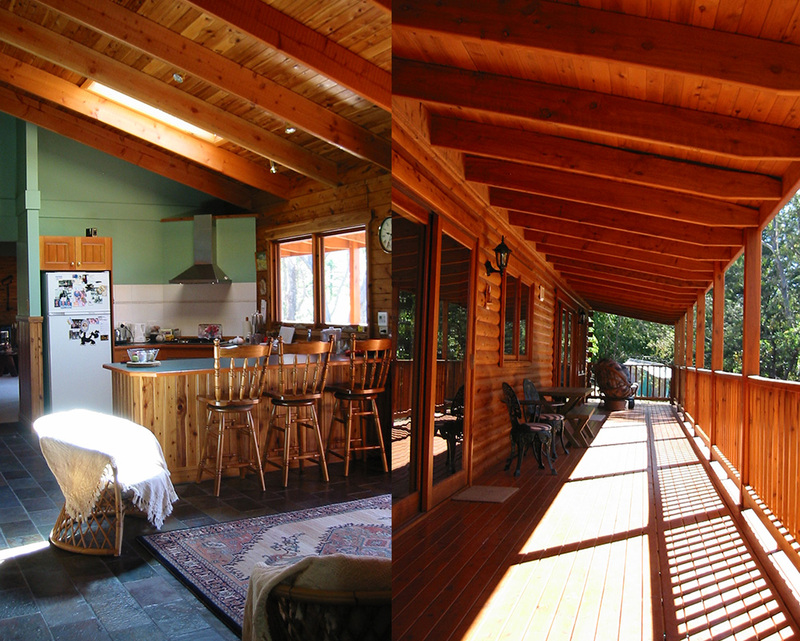 The photos show a variation of the Chilliwack, in which the plan was altered to provide for a large entertaining deck. 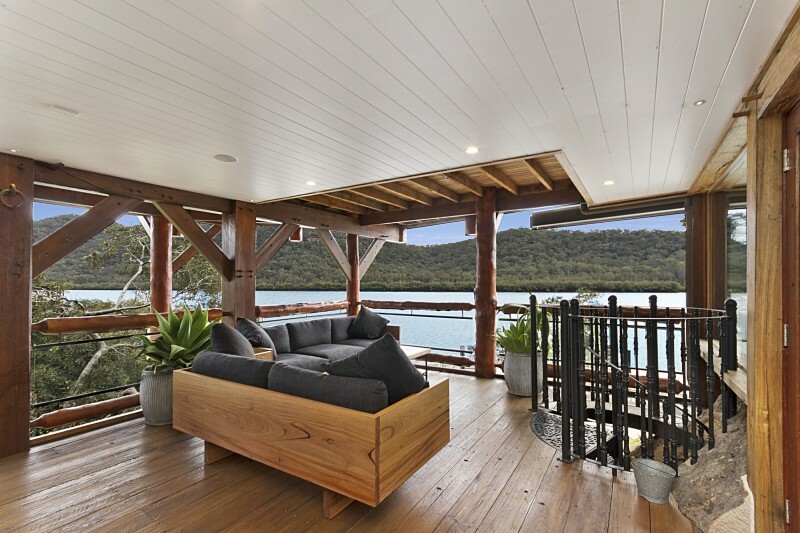 The Farago IV Project is another stunning custom designed home which features a combination of timber framing inside, and handcrafted log features externally. 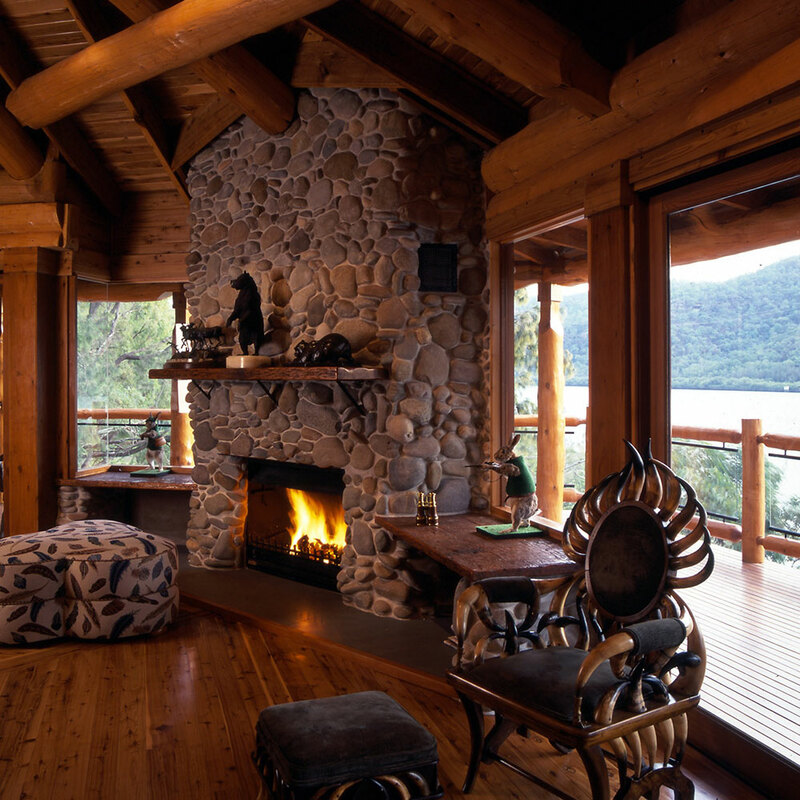 It also has some amazing stonework both on the outside and for the fireplaces inside. 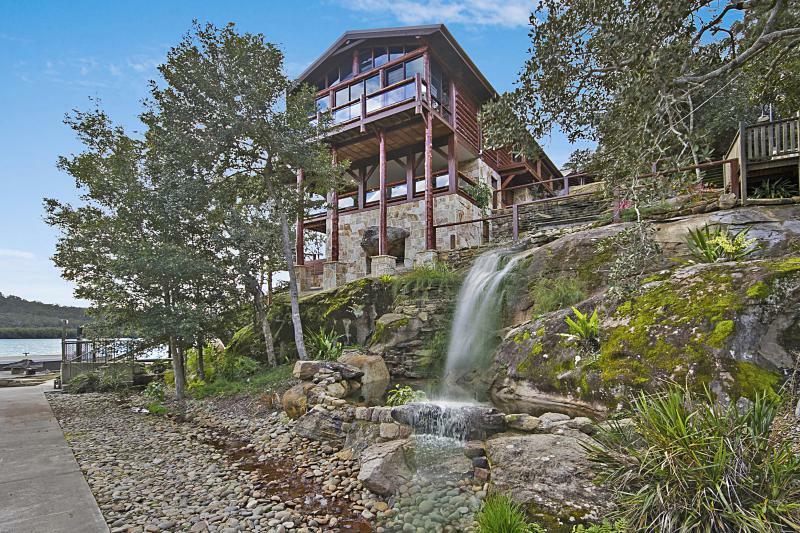 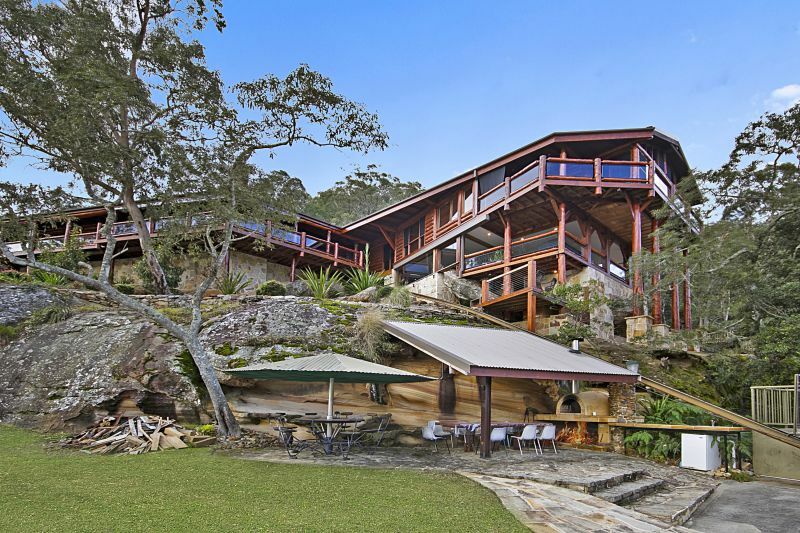 This home was designed by Sydney architect Nordon Jago who was a wonderful architect to work with. 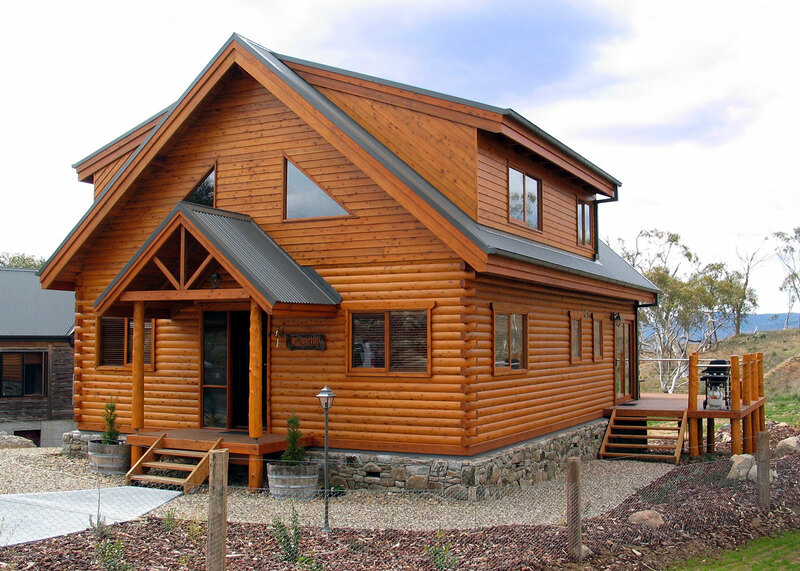 Needless to say, he was impressed with the final result, something completely different than he would normally be used too...designer log homes. 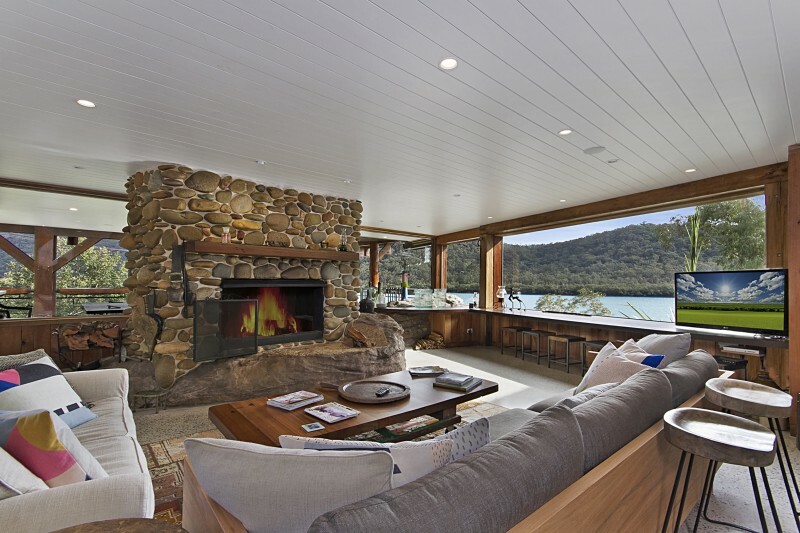 This unique home was designed with relaxed casual living in mind with a real emphasis on resort style living with stunning outdoor entertaining. 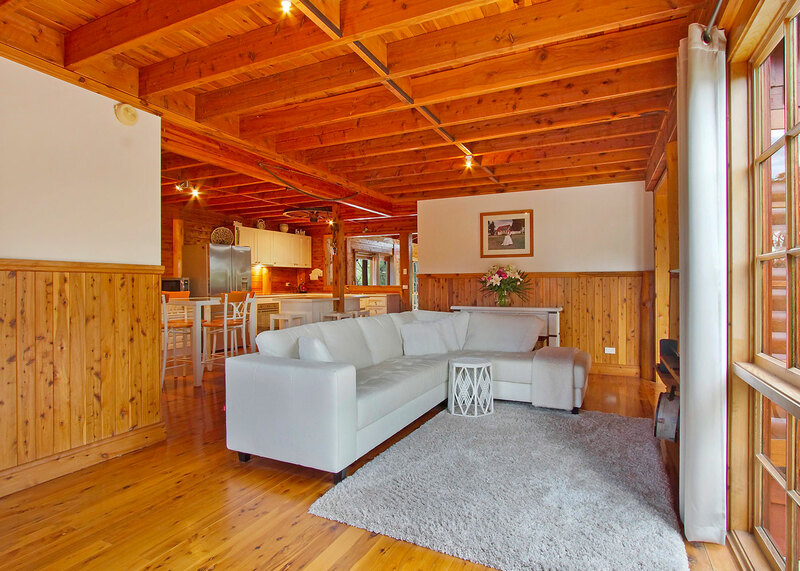 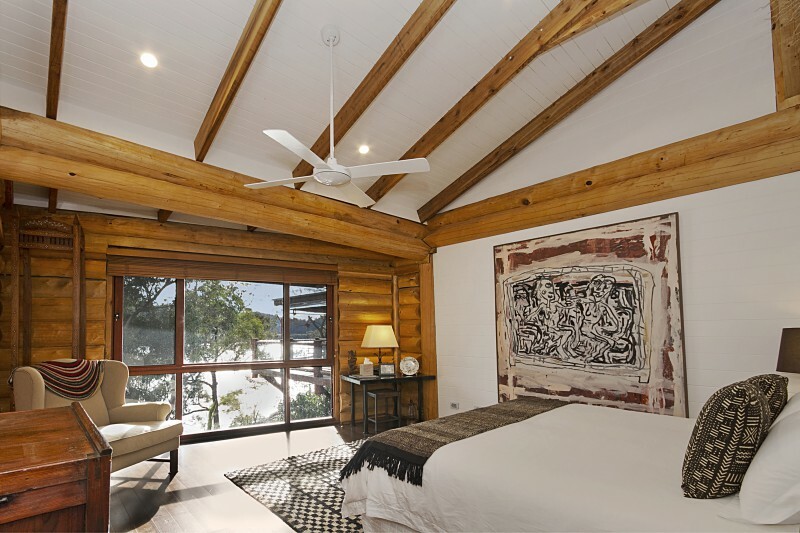 Oozing with glowing timber floors and timber finishes throughout its easy to feel like you are staying in a luxury holiday resort. 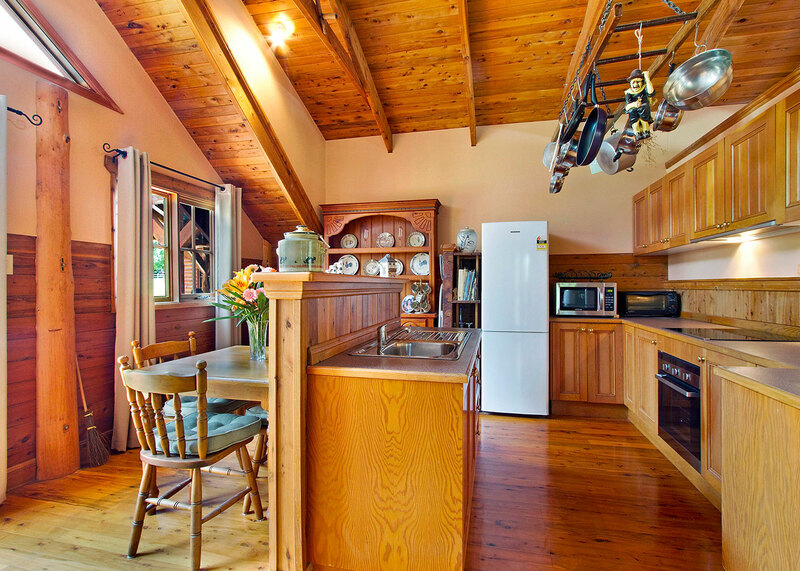 The expansive kitchen offers ample cupboard and bench space plus a built-in pantry, meals area flowing on to a grand open plan living area with stone feature wall showcasing the large heat glow gas fireplace with high cathedral ceilings flowing out to a spectacular undercover, alfresco entertaining area. 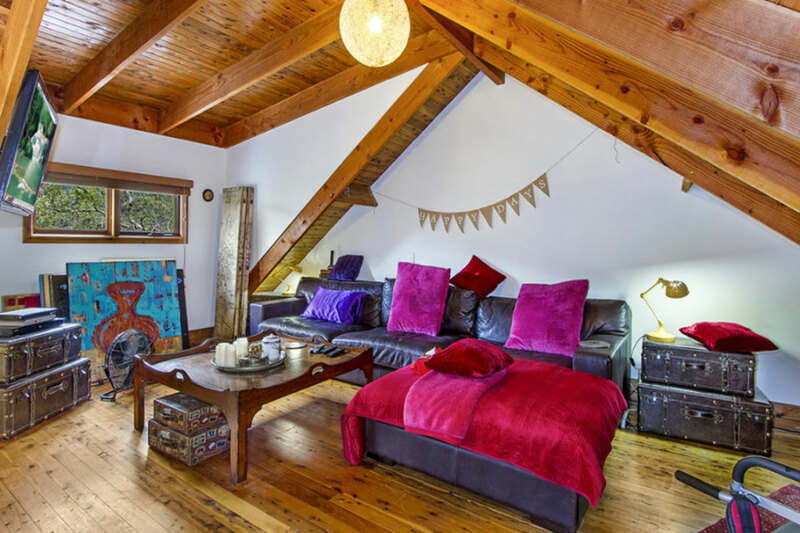 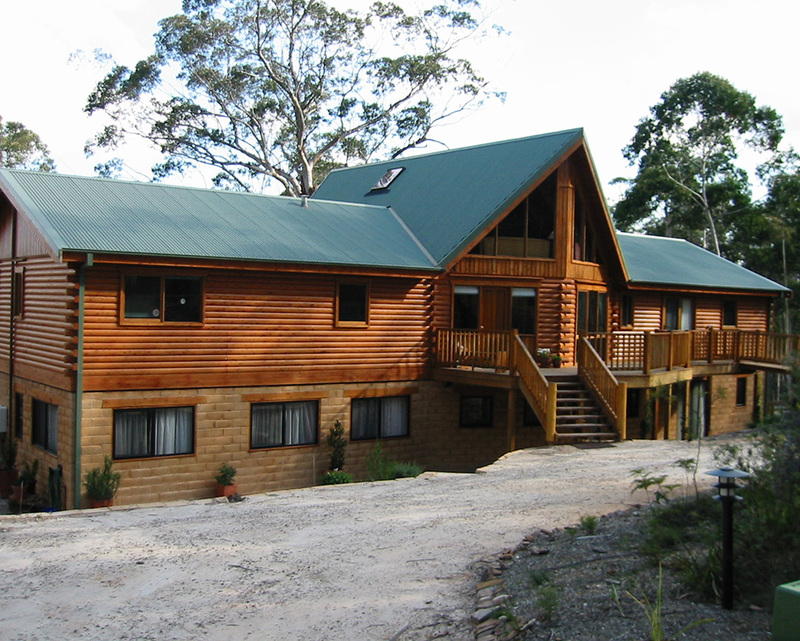 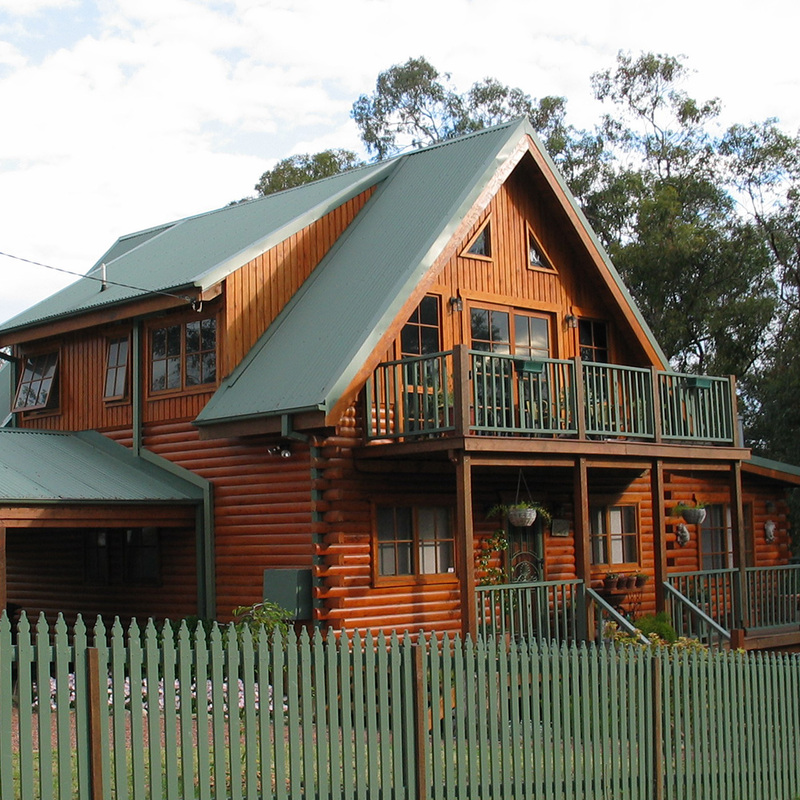 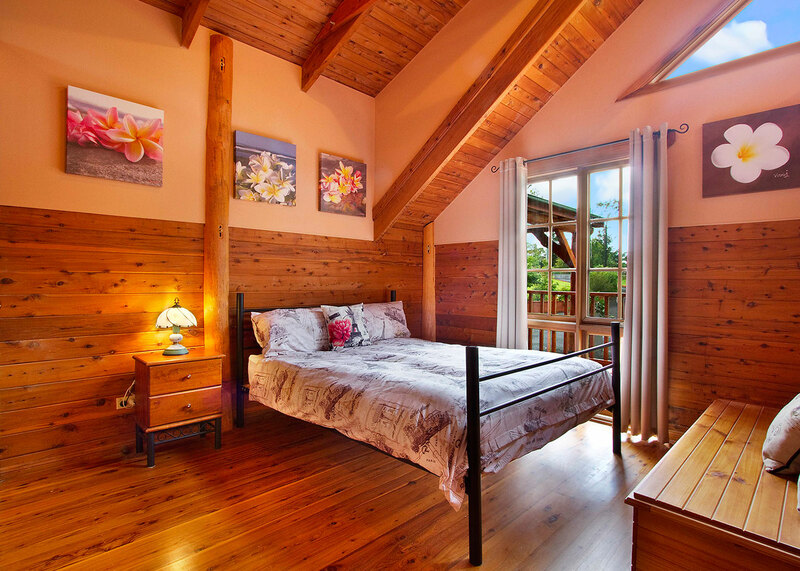 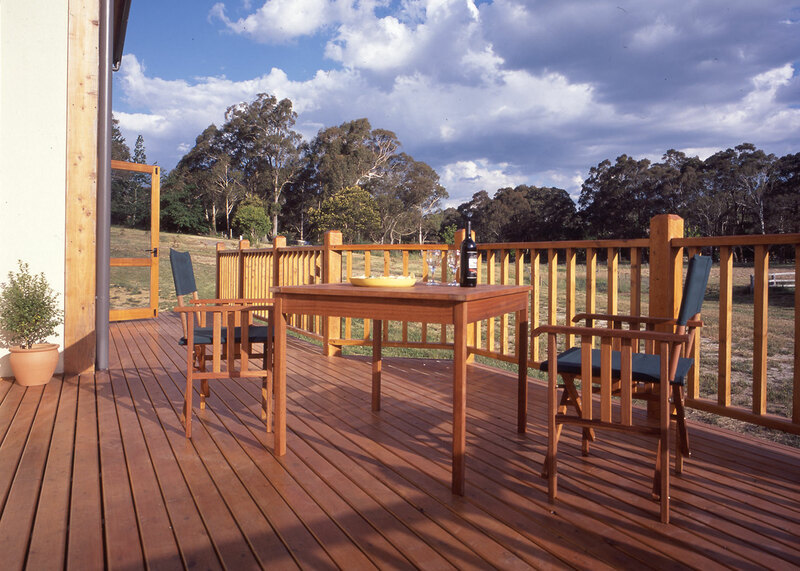 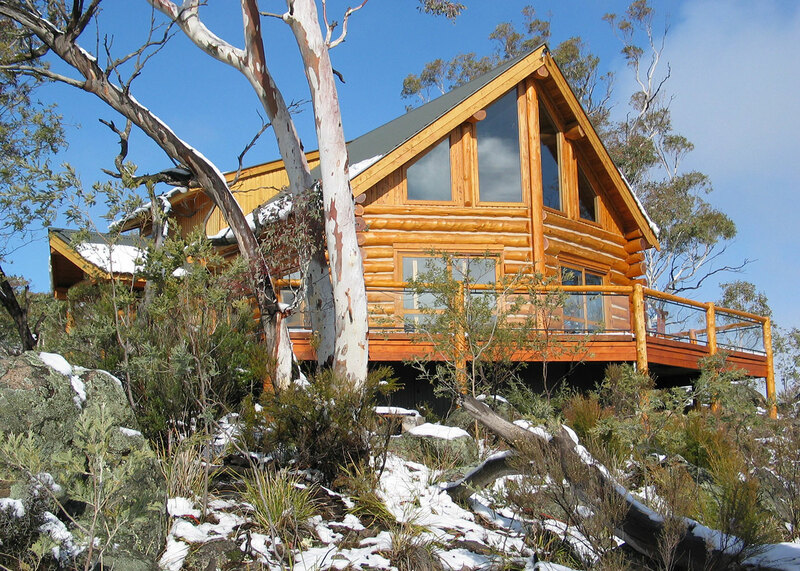 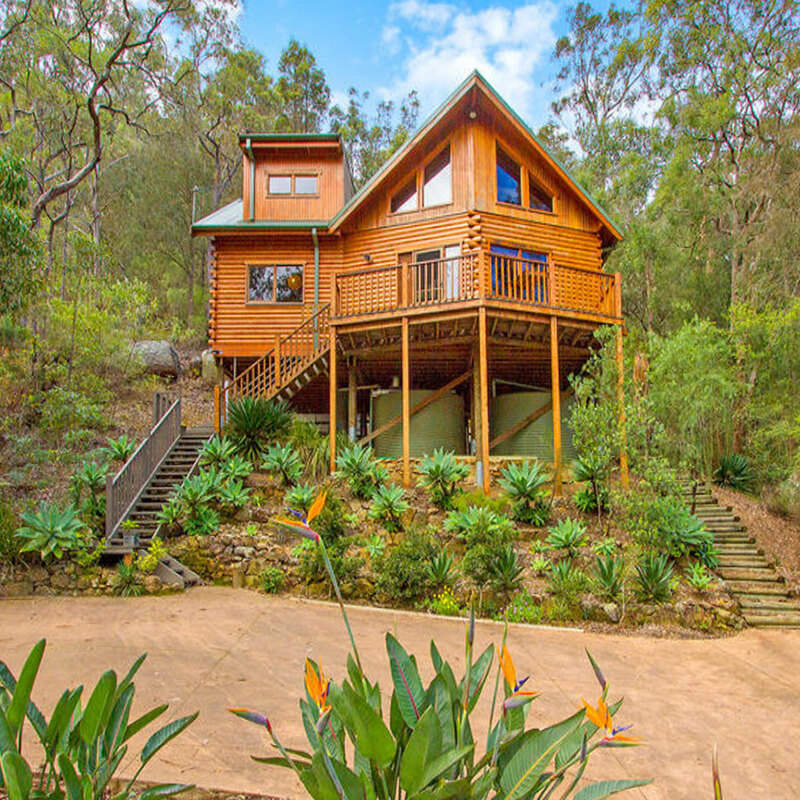 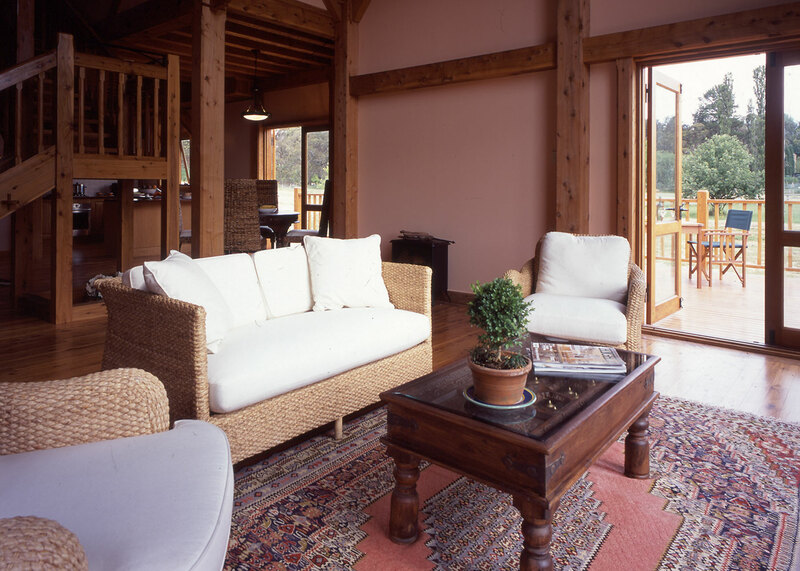 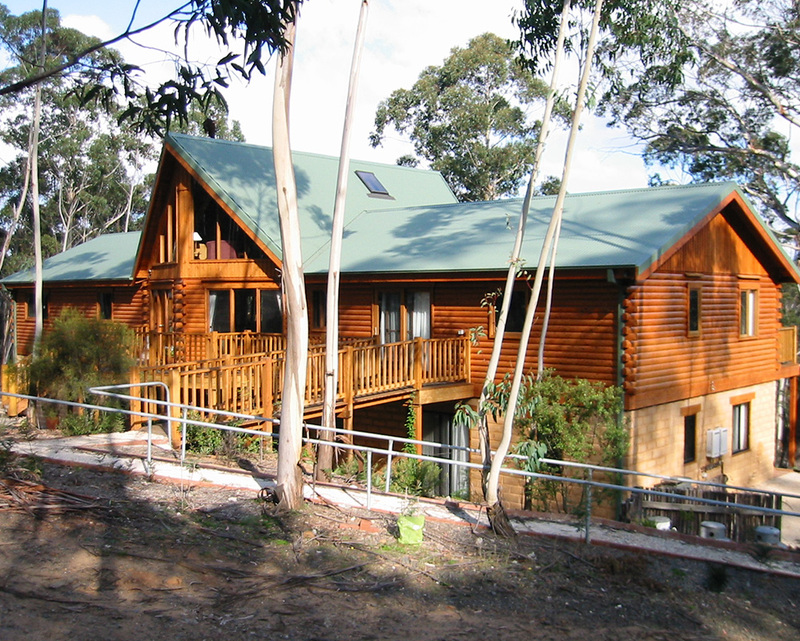 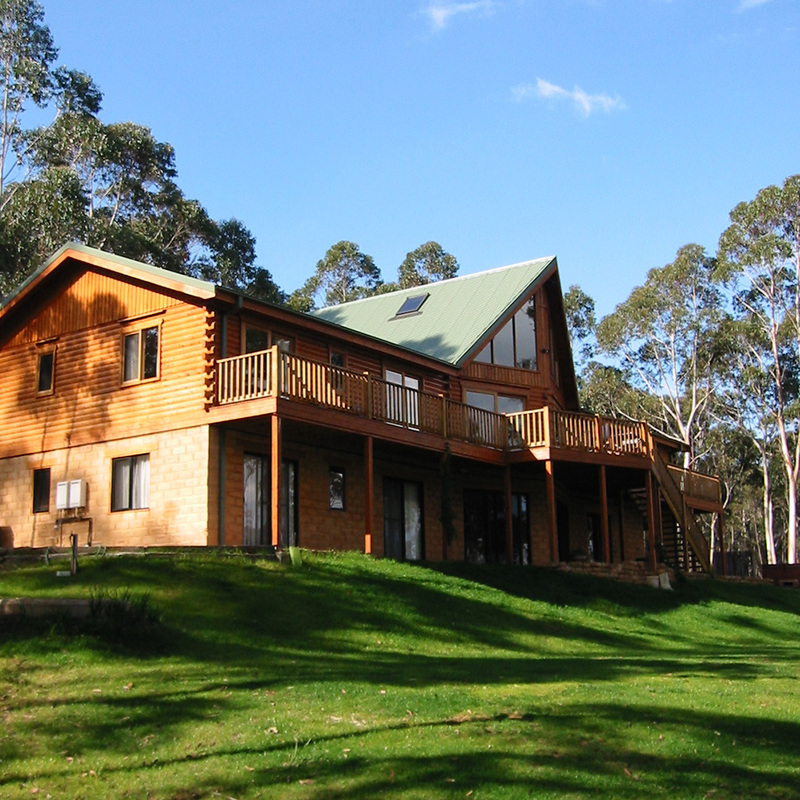 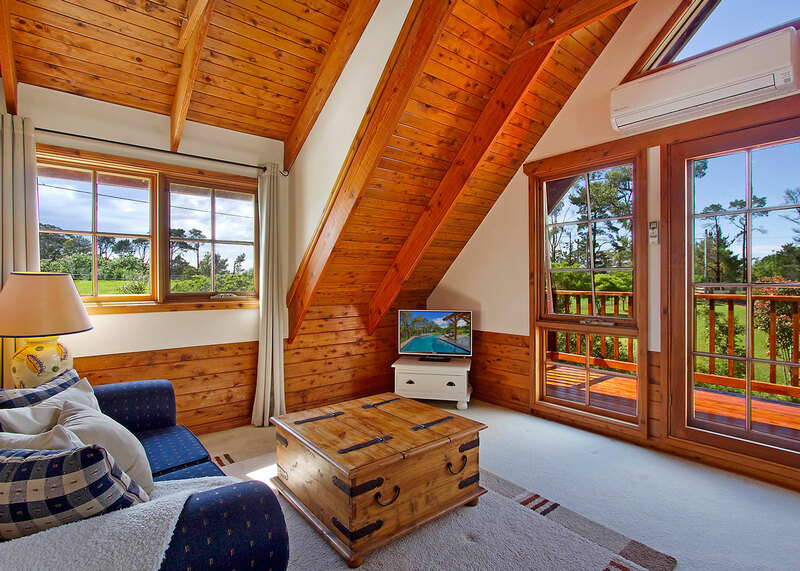 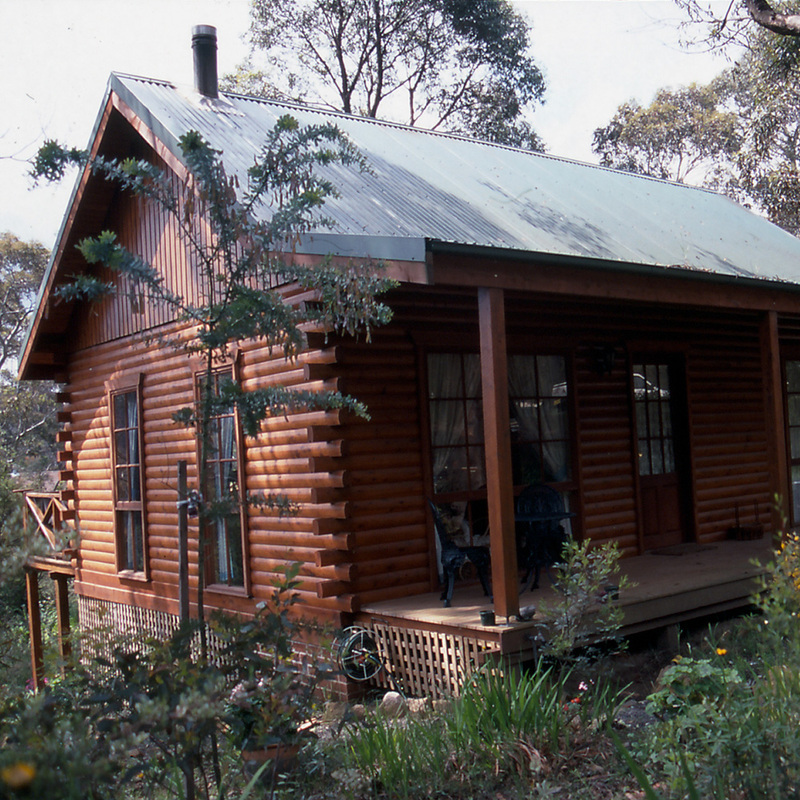 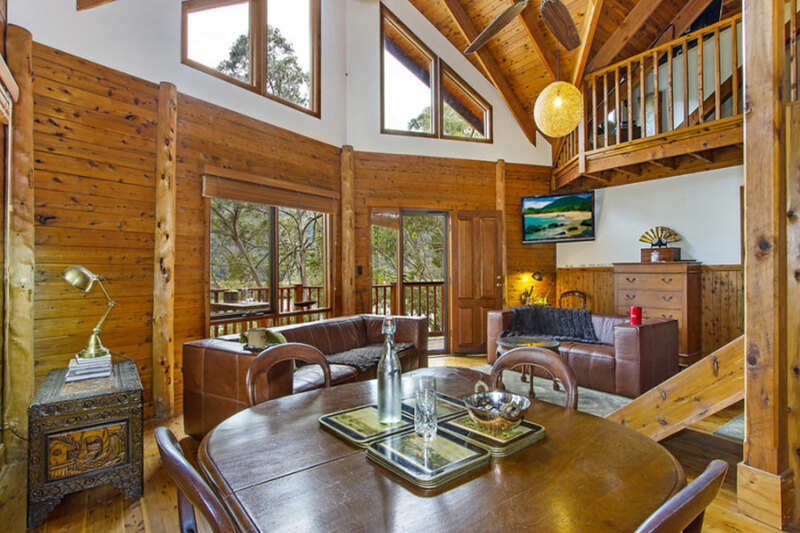 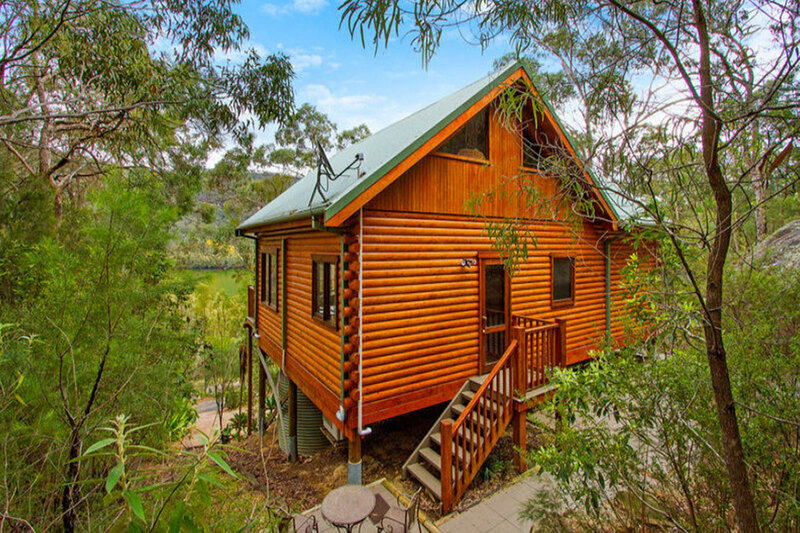 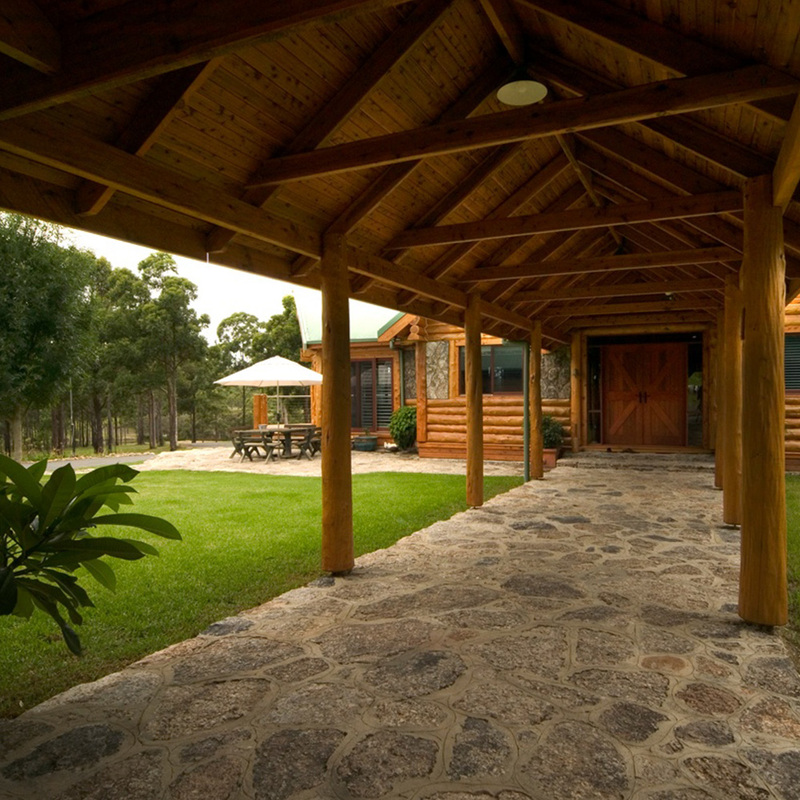 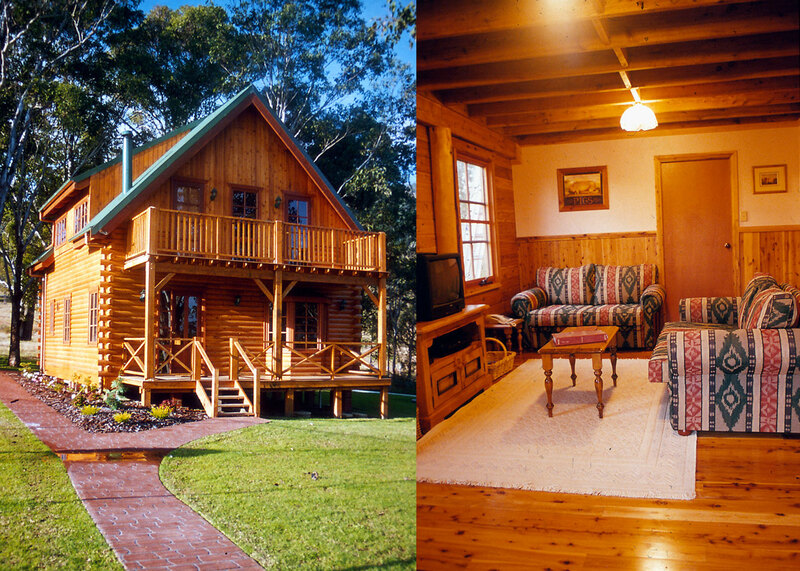 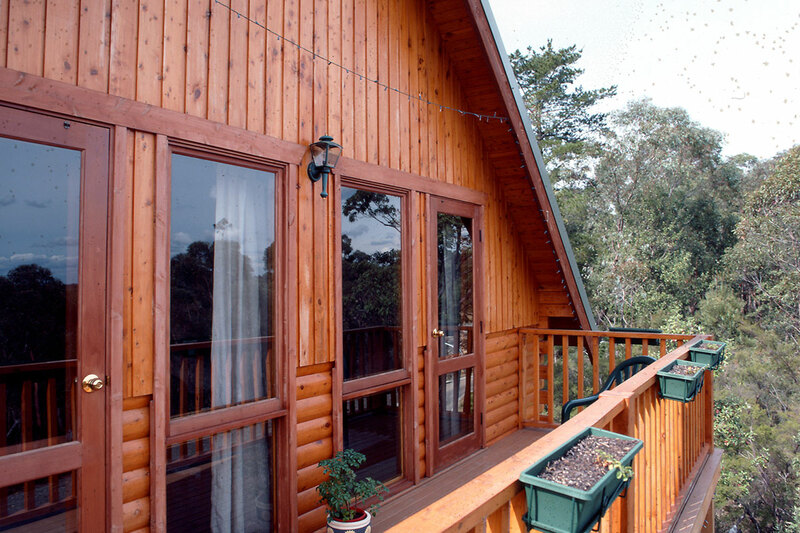 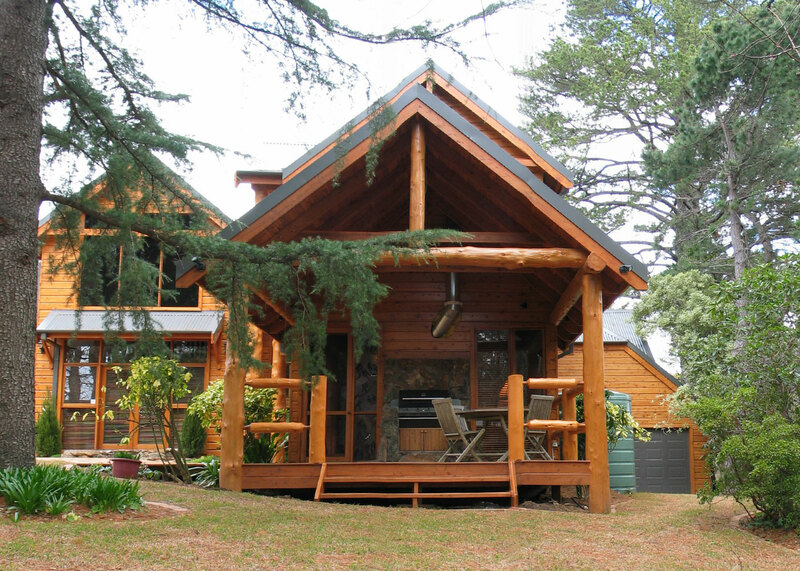 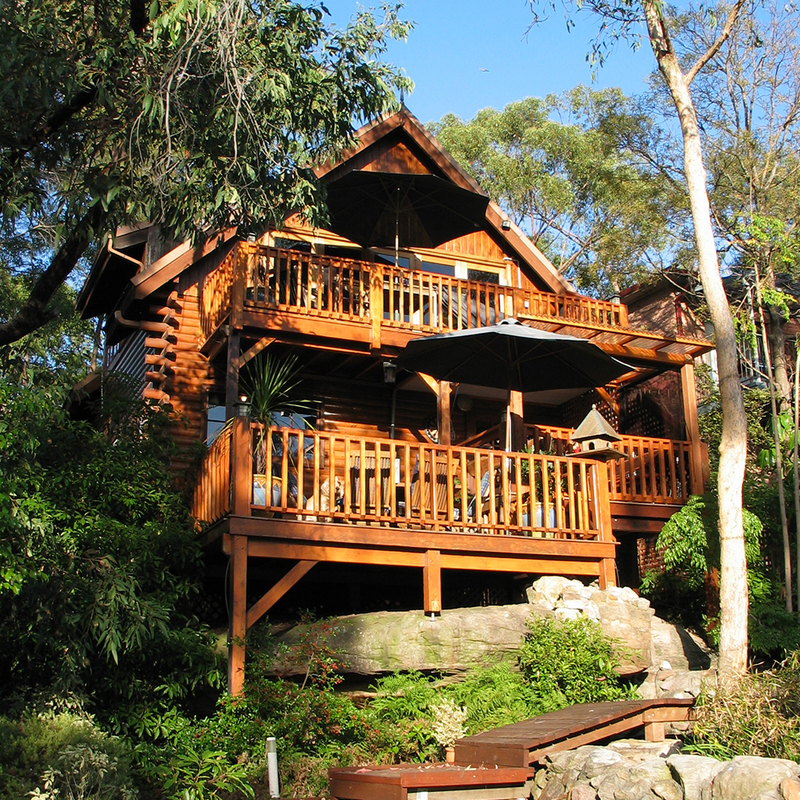 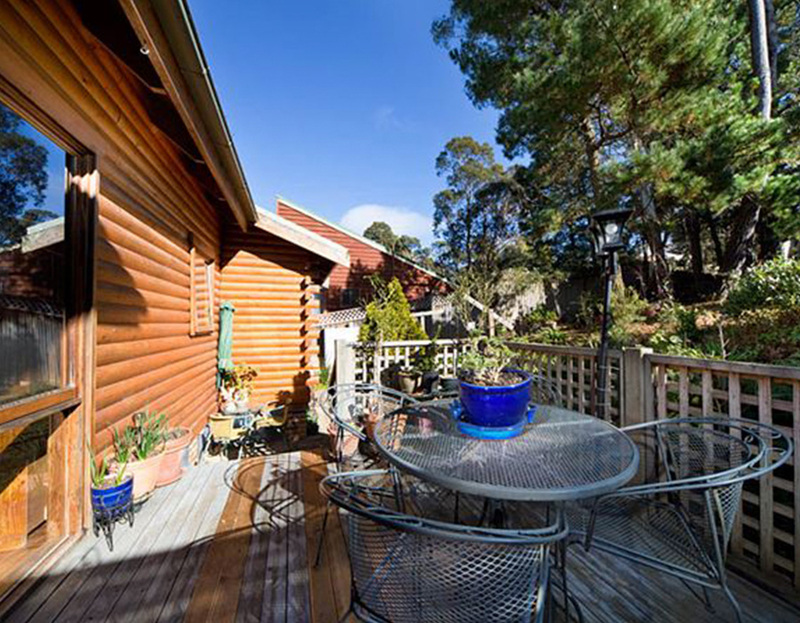 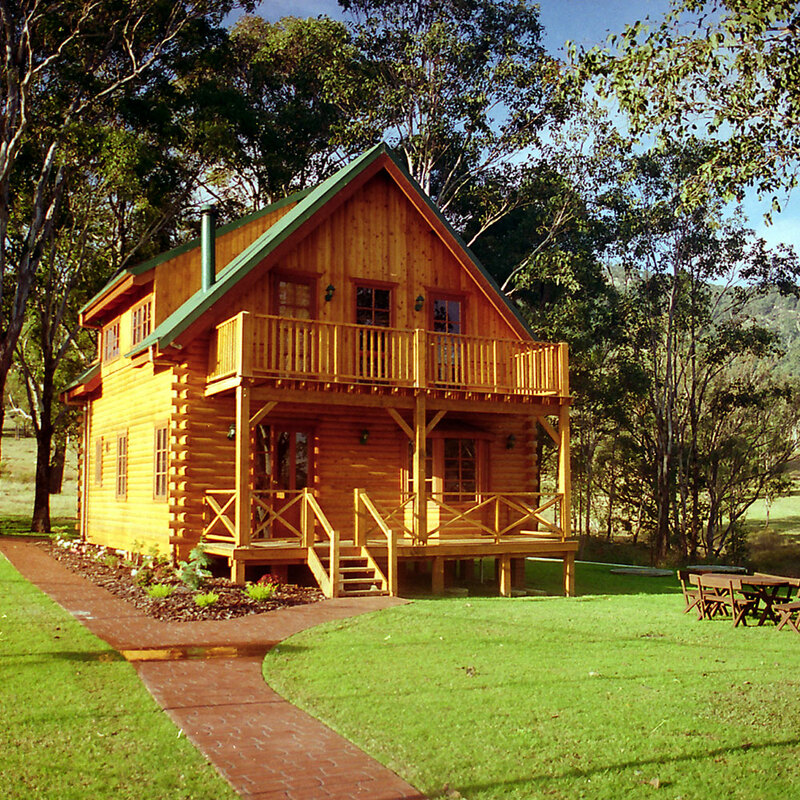 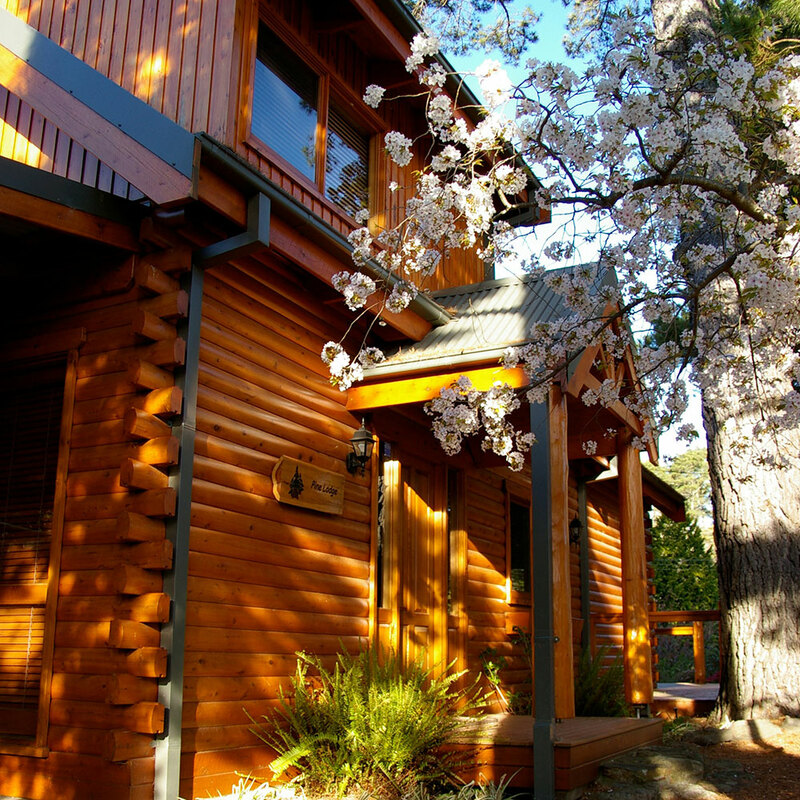 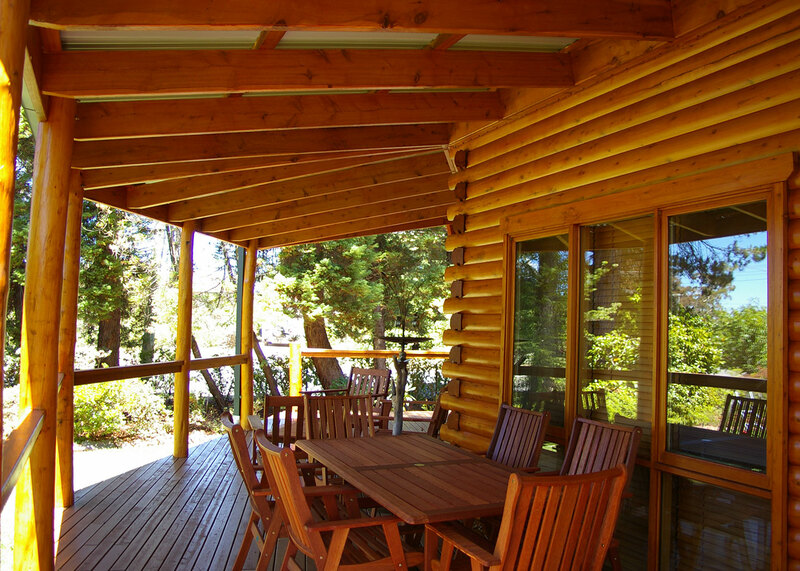 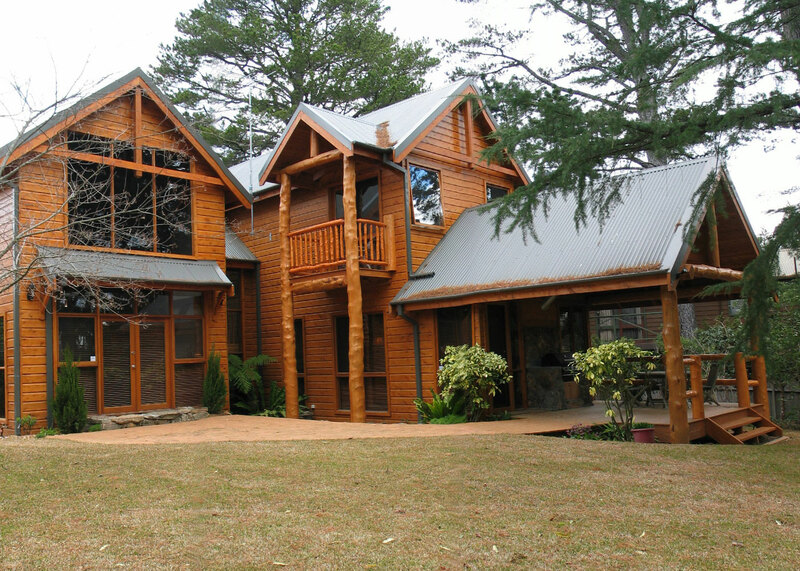 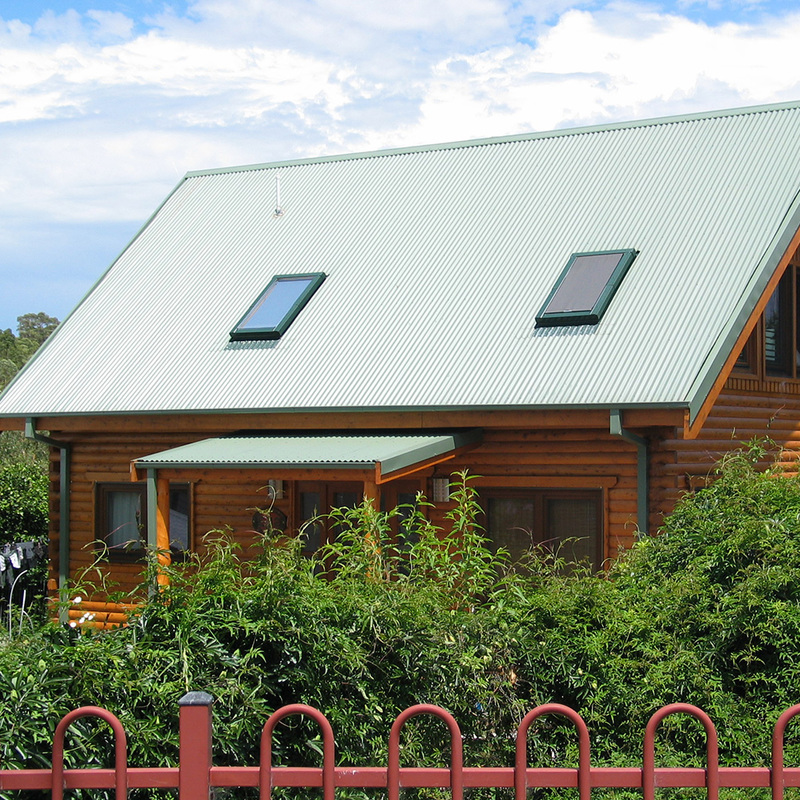 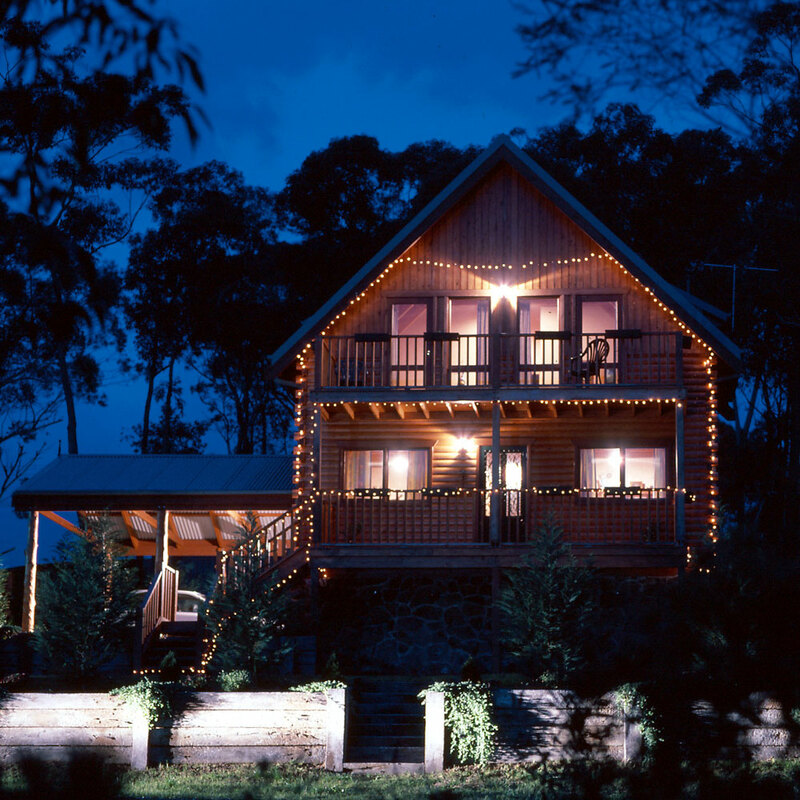 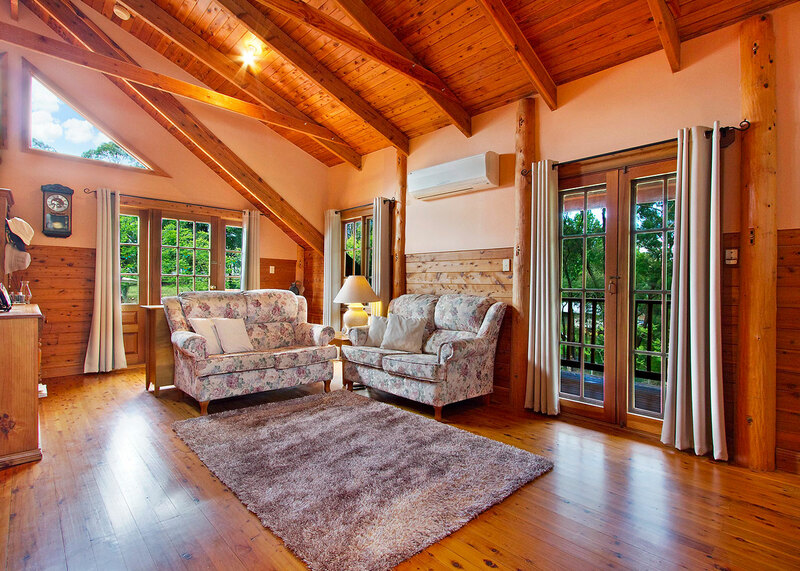 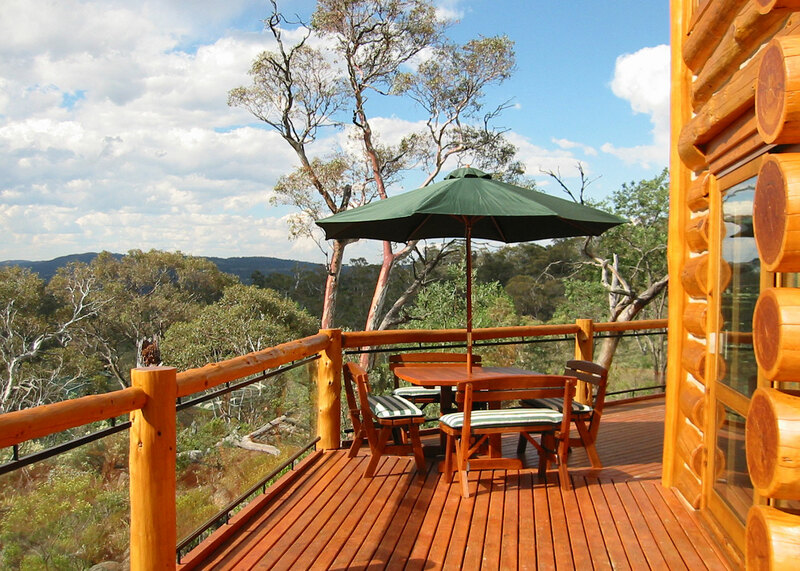 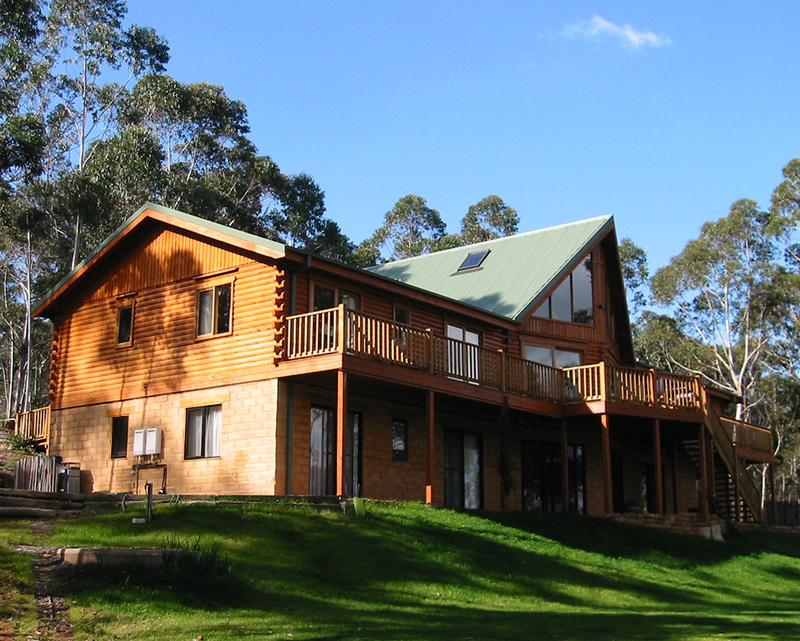 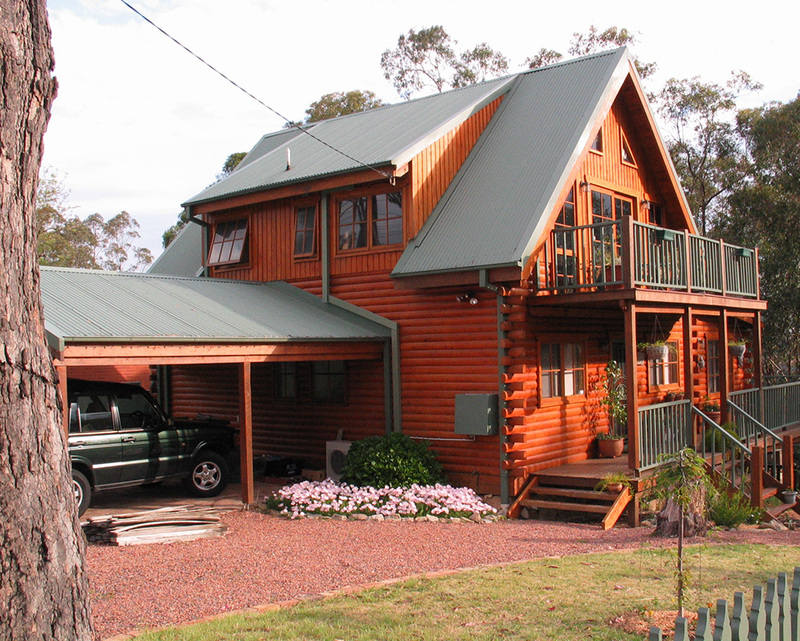 Dargan Springs Mountain Lodge is a resort in the Blue Mountains which provides a healthy retreat for the busy business people for up to 16 guests. 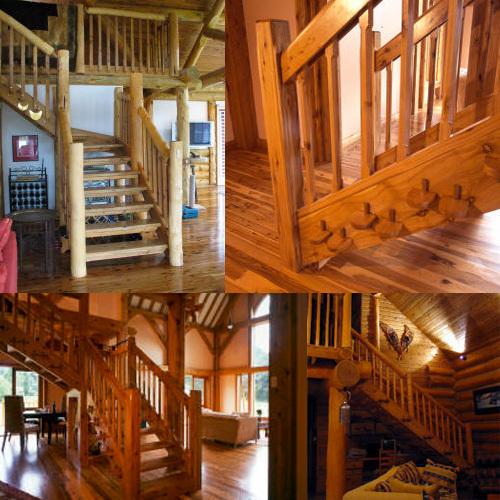 This is a wonderful example of a Caribou style home converted into an 8 bedroom home. 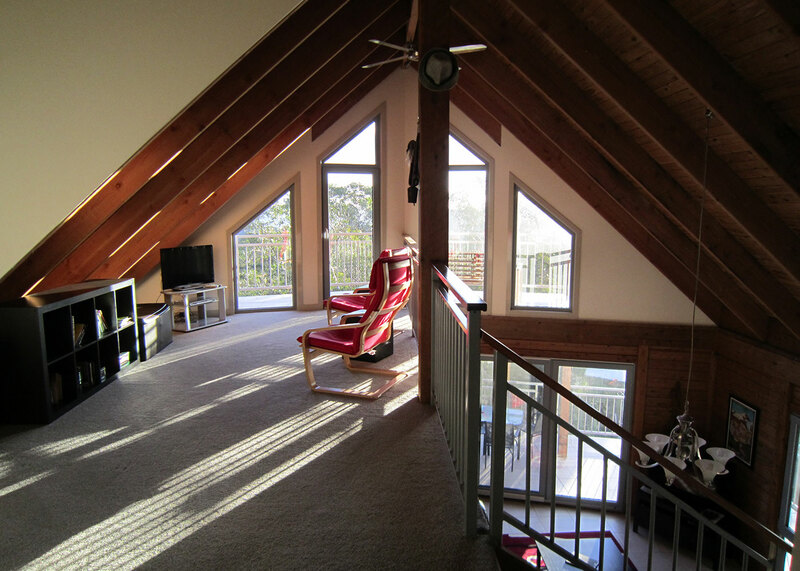 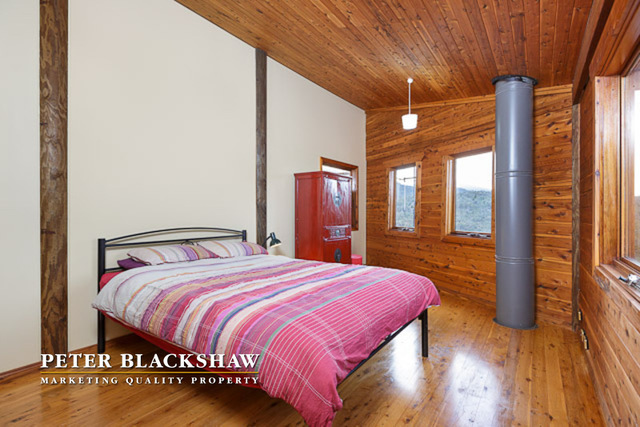 Built on a thermally efficient Timbercrete ground floor, with extensive decks and a cosy loft this building could easily be converted into a large family home. 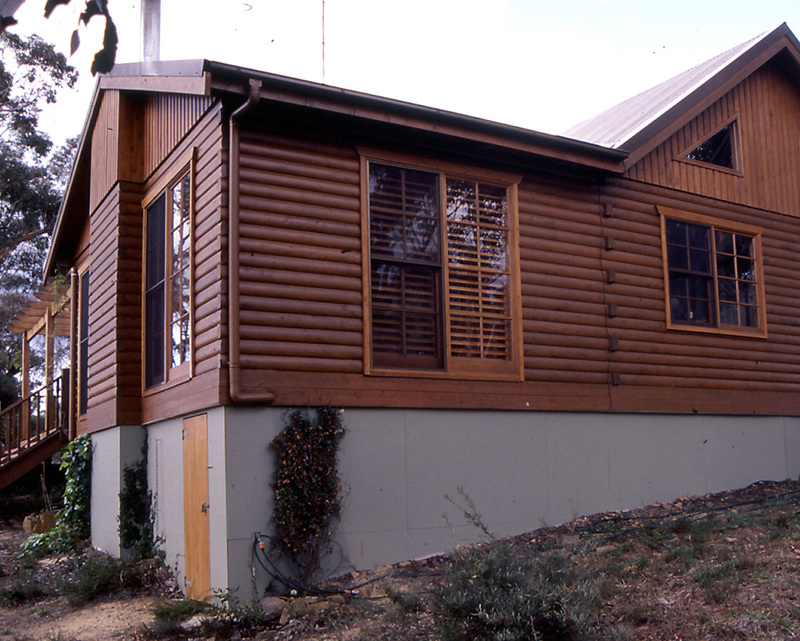 Features in this building are prows on both sides of the building, and a tree removed from the site as a feature post in the living room. 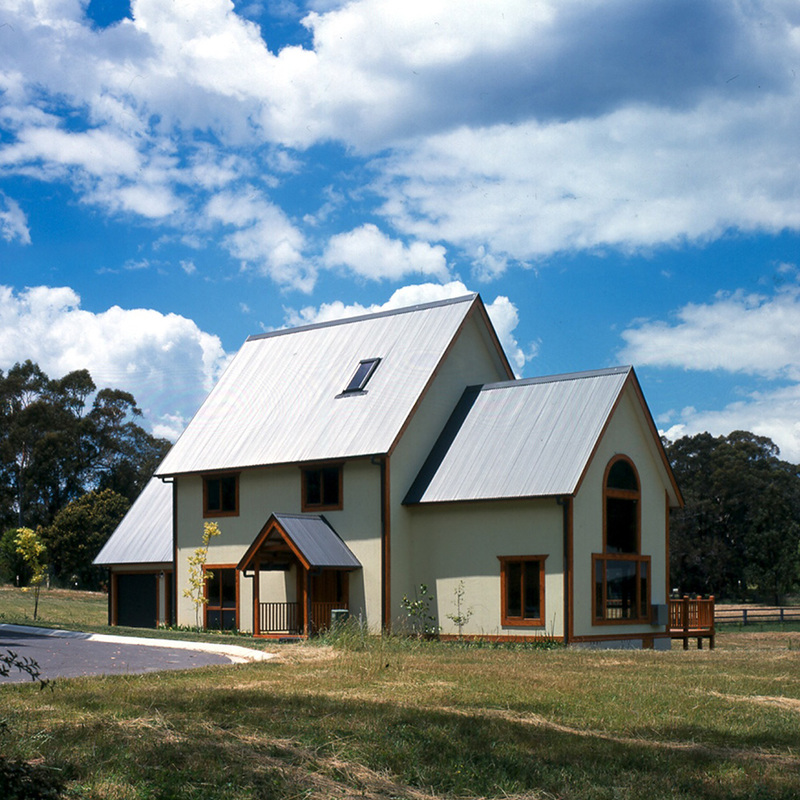 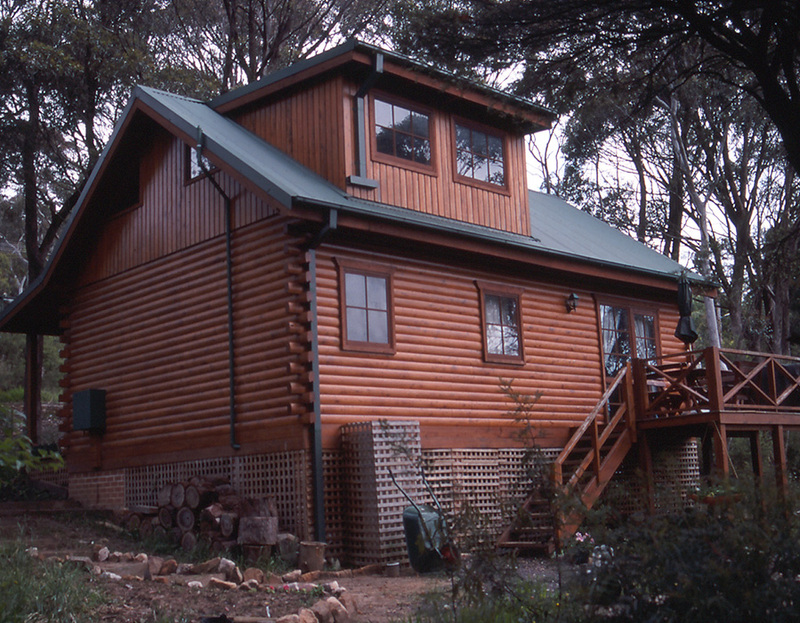 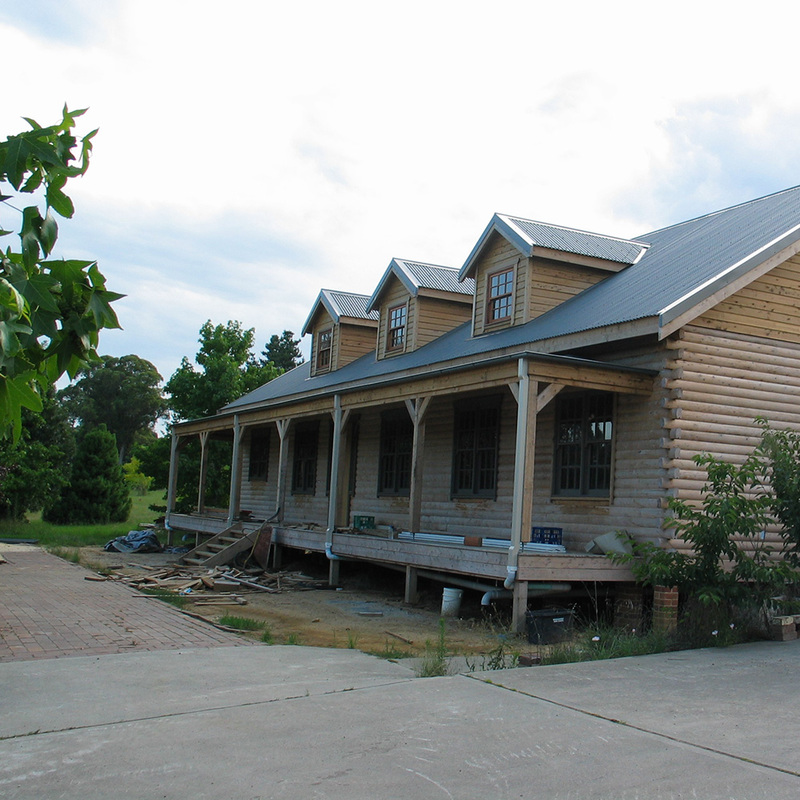 We won the Lithgow Council Best Commercial Design Building Award 2003 for this one. 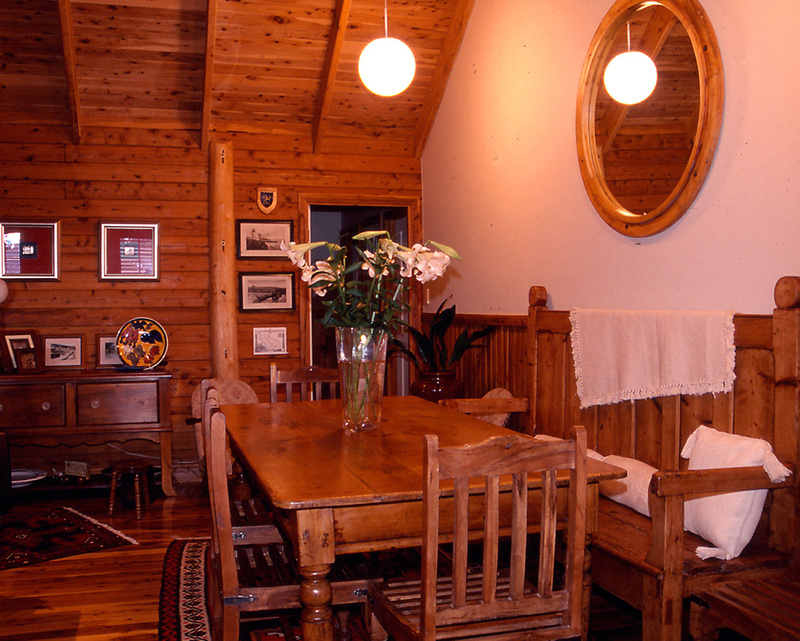 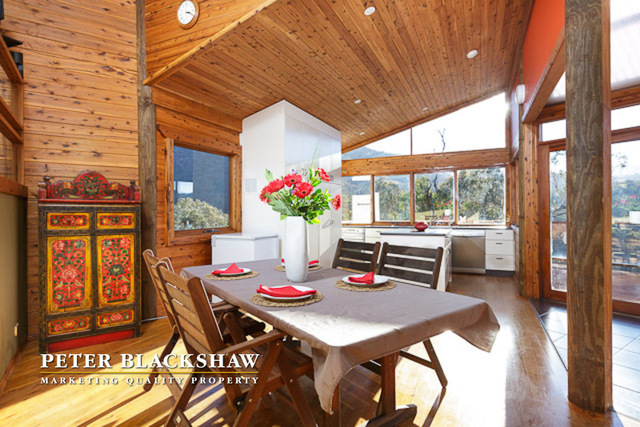 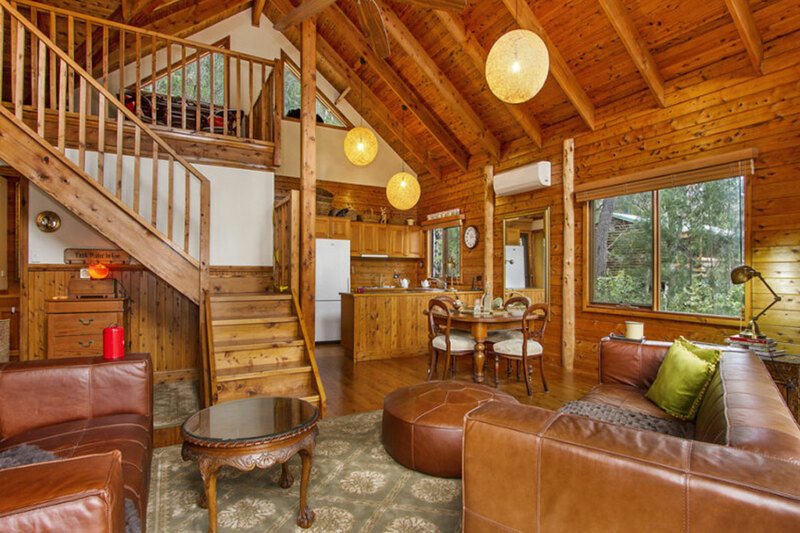 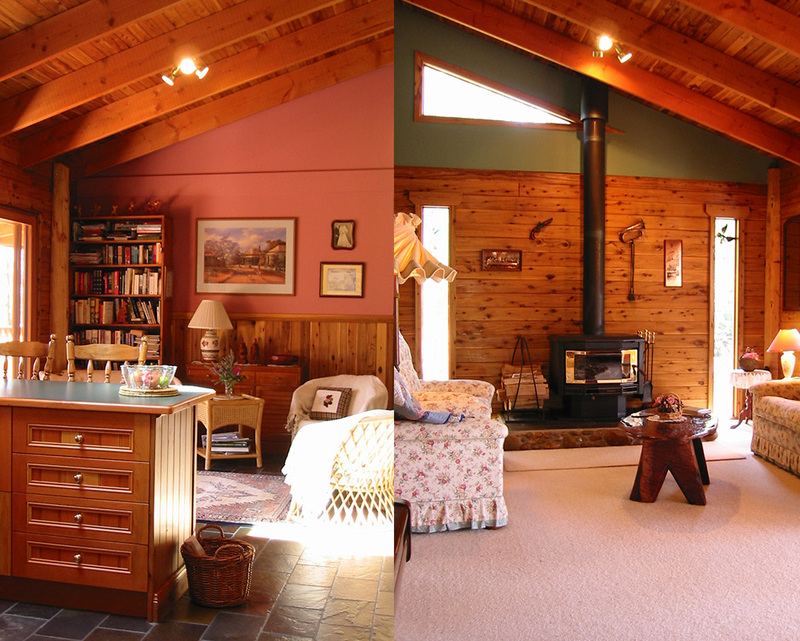 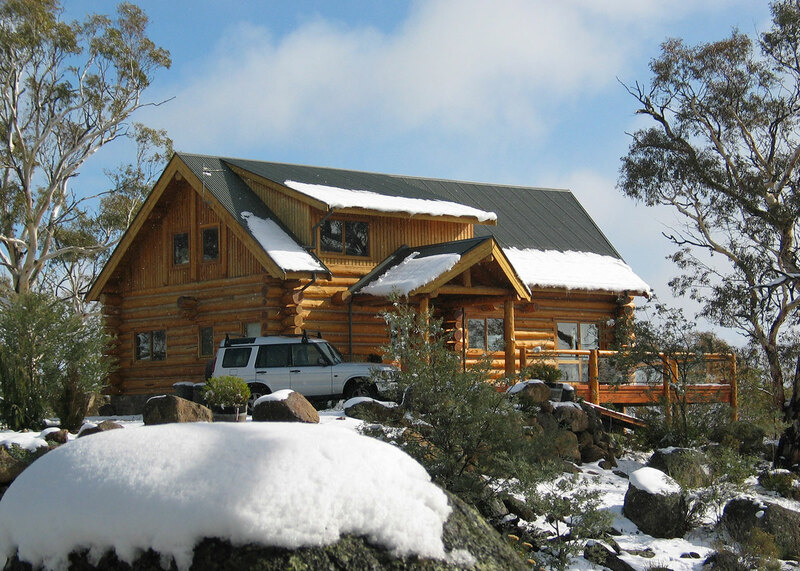 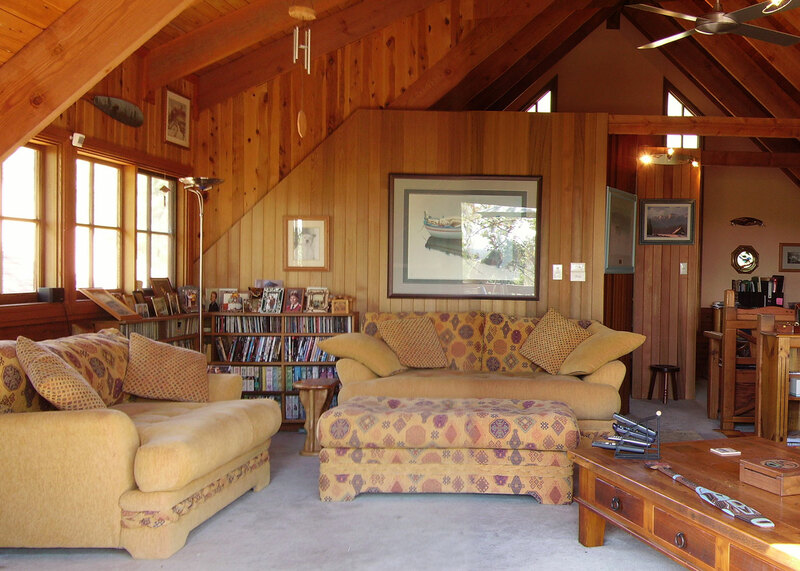 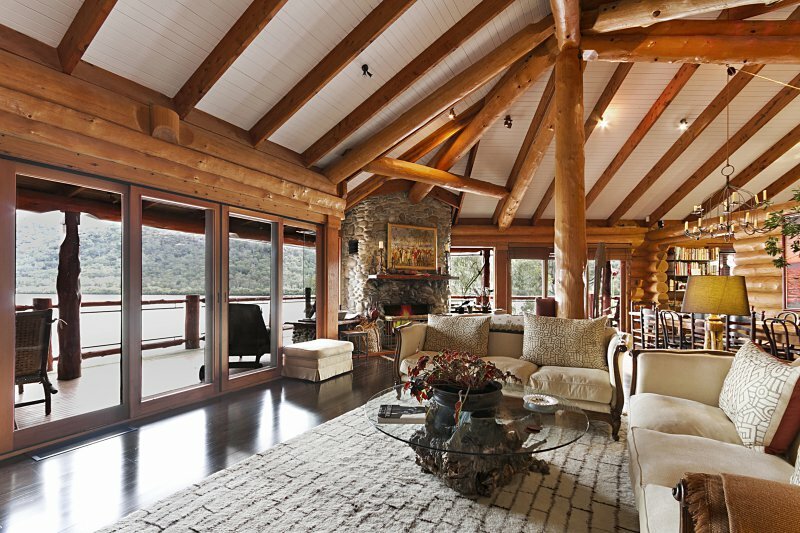 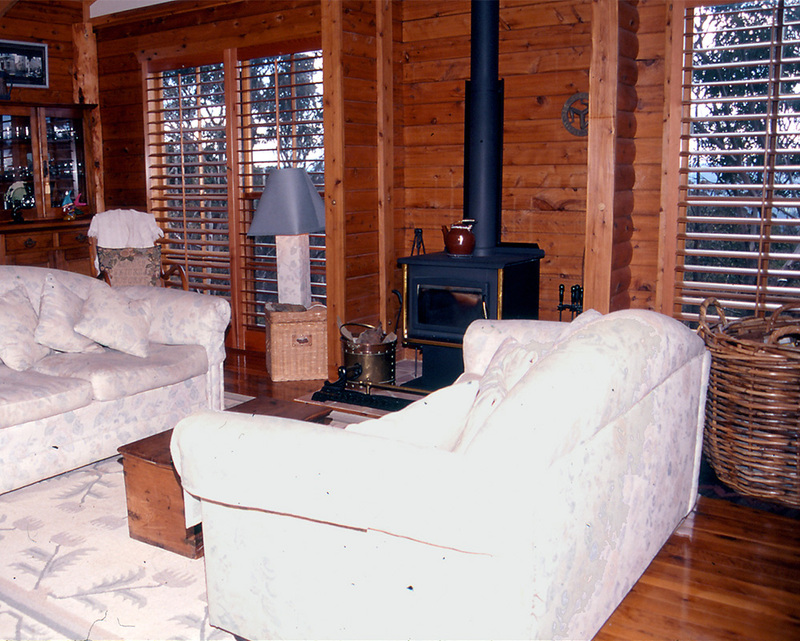 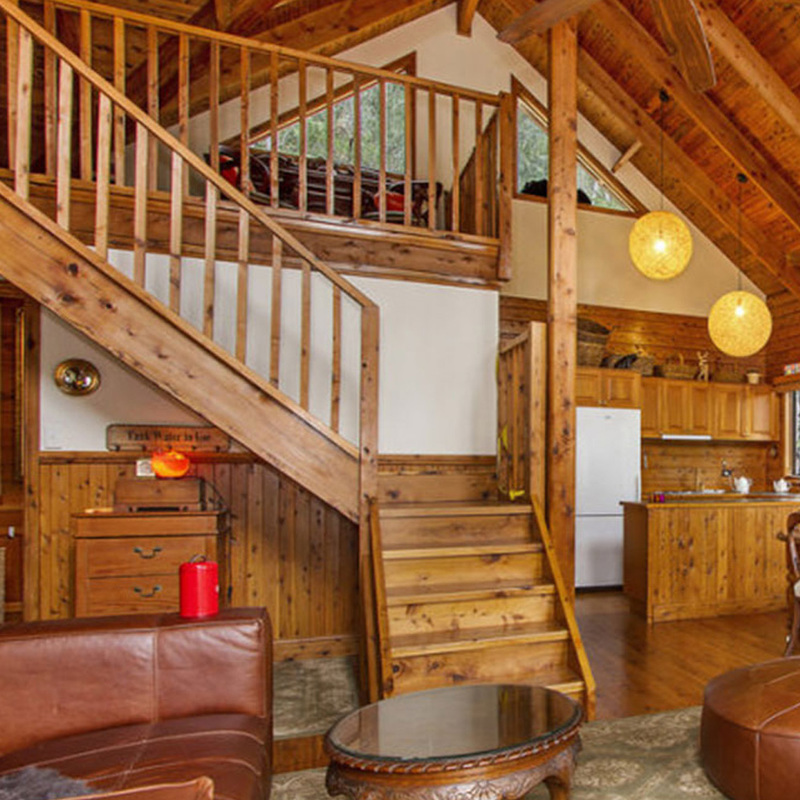 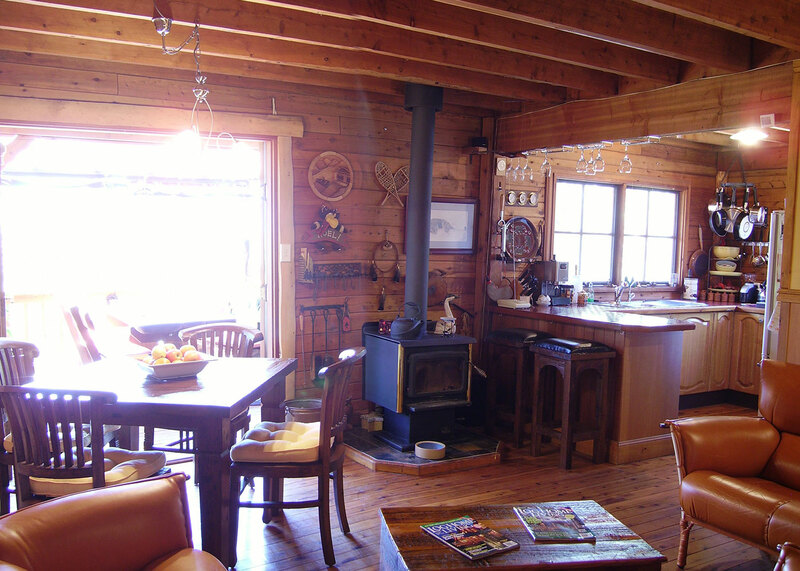 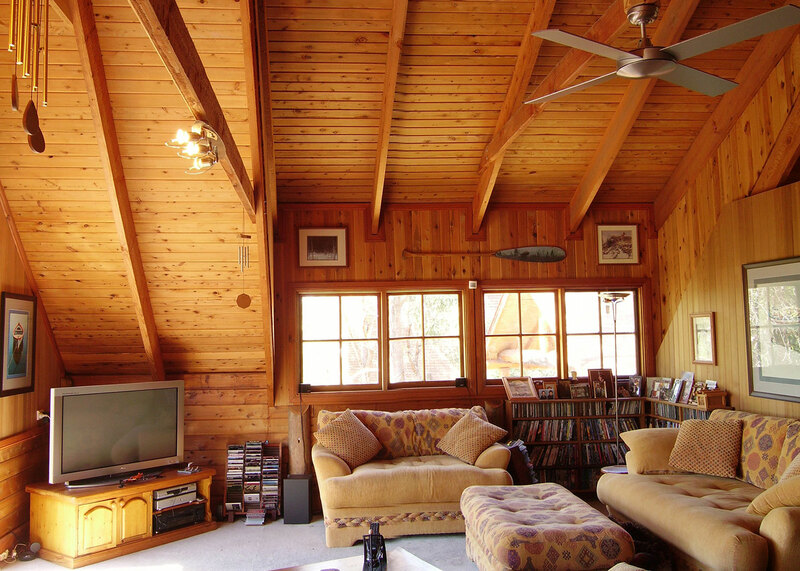 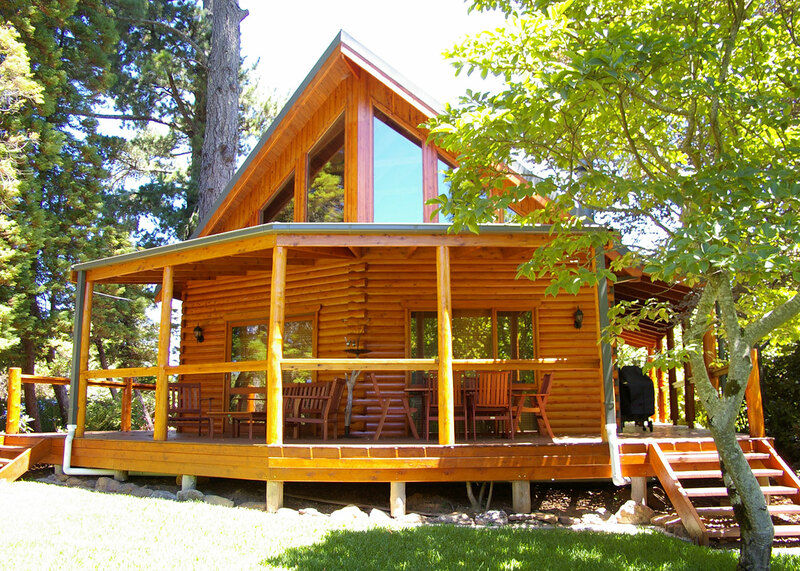 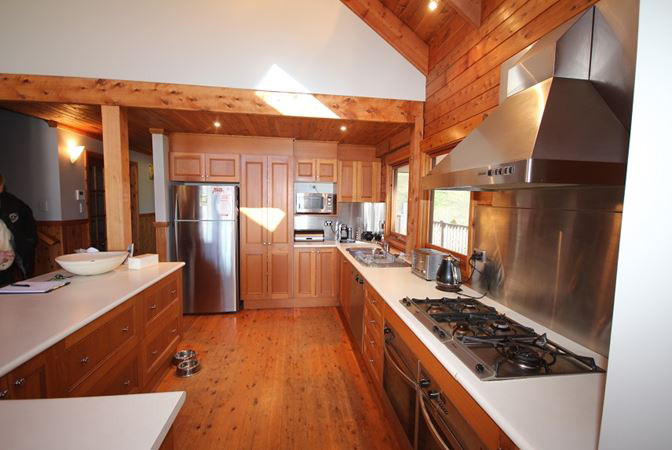 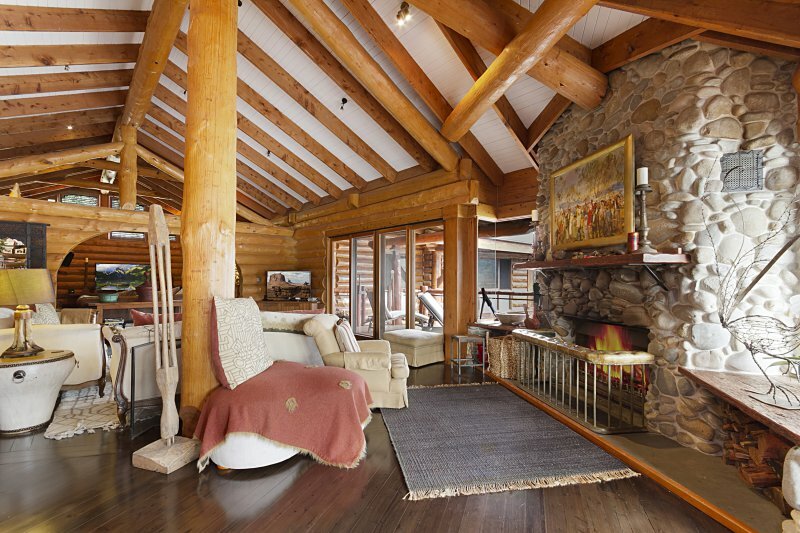 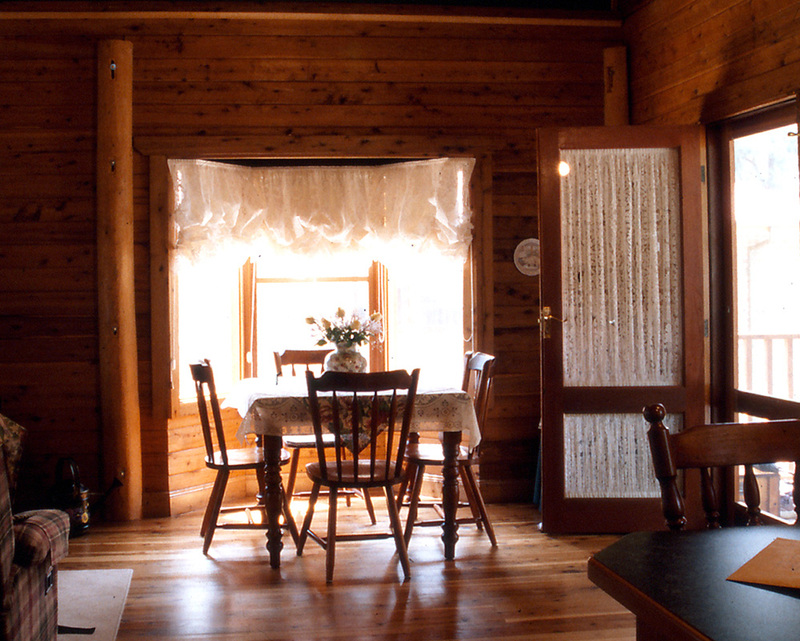 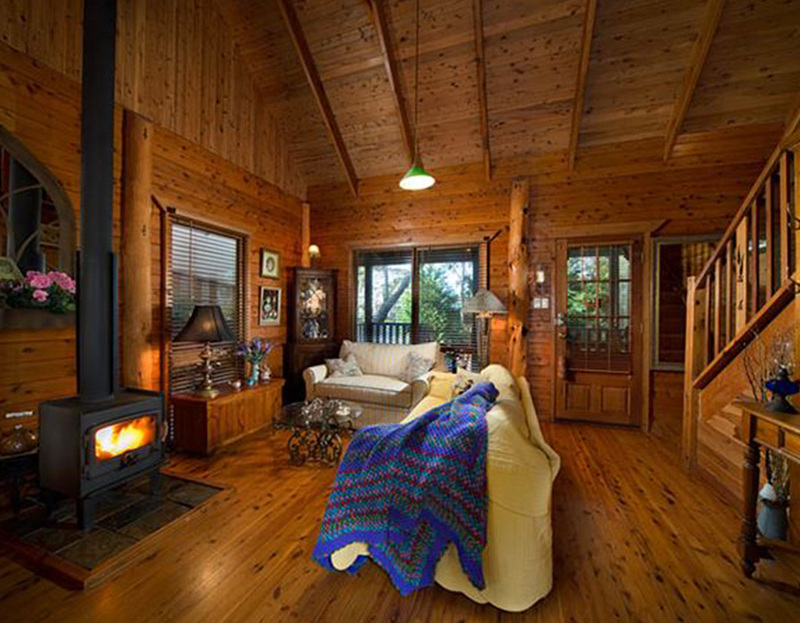 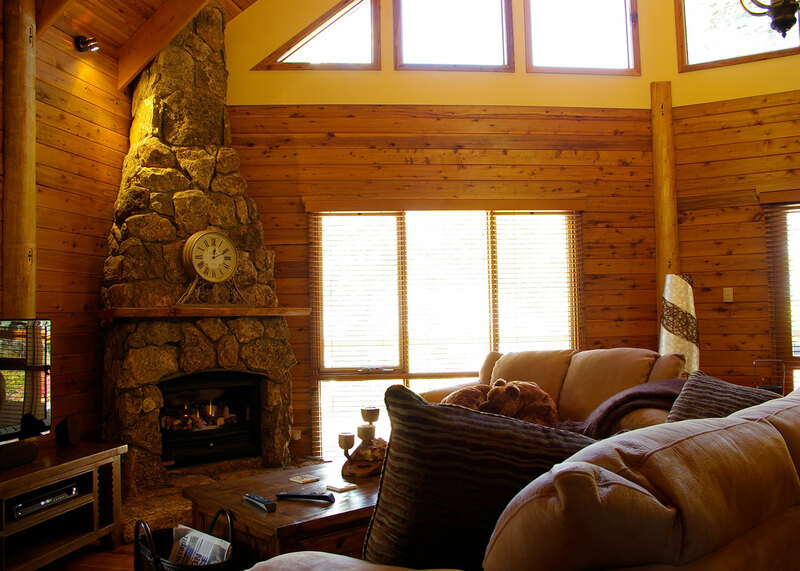 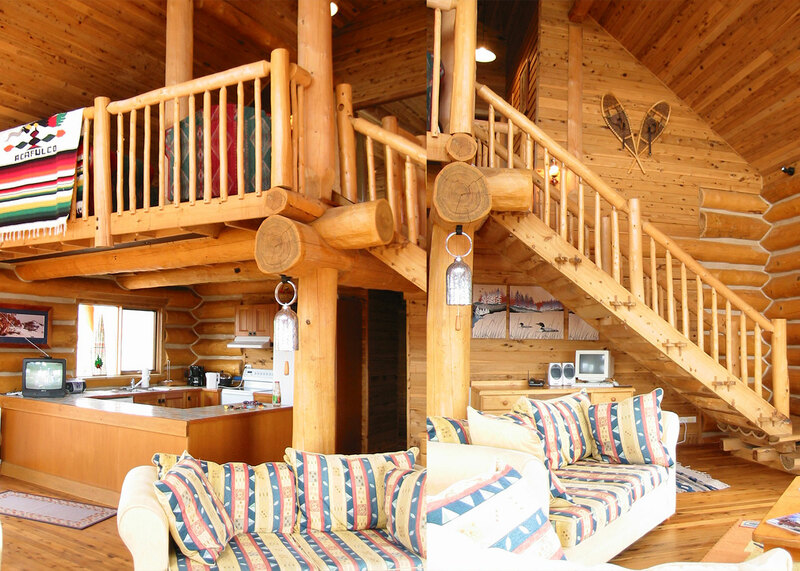 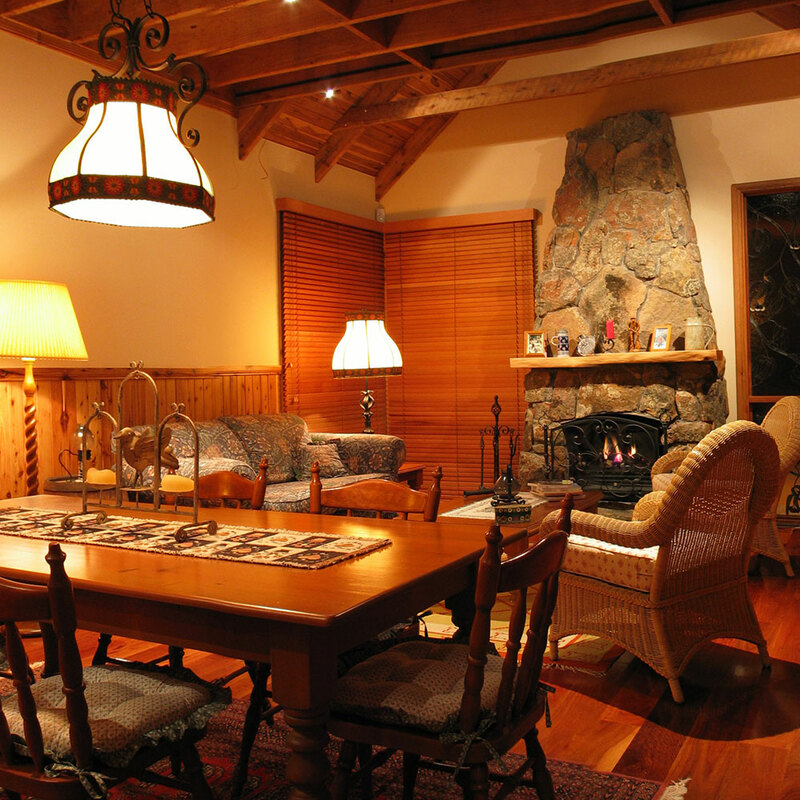 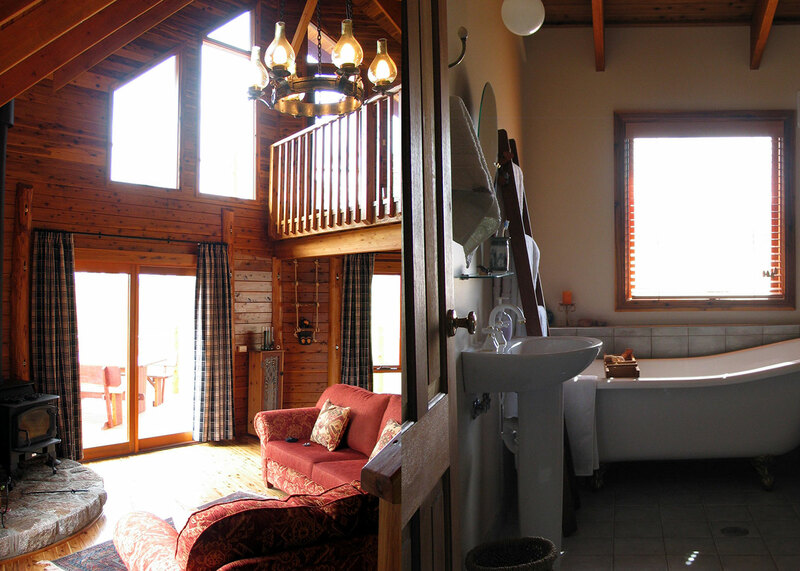 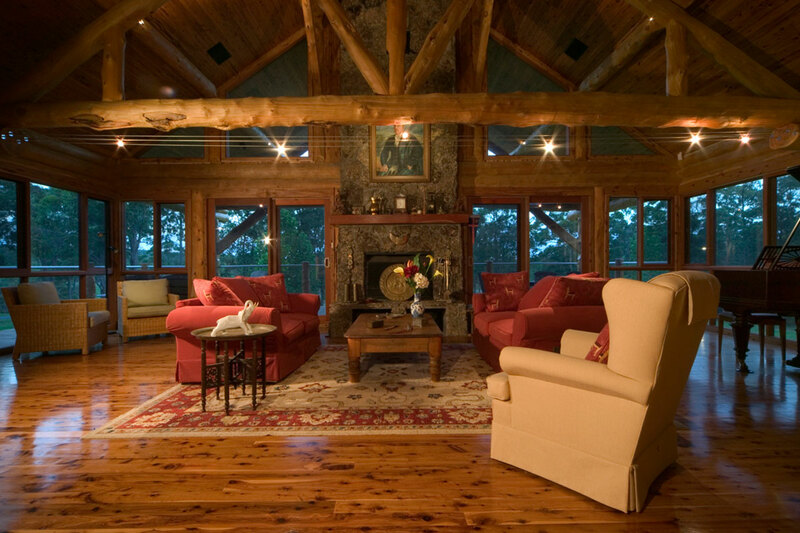 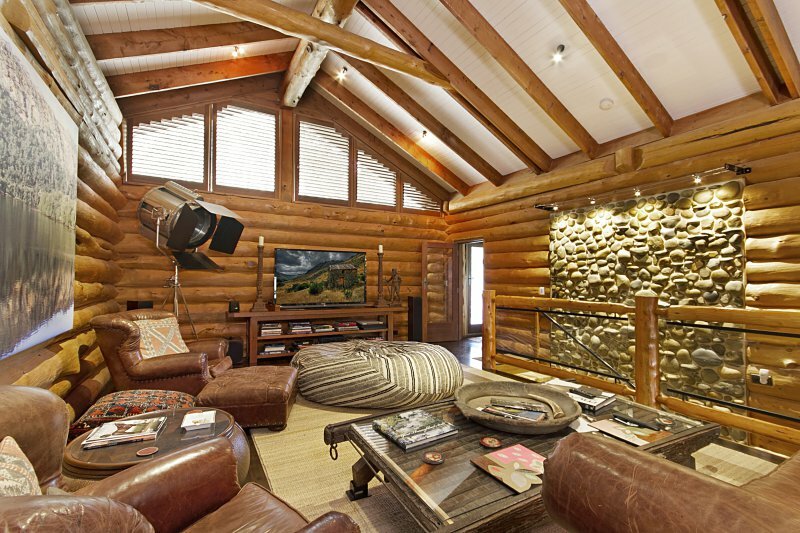 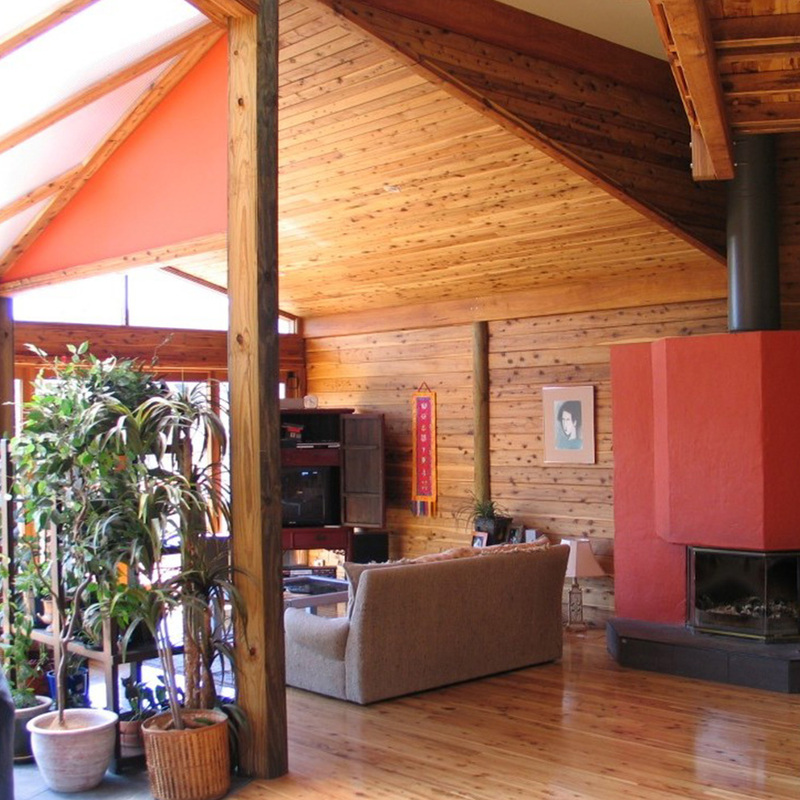 Chilliwack Lodge is a spacious four bedroom version of the Todd Chalet in chink style handcrafted logs. 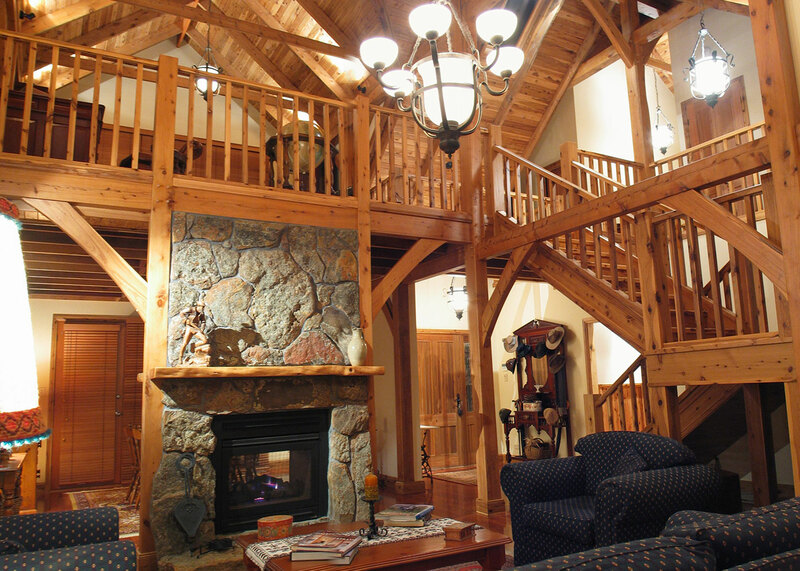 It has the same soaring cathedral ceilings, handcrafted staircase, master bedroom upstairs opening onto the loft TV room. 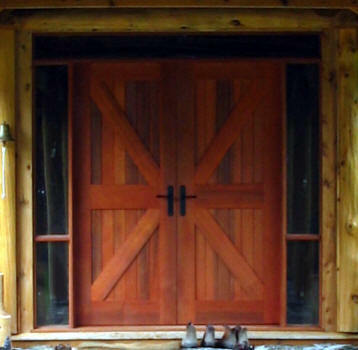 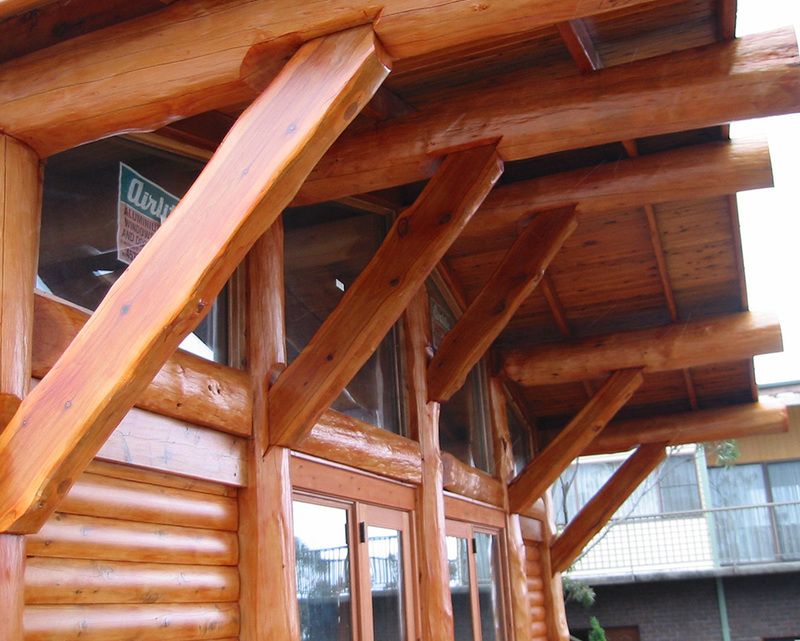 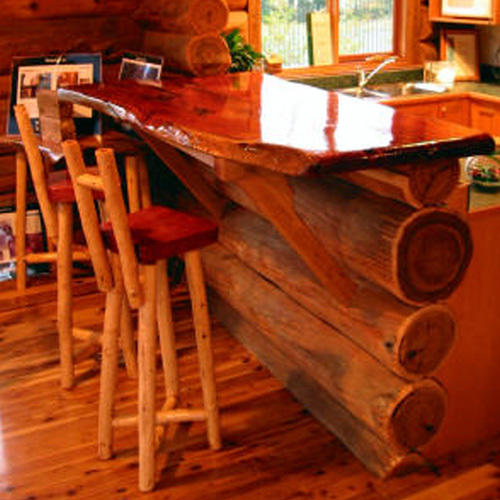 The chink style logs are a more economical way of building a handcrafted home. 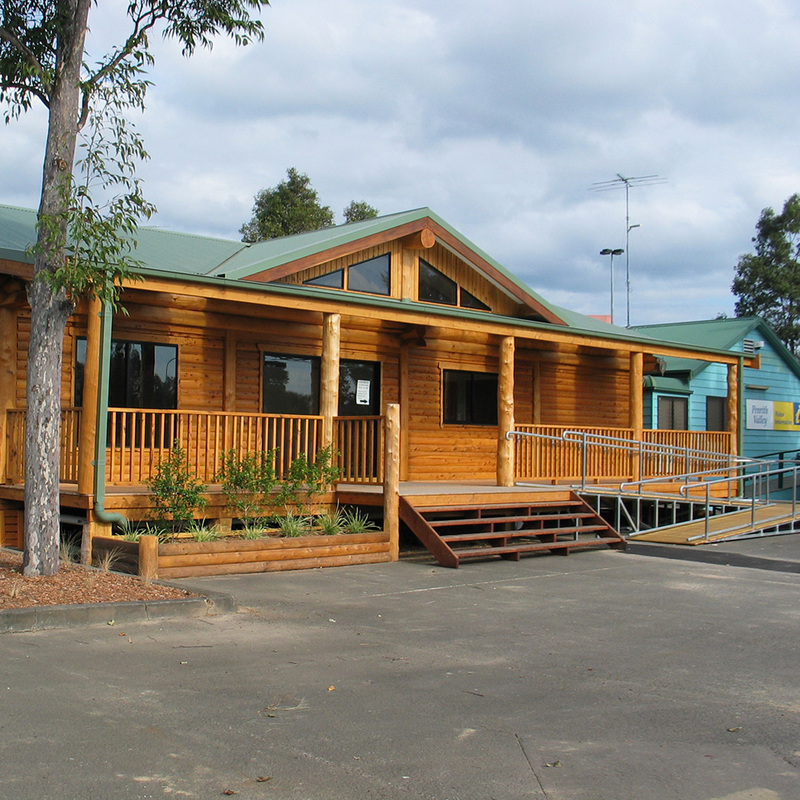 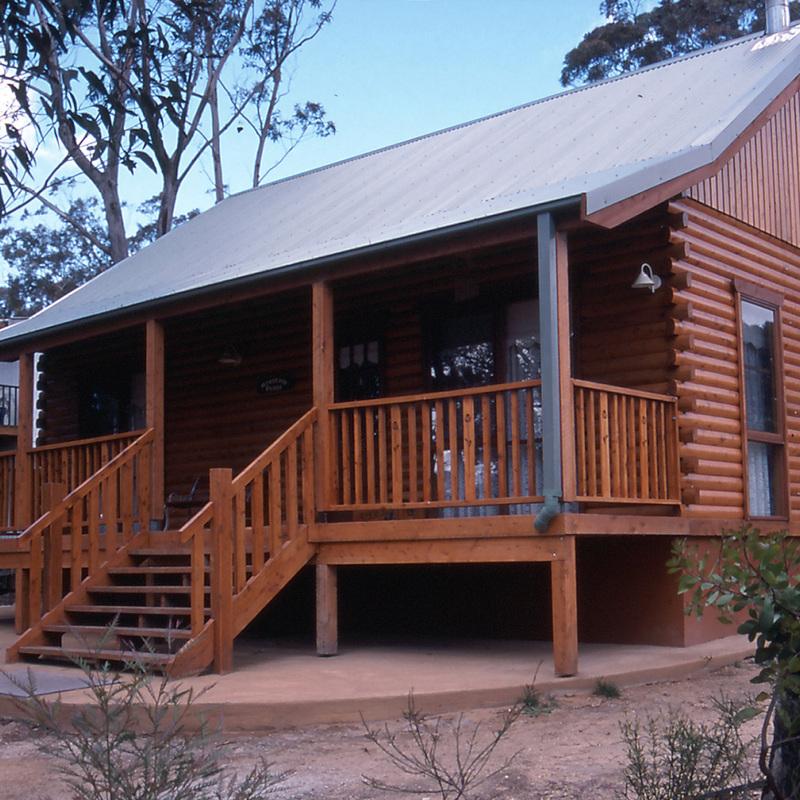 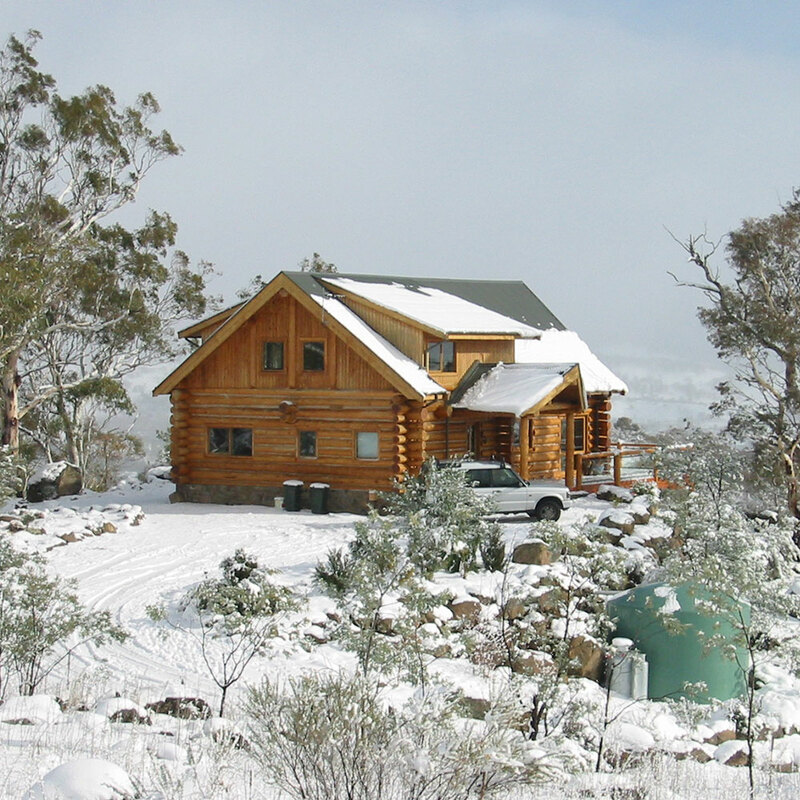 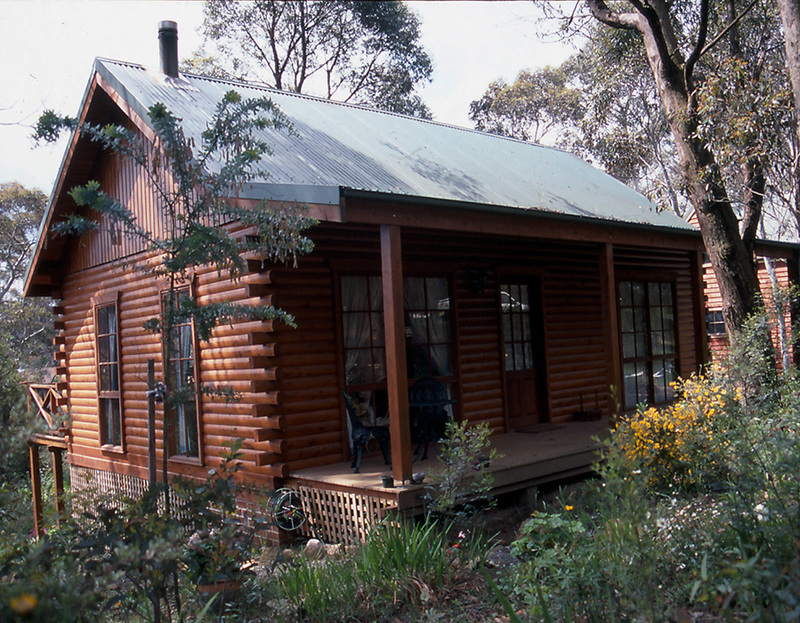 Appalachian Log Homes was the Platinum Sponsor for the Tourist Information Centre built in the Panthers Carpark. 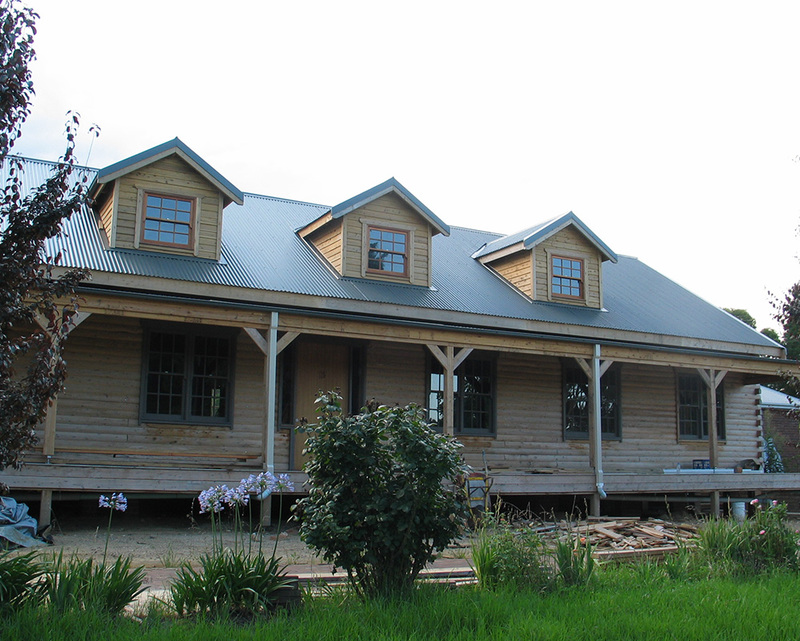 The project was sponsored by a collection of excellent Penrith area businesses and a lot of hard work by the Penrith Valley Economic Development Corporation who are a terrific support for local businesses. 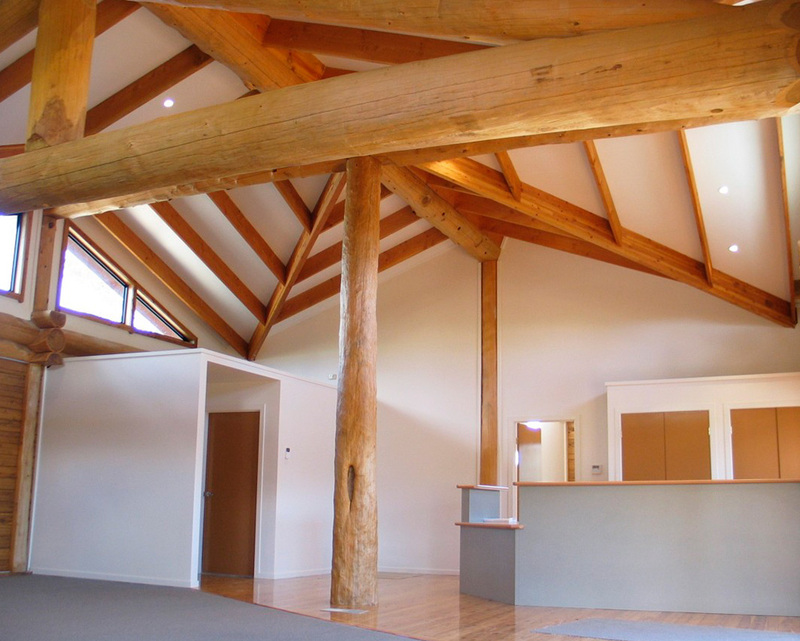 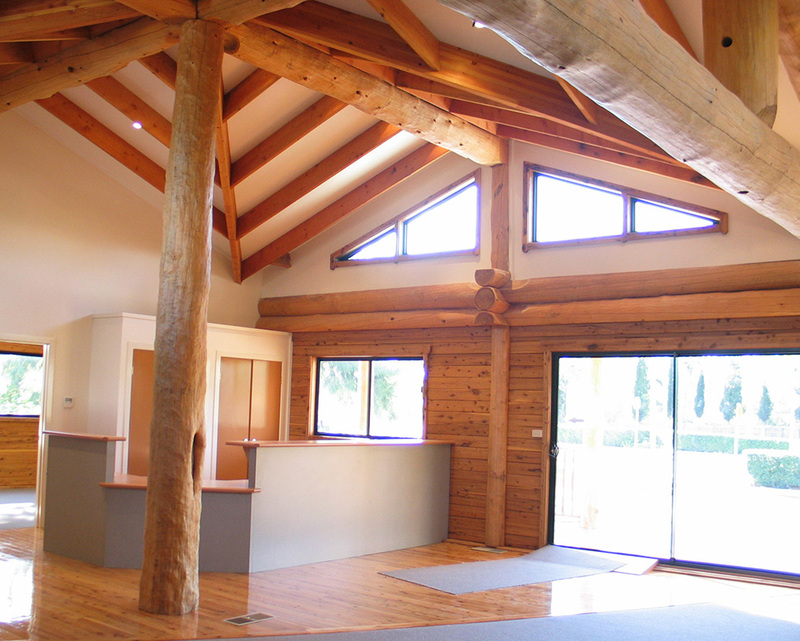 The building is an excellent display of our Post and Beam style construction, and since it is a public building, we can use it as a second display home! 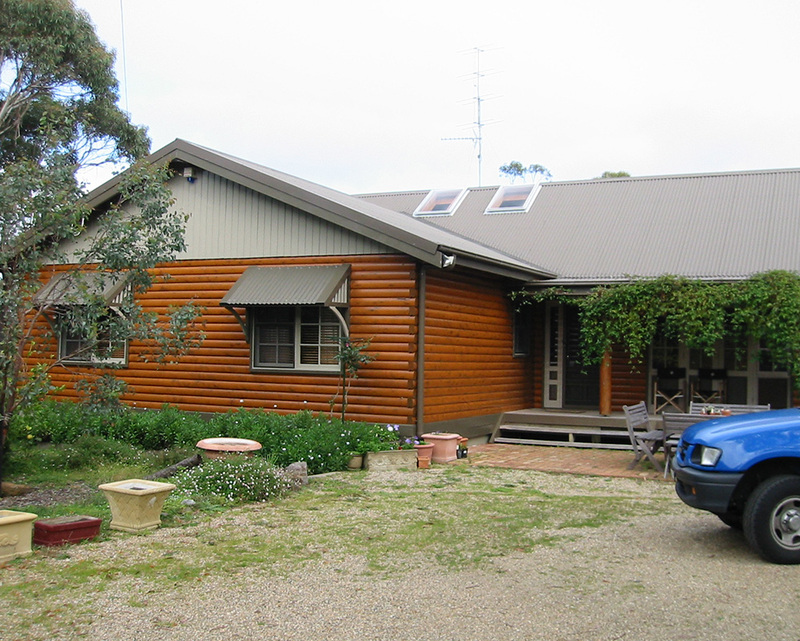 The design can be modified easily to a standard three bedroom home with a wonderful covered verandah. 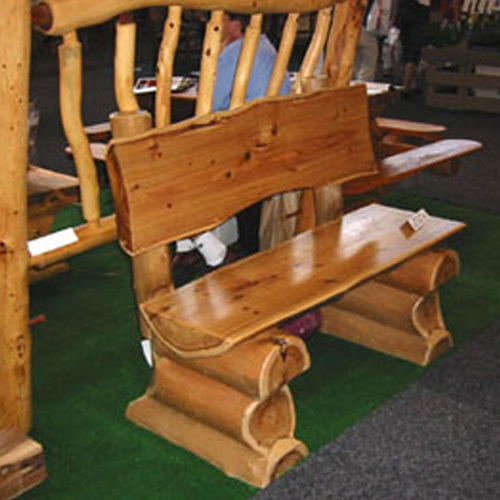 Thank you for your interest in our handcrafted furniture. 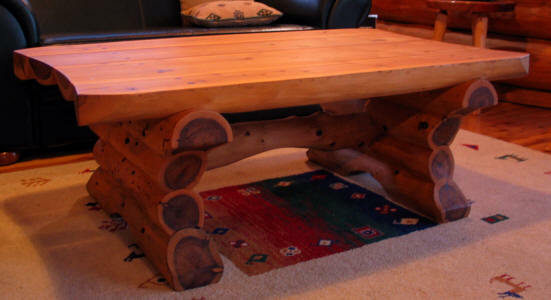 making furniture from cypress, red gum and jarrah. 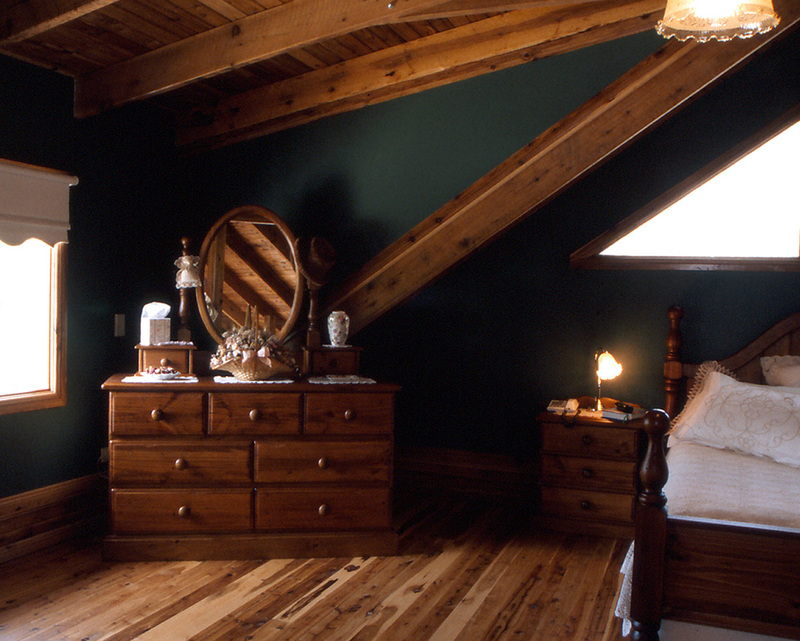 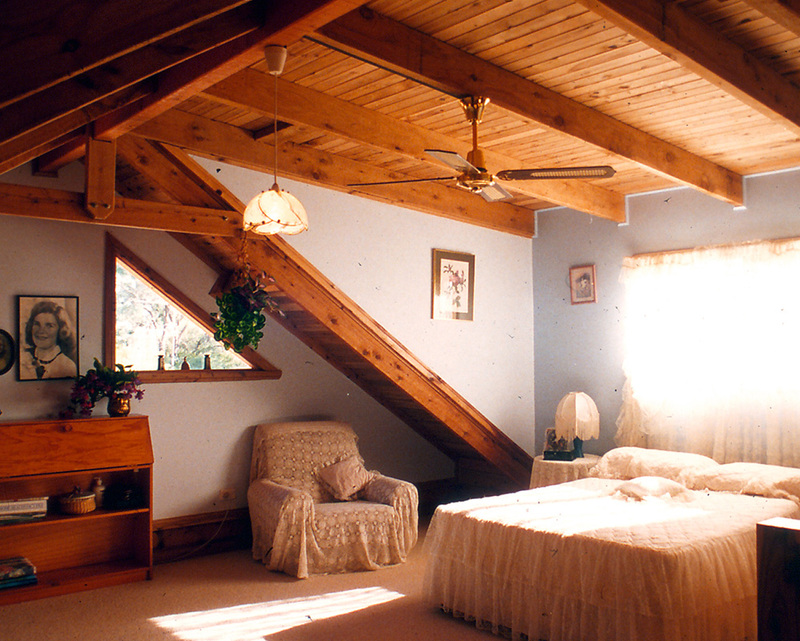 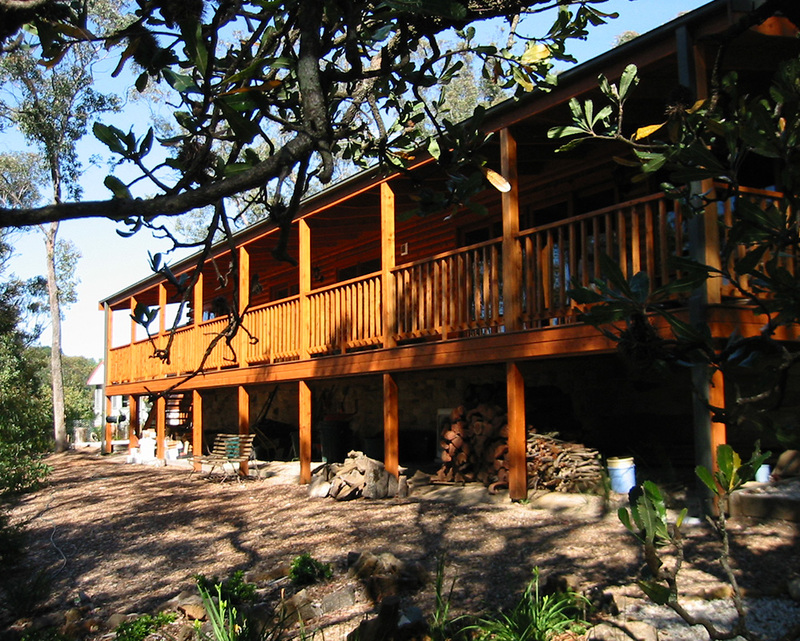 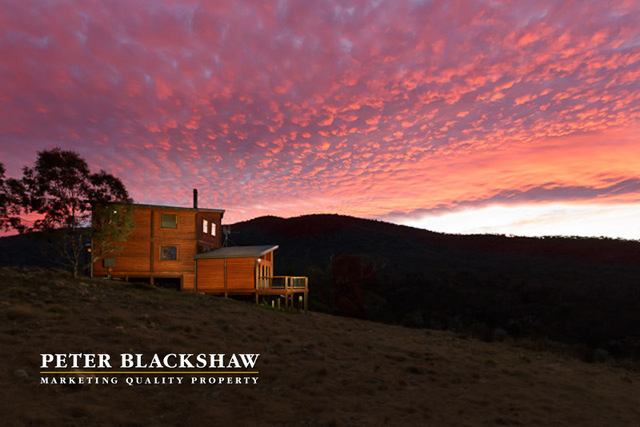 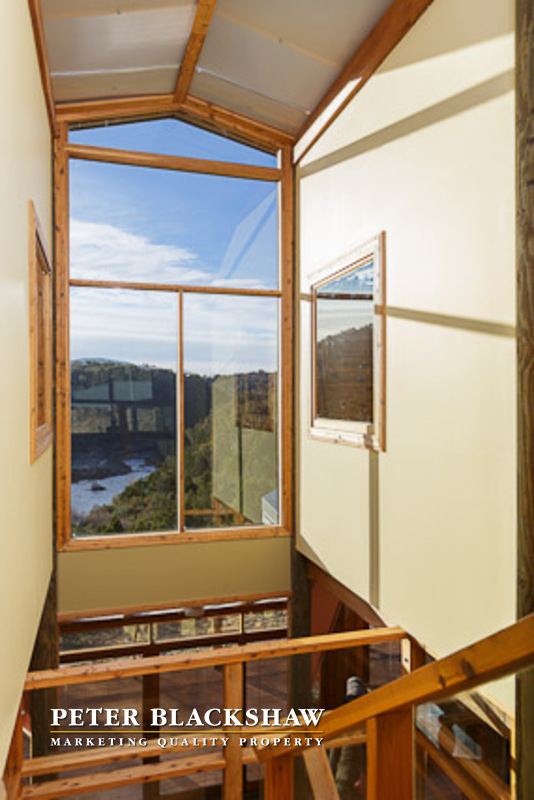 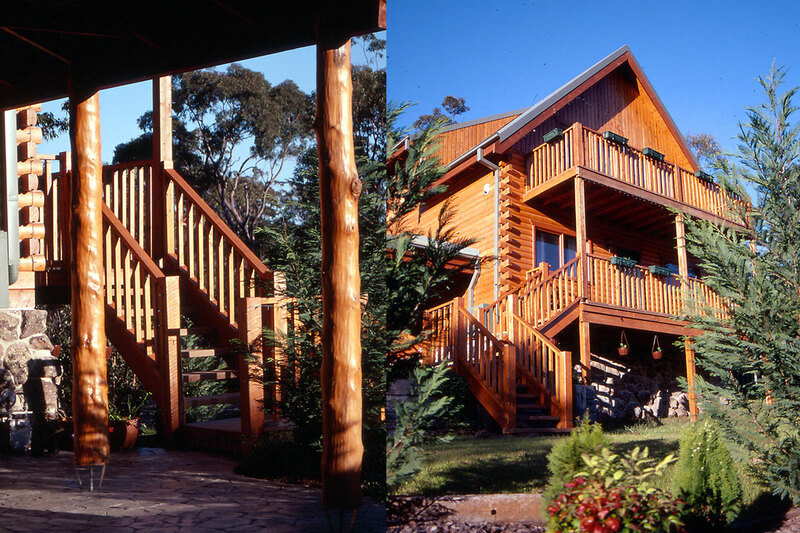 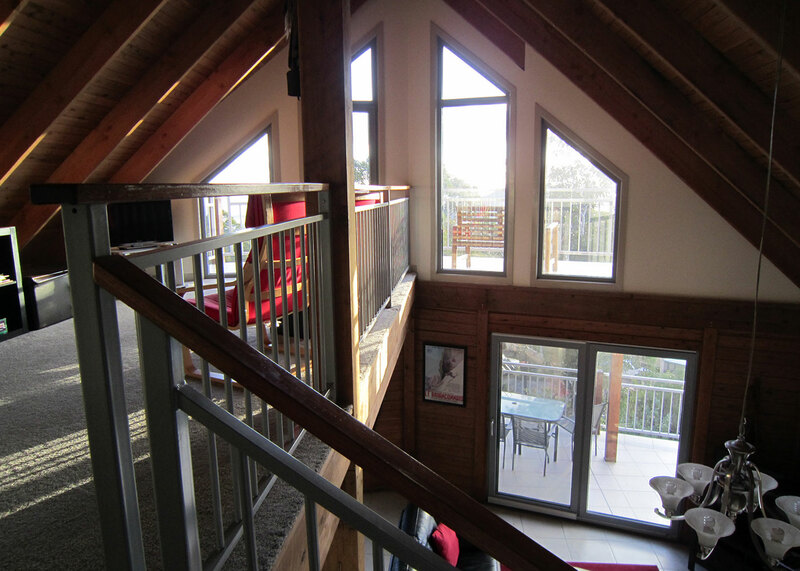 We can build staircases from logs or timber framing, and wonderful ships ladders from a variety of Australian timbers. 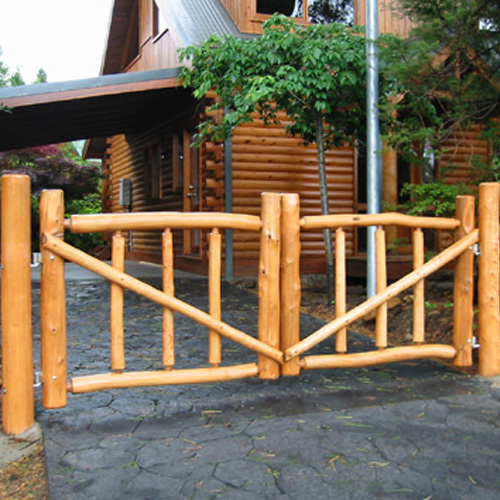 We can build carports, lych gates for a stunning entrance, handcrafted handrailing and various outdoor furniture. 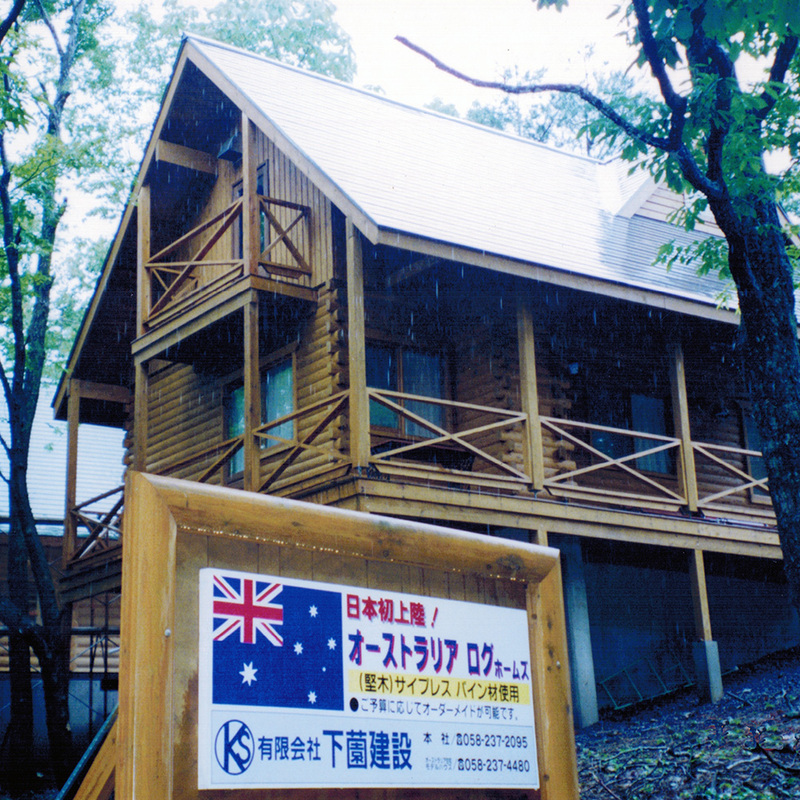 Made and built in Australia and exported around the world.